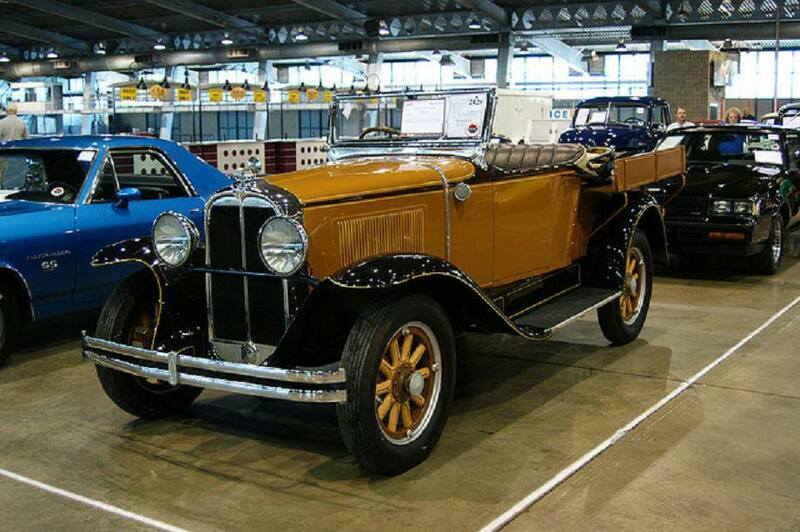 Pontiac was an American automobile brand established in 1926 as a companion make for General Motors‘ Oakland. Quickly overtaking its parent in popularity, it supplanted the Oakland brand entirely by 1933 and, for most of its life, became a companion make for Chevrolet. 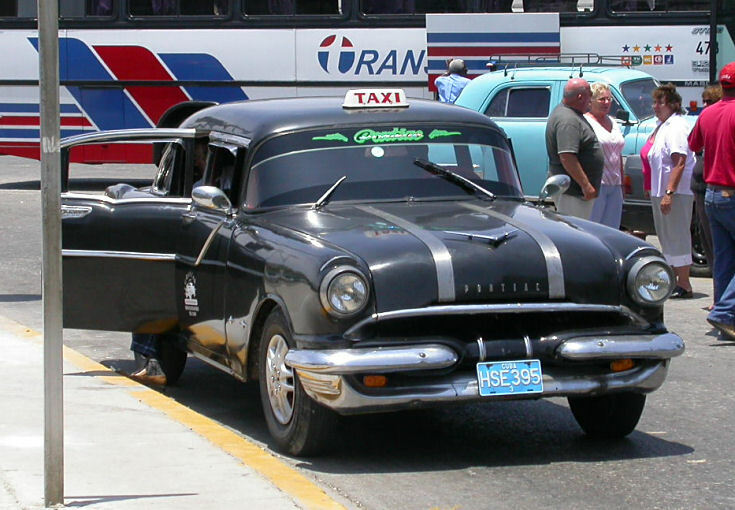 Pontiac was sold in the United States, Canada, and Mexico by General Motors (GM). 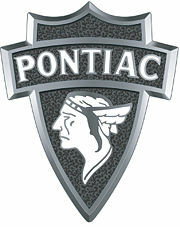 Pontiac was marketed as the performance division of General Motors for many years, specializing in mainstream performance vehicles. 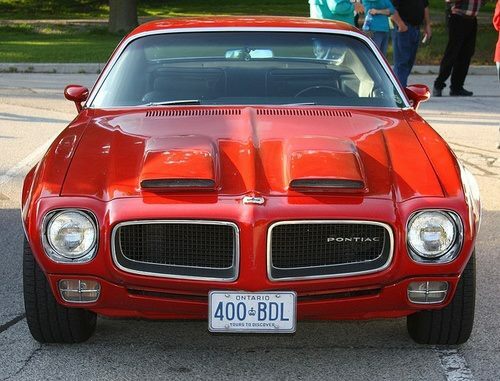 Pontiac was relatively more popular in Canada, where for much of its history it was marketed as a low-priced vehicle. On April 27, 2009, amid ongoing financial problems and restructuring efforts, GM announced it would discontinue the Pontiac brand by the end of 2010 and focus on four core brands in North America: Chevrolet, Buick, Cadillac and GMC. The last Pontiacs were built in December 2009. 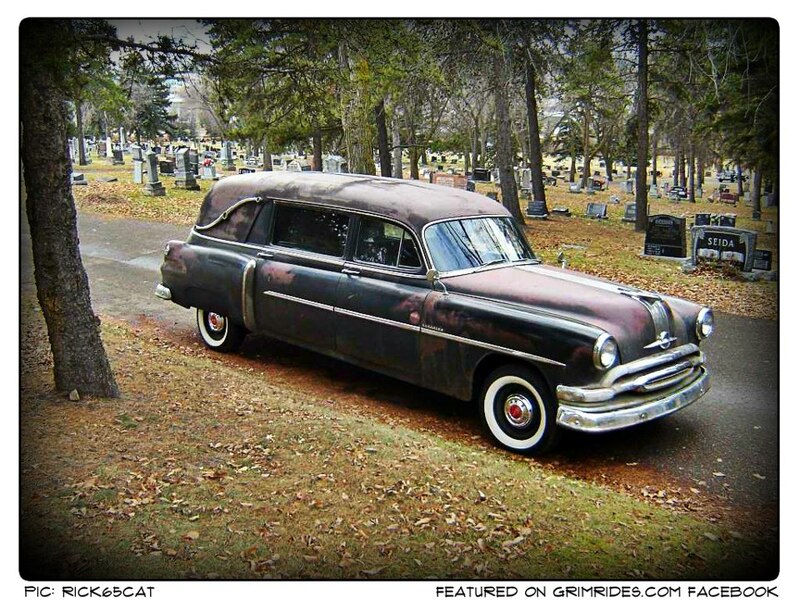 Pontiac started in 1893 as “The Pontiac Buggy Company”. The Pontiac Spring and Wagon Works was incorporated in July 1899 by Albert G. North and Harry G. Hamilton. 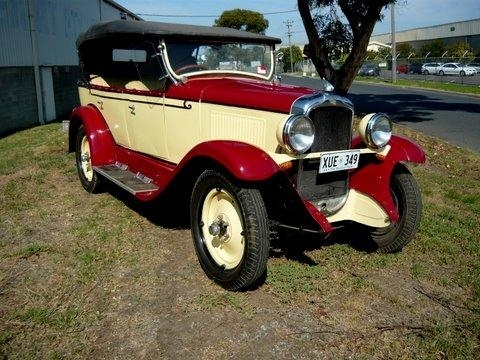 By 1905 they had taken over the manufacturing of the Rapid Truck (from the Rapid Motor Vehicle Co.) that had been introduced two years earlier. In 1907 they decided to produce an automobile. 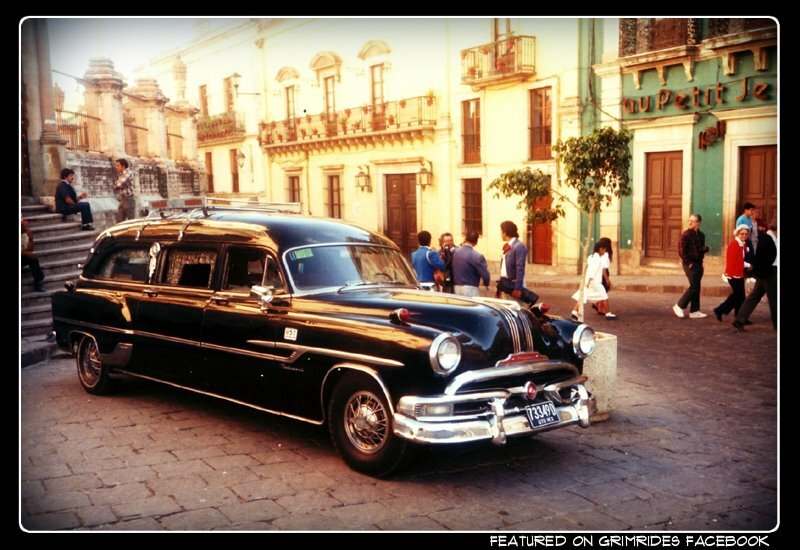 The first Pontiac Spring and Wagon Works automobile, simply named “The Pontiac” was introduced that fall by the Pontiac Spring & Wagon Works. It was a highwheeler weighing 1,000 pounds (450 kg) and powered by a two-cylinder water-cooled 12 hp (8.9 kW) engine. A prototype was displayed in October 1907 at an exhibition sponsored by the Carriage Dealers’ Association in New York City’s Grand Central Palace. 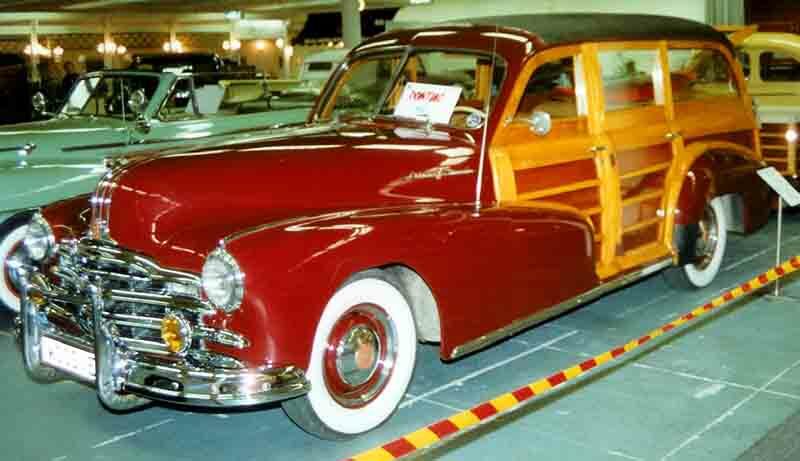 In December of the same year several of the new Pontiacs were exhibited at the Chicago Automobile Show. Well received by the press, the car featured final drive by double chain and a friction transmission. 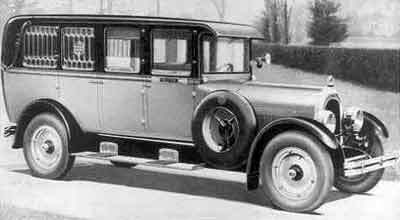 The wheelbase was 70 inches (1,800 mm), front wheels 38, with 40s in the rear, and solid rubber tires. The first deliveries were probably made in early 1908. 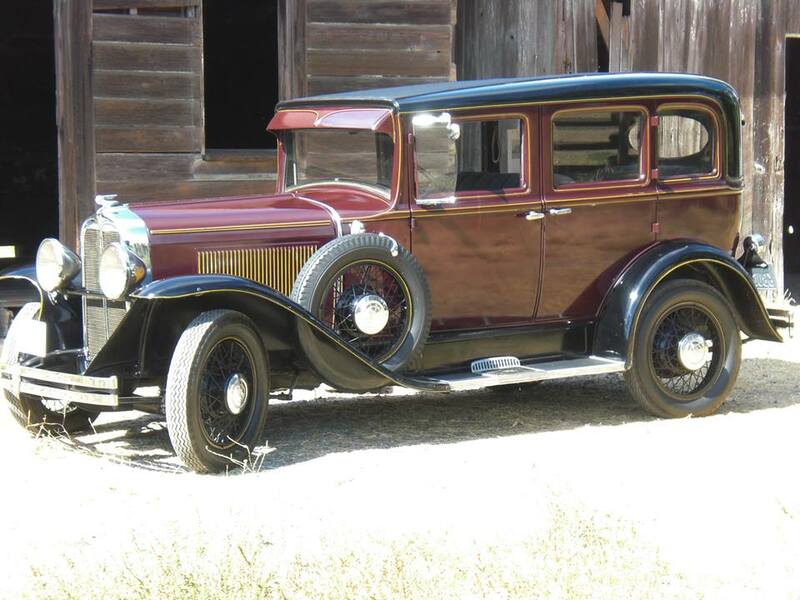 On Aug. 28, 1907, Edward M. Murphy incorporated the Oakland Motor Co. Murphy is said to have chosen the Oakland name for his automobile venture because the company was located in Oakland County, Michigan. 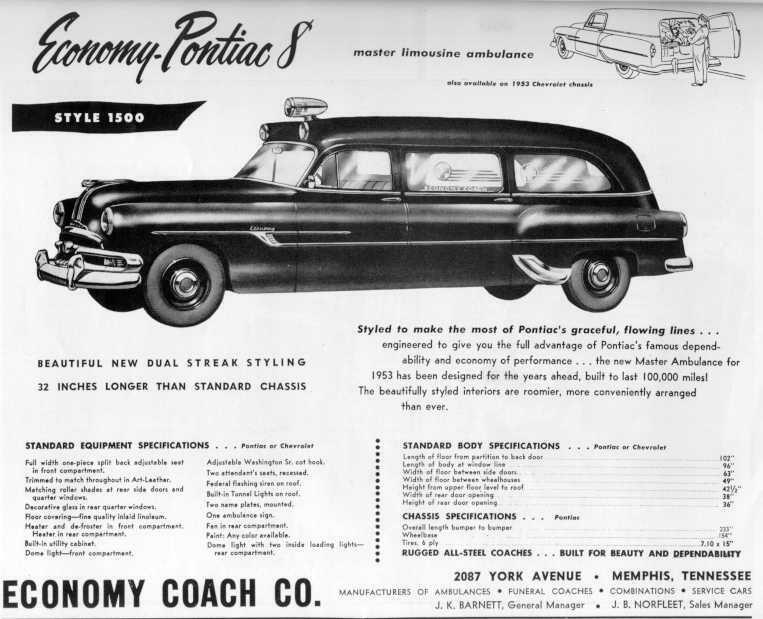 Crosstown rival Pontiac Spring & Wagon Works already was making a high-wheel motor wagon under the name. In January 1909, General Motors President William C. Durant purchased a 50% interest in the Oakland Motor Car Company. 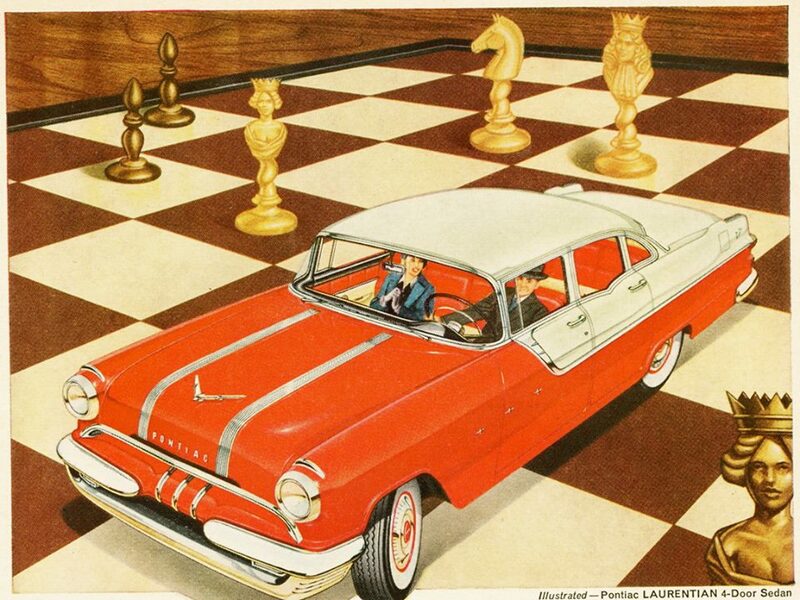 Later that year GM bought out the other 50% after the unexpected death of Edward M. Murphy at the age of 45. 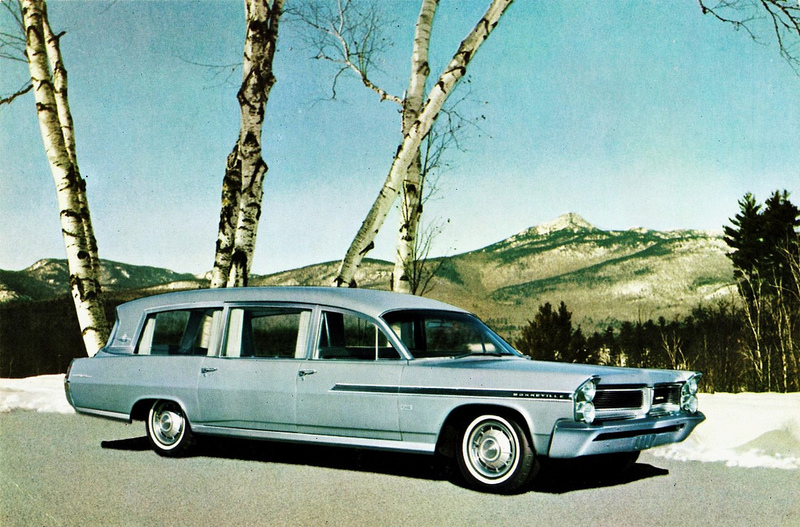 While technically the first Pontiac Spring and Wagon Works’ model was named after the city, such early use of the Pontiac name is really just a predecessor firm in the production history of the later make by General Motors. 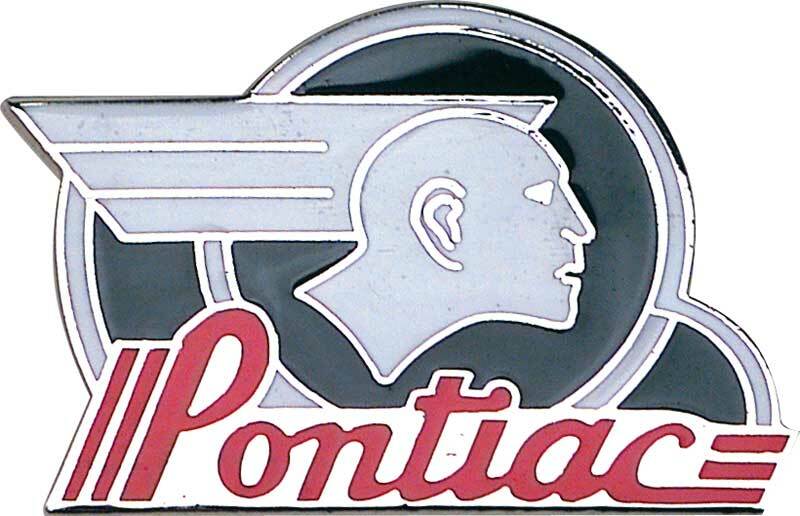 The Pontiac brand was introduced by General Motors in 1926 as the companion marque to GM’s Oakland division. 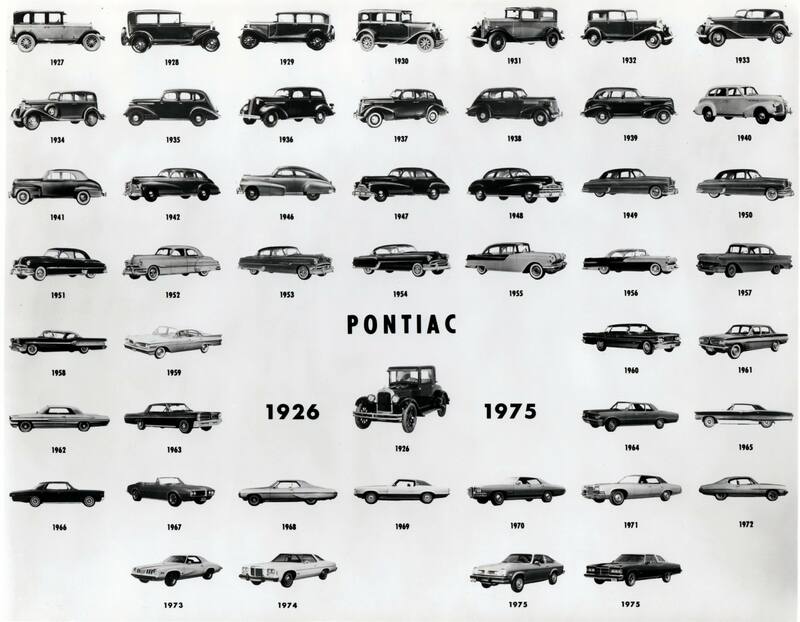 Within months of its introduction, Pontiac was outselling Oakland. 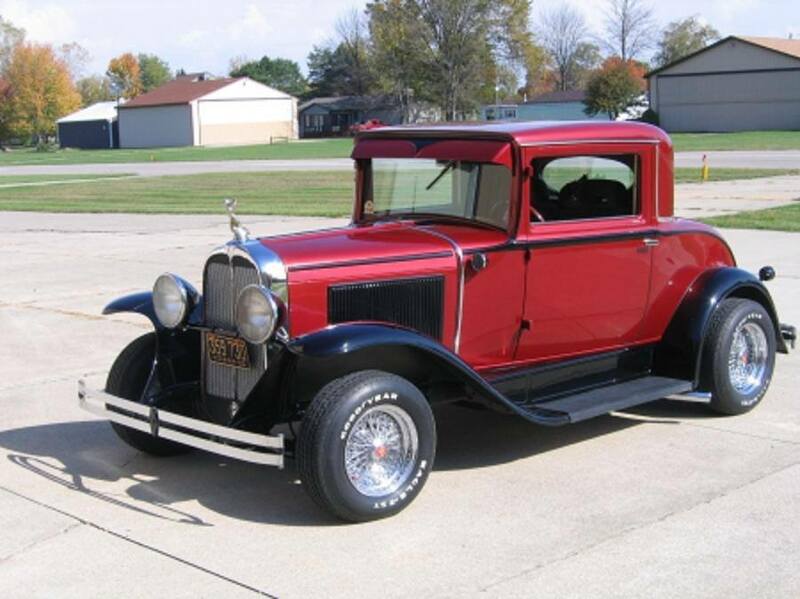 As a result of Pontiac’s rising sales, versus Oakland’s declining sales, Pontiac became the only companion marque to survive its parent, with Oakland ceasing production in 1932. 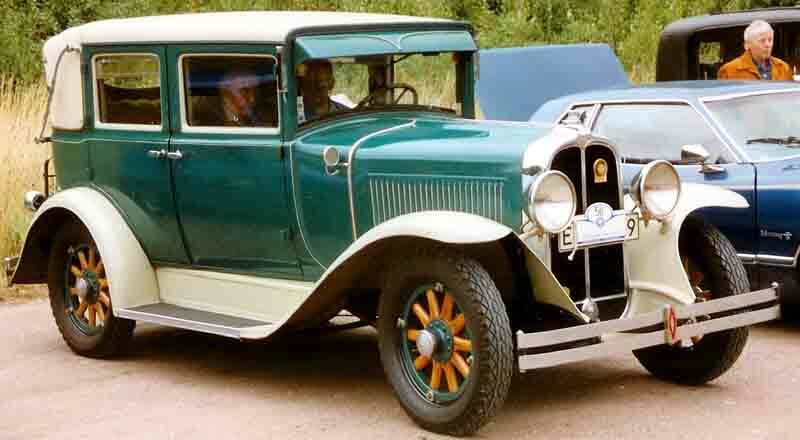 Pontiac produced cars offering 40 hp (30 kW) 186.7 ci (3.1-liter) (3.25×3.75 in, 82.5x95mm) L-head straight 6-cylinder engines in the Pontiac Chief of 1927; its stroke was the shortest of any American car in the industry at the time. The Chief sold 39,000 units within six months of its appearance at the 1926 New York Auto Salon, hitting 76,742 at twelve months. The next year, it became the top-selling six in the U.S., ranking seventh in overall sales. 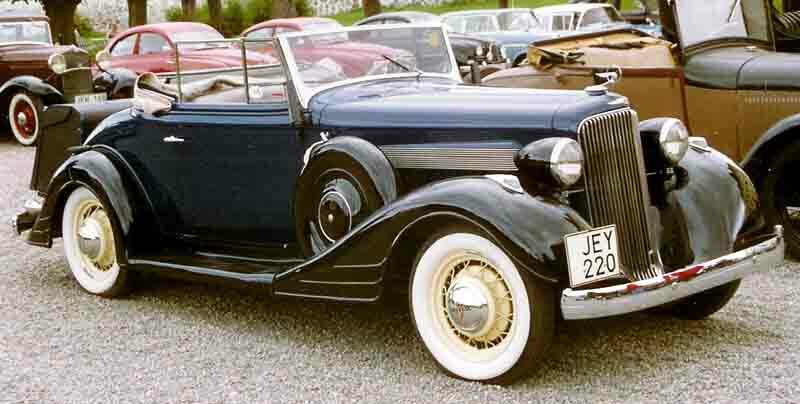 By 1933, it had moved up to producing the least expensive cars available with straight eight-cylinder (inline eight) engines. 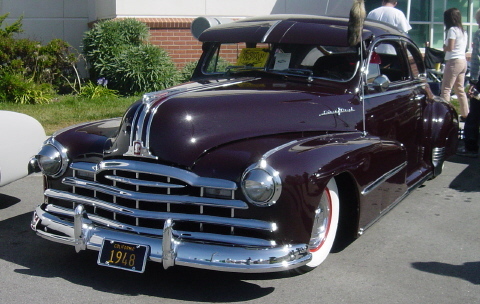 This was done by using many components from the 6-cylinder Chevrolet Master, such as the body. 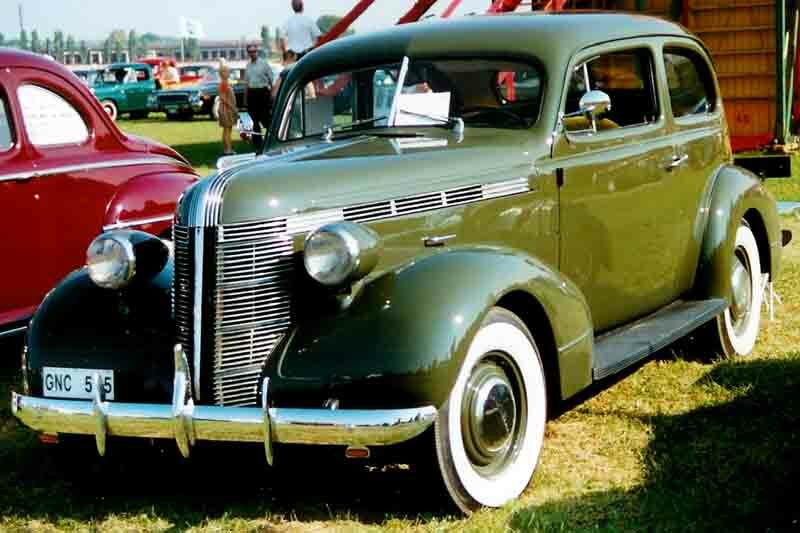 In the late 1930s, Pontiac used the so-called torpedo body of the Buick for one of its models, just prior to its being used by Chevrolet. This body style brought some attention to the marque. 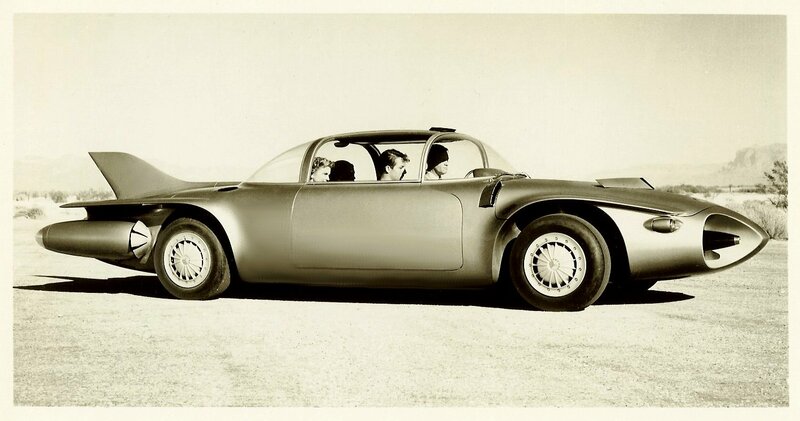 An unusual feature of the “torpedo” body exhibition car, was that with push of a button the front half of the car body would open showing the engine and the car’s front seat interior. 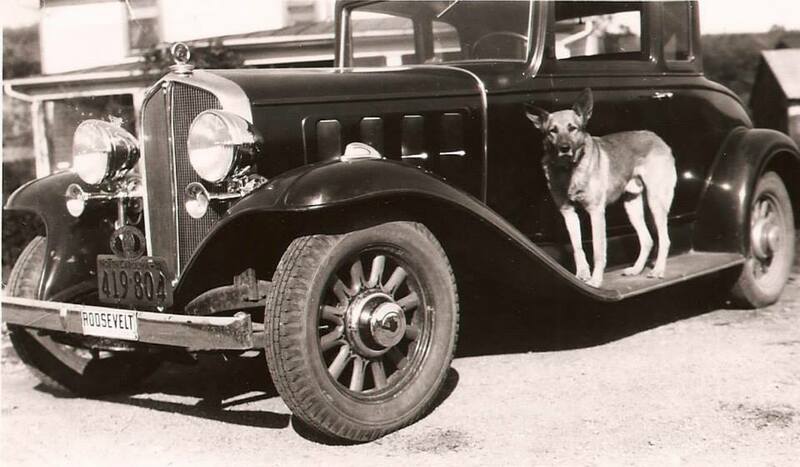 In 1937, the eight-cylinder had a 122 inch wheelbase, while the six-cylinder had a 117 inch wheelbase. 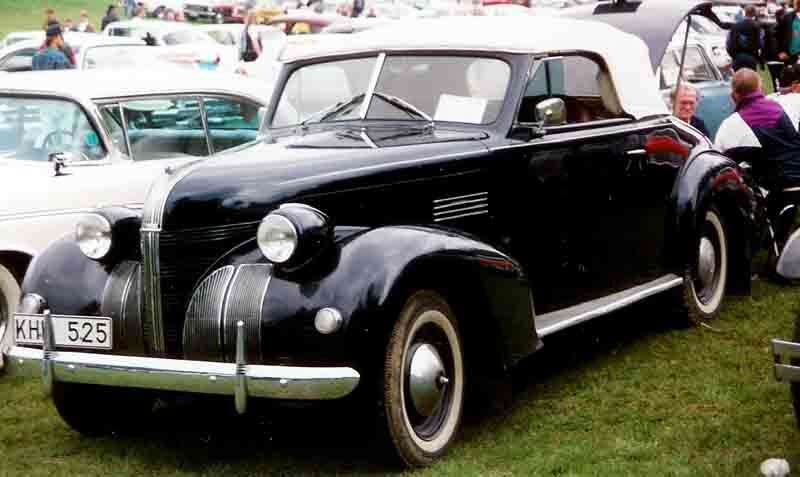 In 1940, Pontiac introduced a new vehicle called the Pontiac Torpedo, and two years later, on 2 February 1942 a Pontiac was the last civilian automobile manufactured in the United States during World War II, as all automobile factories converted to military production. For an extended period of time—prewar through the early 1950s—the Pontiac was a quiet, solid car, but not especially powerful. It came with a flathead (side-valve) straight eight. Straight 8s were slightly less expensive to produce than the increasingly popular V8s, but they were also heavier and longer. Additionally, the long crankshaft suffered from excessive flex, restricting straight 8s to a relatively low compression ratio with a modest redline. However, in this application, inexpensive (yet very quiet) flatheads were not a liability. 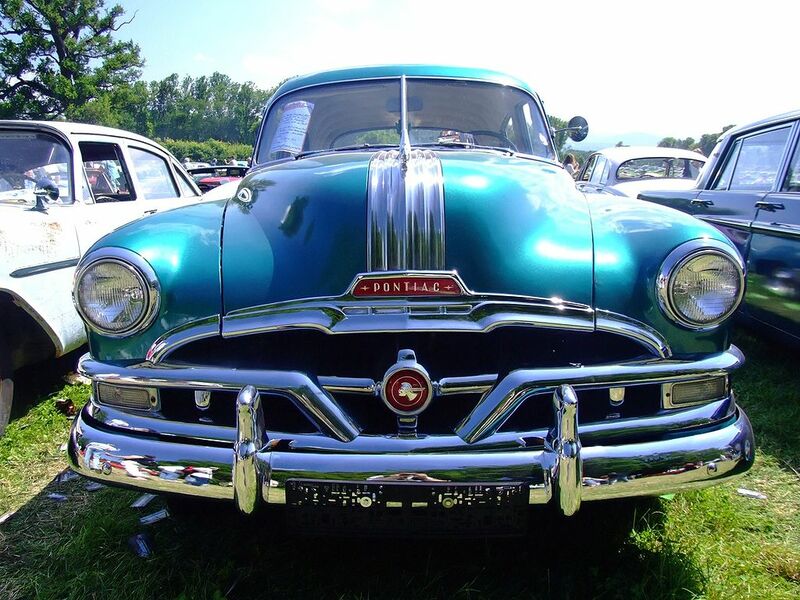 The first all-new Pontiac models appeared in 1949. Newly redesigned, they sported such styling cues as lower body lines and rear fenders that were integrated in the rear-end styling of the car. Along with new styling came a new model. 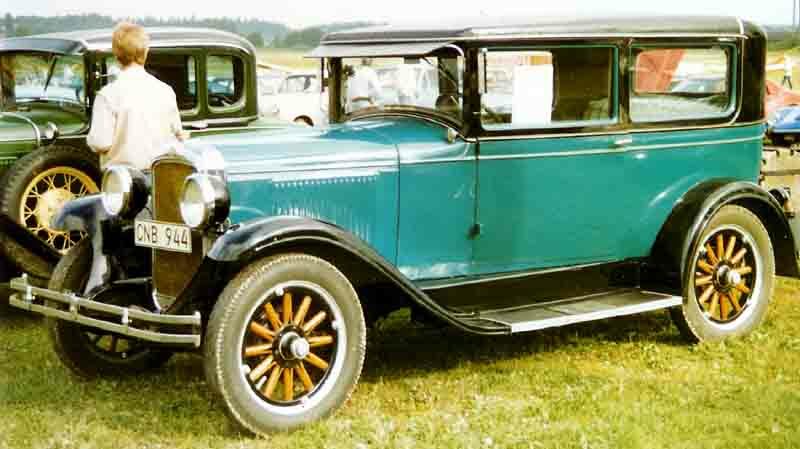 Continuing the Native American theme of Pontiac, the Chieftain line was introduced to replace the Torpedo. 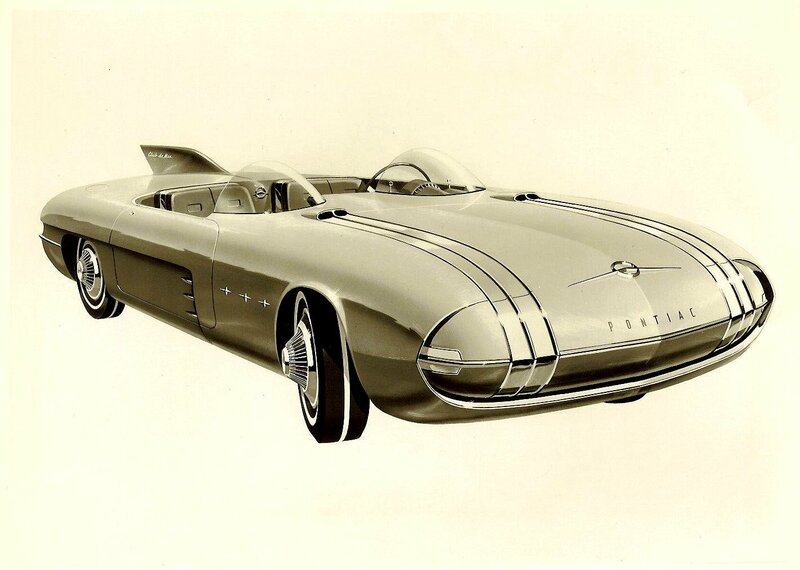 These were built on the GM B-Body platform and featured sportier styling than the more conservative Streamliner. In 1950, the Catalina pillarless hardtop coupe was introduced as a “halo” model, much like the Chevrolet Bel Air of the same year. 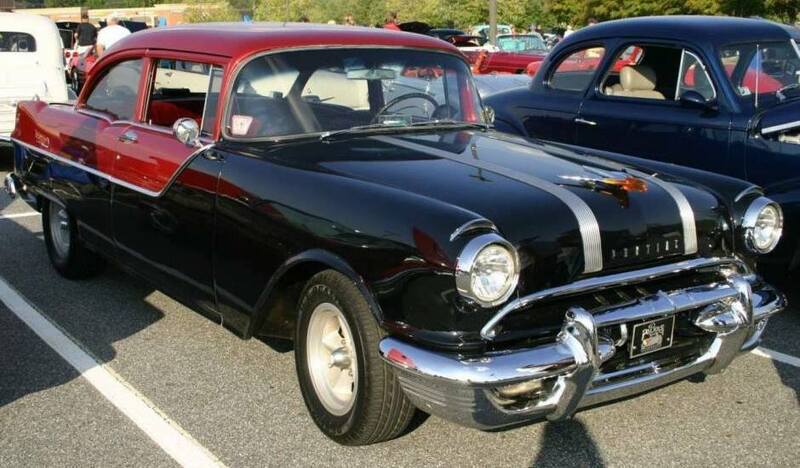 In 1952, Pontiac discontinued the Streamliner and replaced it with additional models in the Chieftain line built on the GM A-body platform. 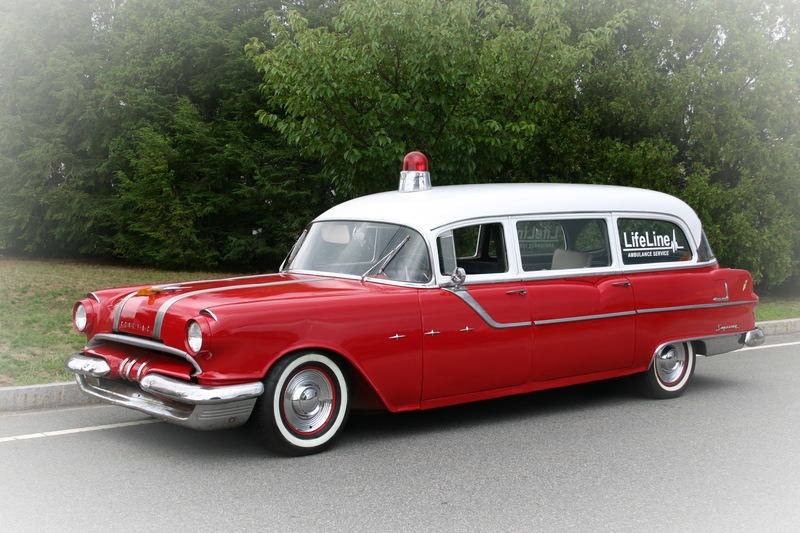 This single model line continued until 1954 when the Star Chief was added. 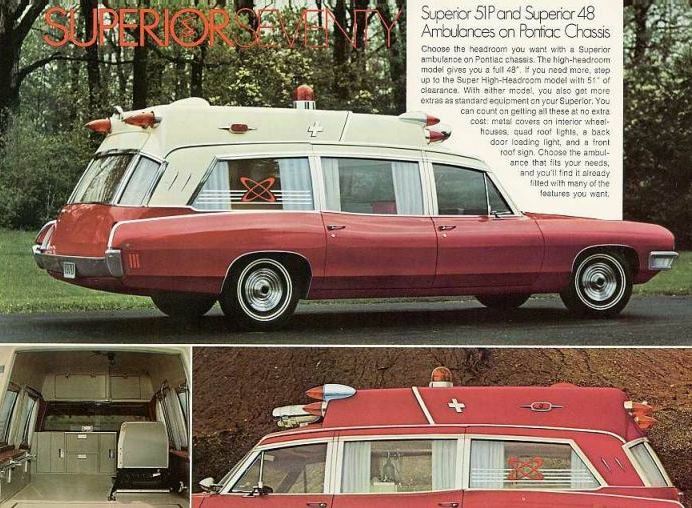 The Star Chief was created by adding an 11-inch (280 mm) extension to the A-body platform creating a 124-inch (3,100 mm) wheelbase. 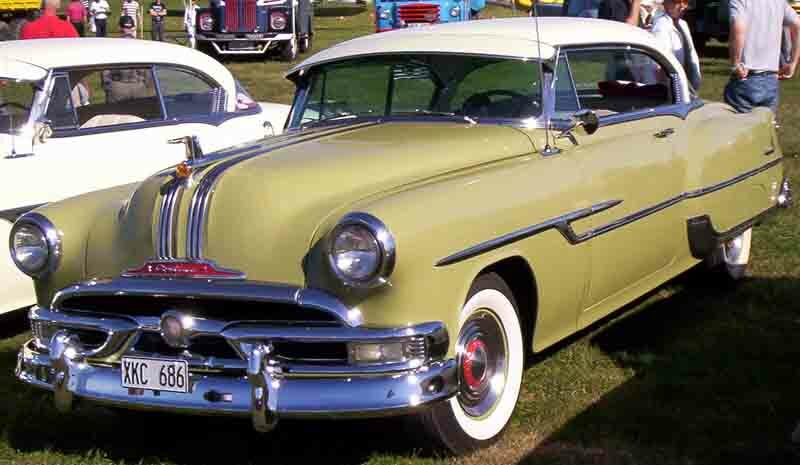 The 1953 models were the first to have one-piece windshields instead of the normal two-piece units. 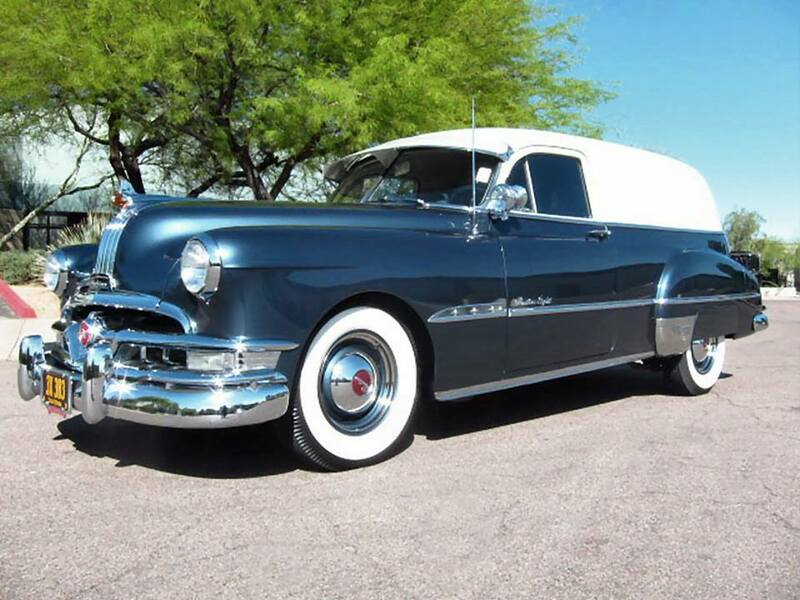 While the 1953 and 1954 models were heavily re-worked versions of the 1949-52 Chieftain models, they were engineered to accommodate the V-8 engine that would appear in the all-new 1955 models. 1956 Canadian Pontiac PathfinderSedan Delivery. 1383 built, not available in USA. 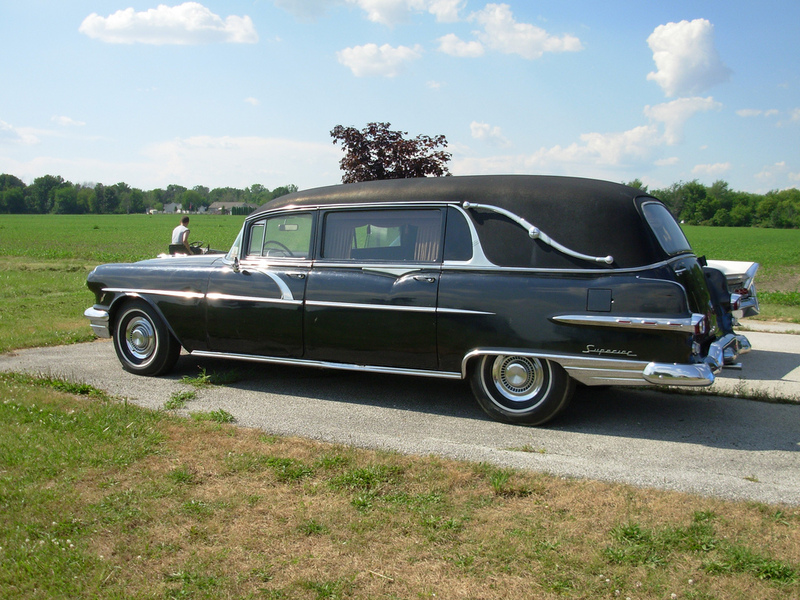 Completely new bodies and chassis were introduced for 1955. A new 173-horsepower (129 kW) overhead valve V-8 engine was introduced. (see Engines section below). Sales increased. 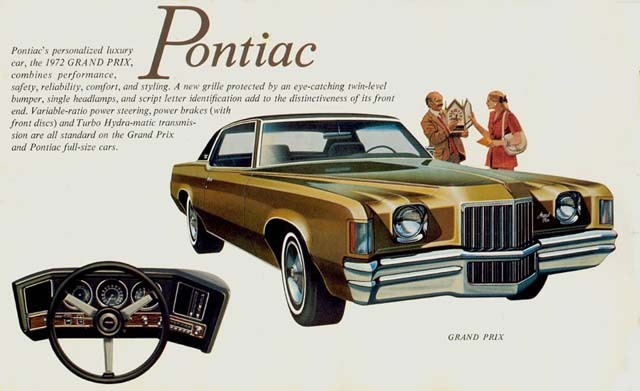 With the introduction of this V-8, the six-cylinder engines were discontinued; a six-cylinder engine would not return to the full-size Pontiac line until the GM corporate downsizing of 1977. 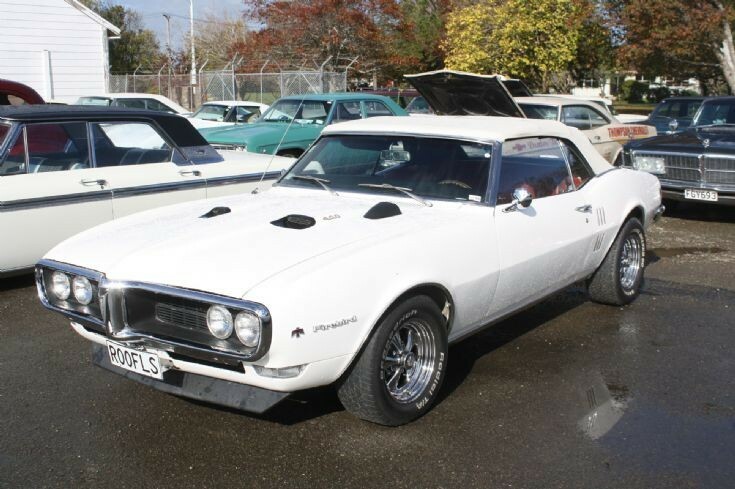 An overhead-cam six-cylinder engine was used in the Tempest model line starting in 1966, as well as on the Firebird. It was the first mass-produced engine in America utilizing an overhead-camshaft configuration. The Bonneville, a sub-series of the Star Chief introduced with the 1957 models, then became its own line. These were built on the 122-inch (3,100 mm) wheelbase of the A-body platform. 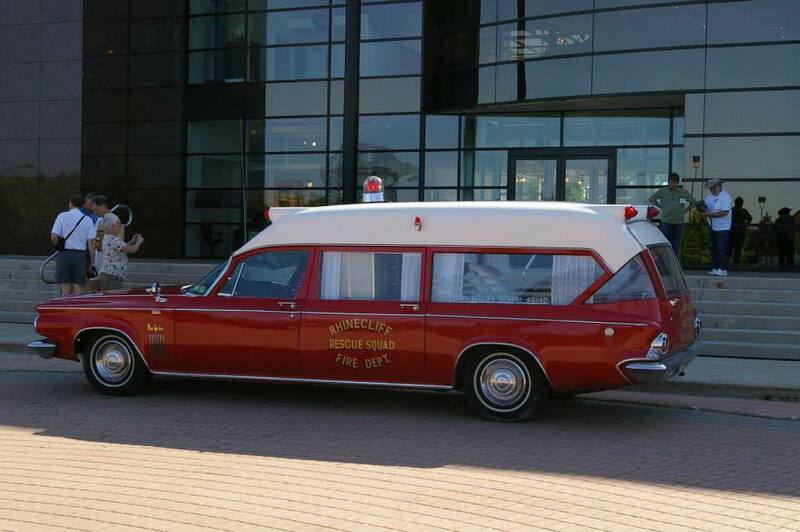 A 1958 Tri-Power Pontiac Bonneville was the pace car for that year’s Indianapolis 500. 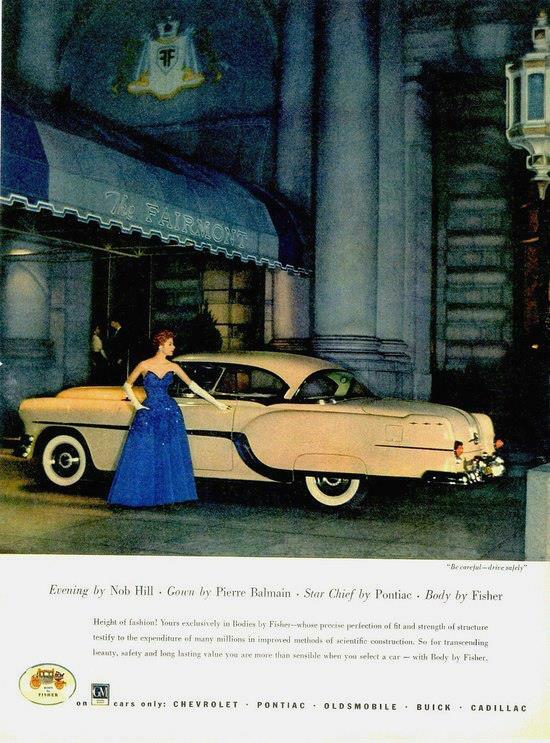 Also, 1958 was the last year Pontiac Motor Division would bear the “Indian” motif throughout the vehicle. 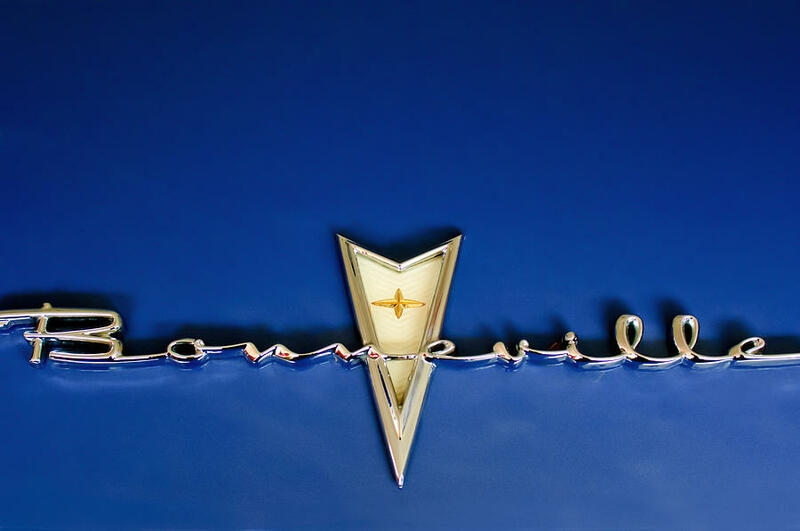 With the 1959 model year, Pontiac came out with its “Arrowhead” emblem, with the star design in the middle. 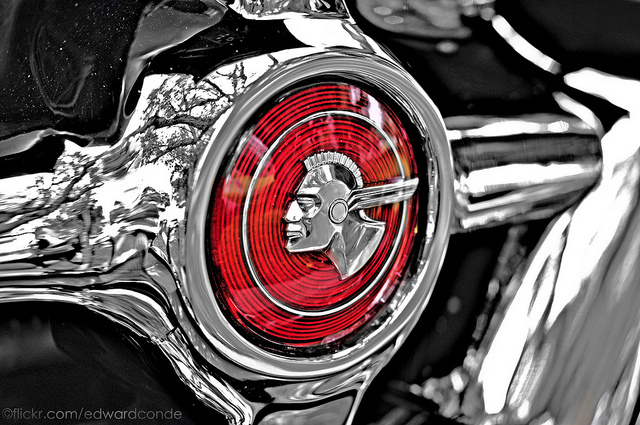 The “Arrowhead” design ran all the way up the hood from between the split grille, and on Starchief Models, had 8 chrome stars from the emblem design bolted to both sides of the vehicle as chrome trim. 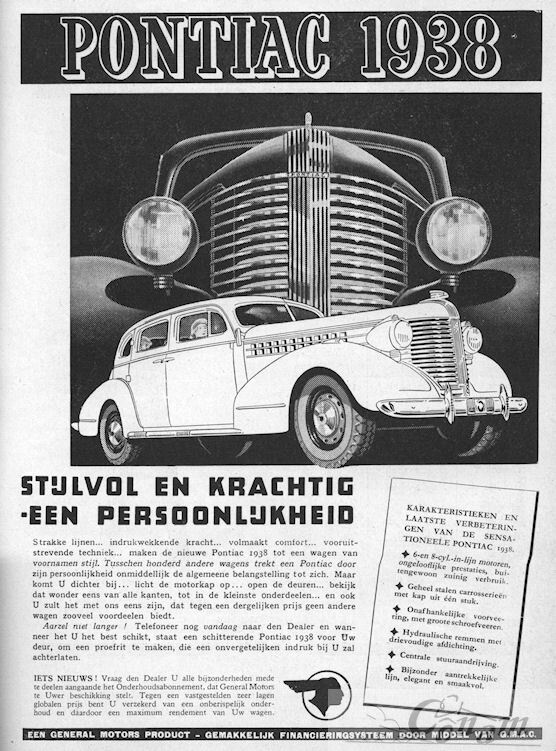 Knudsen saw to it that the car received a completely reworked chassis, body and interior styling. Quad headlamps, and a longer, lower body were some of the styling changes. 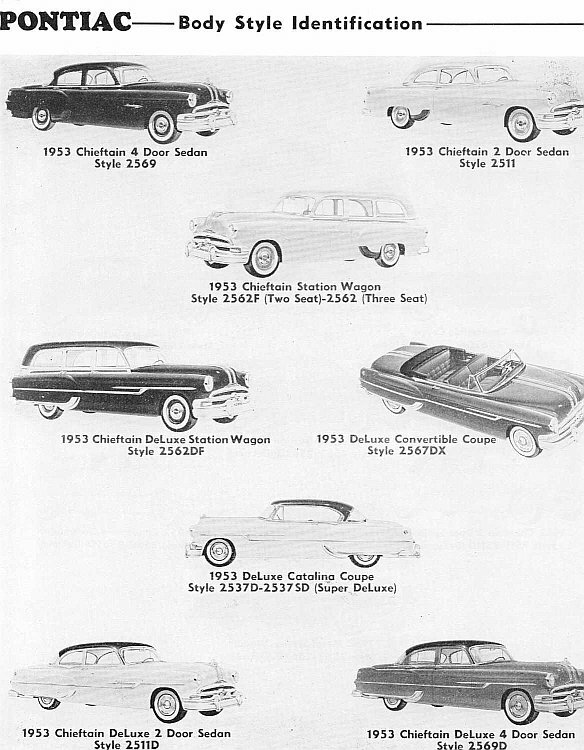 The Chieftain line was renamed Catalina; Star Chief was downgraded to replace the discontinued Super Chief series and for the first time did not have a two door hard top, only a two door sedan along with a four door hard top and four door sedan, in addition there was no Star Chief wagon. 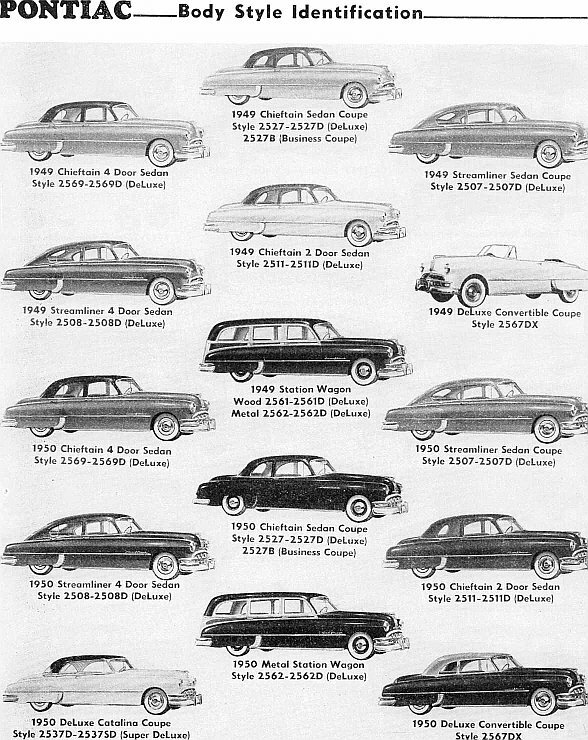 The Bonneville was now the top of the line, coming in three body styles of two door hard top, four door vista and four door wagon. 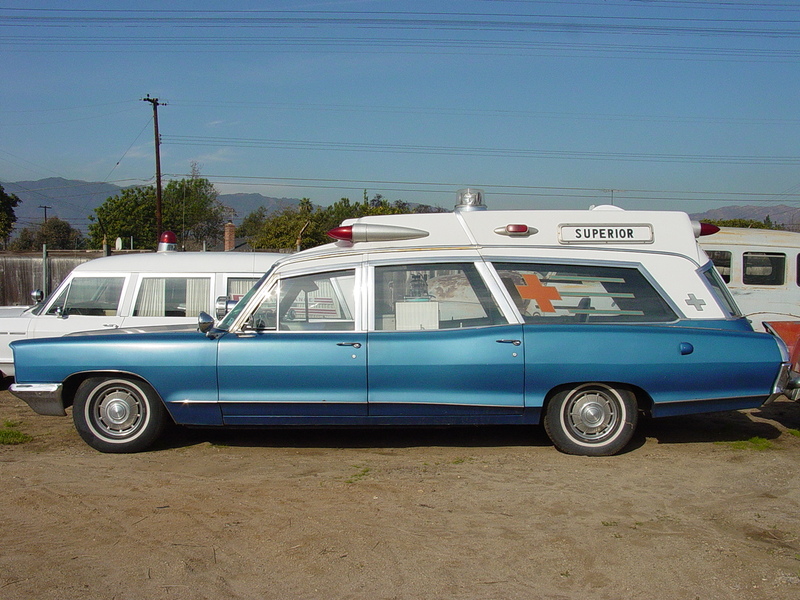 The Star Chief’s four door “Vista” hardtop was also shared by the Bonneville. 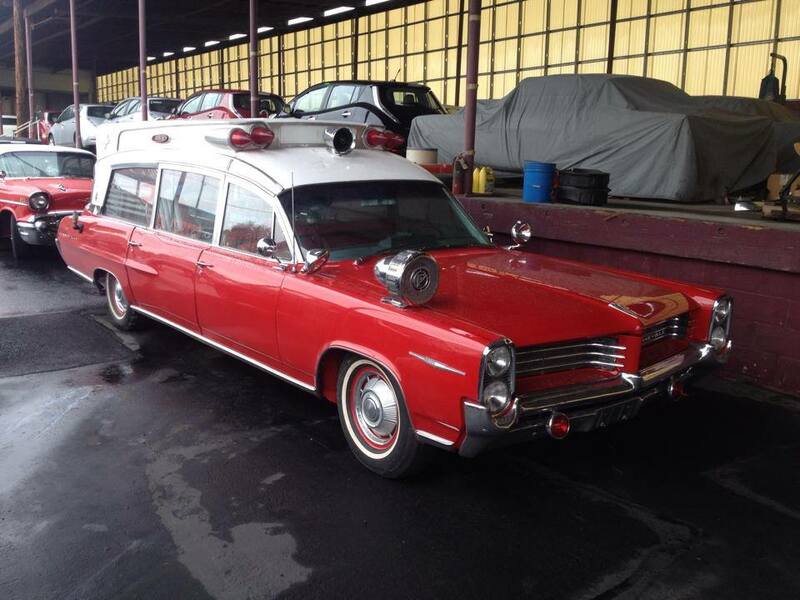 Catalina models included a two door hard top, two door sedan, four door sedan, four door hard top vista and wagon. 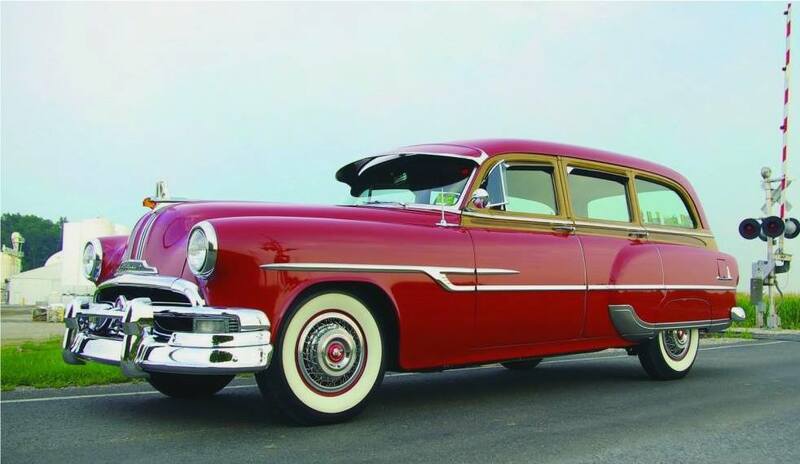 Bonneville and Star Chief were built on a 124″ wheelbase with the exception of the Bonneville wagon and all Catalina models and Bonneville wagon built on 122″ wheelbase. Catalina was also seven inches shorter than Bonneville and Star Chief and weighed one hundred to two hundred pounds less than it’s long wheelbase counterparts. 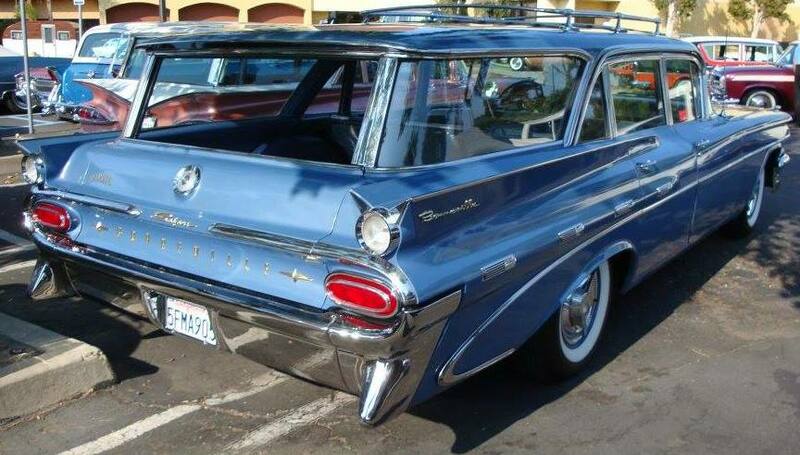 All 1959 Pontiac engines were equipped with a 389 cubic inch engine with horsepower ratings from 215Hp economy engine to a conservative rated 345 hp Tri-Power carbureted engine. All automatic’s were four speed Super-Hydra-Matic’s, or as Hydramatic Division who designed and built them called “Controlled coupling HydraMatic”. A special note here is that Oldsmobile used this same transmission and called it Jetaway HydraMatic and Cadillac also used this transmission and Cadillac called it 315 or P 315 Hydramatic. A three speed column mounted stick shift was standard on all Pontiacs. This coincided with major body styling changes across all models that introduced increased glass area, twin V-shaped fins and lower hood profiles. 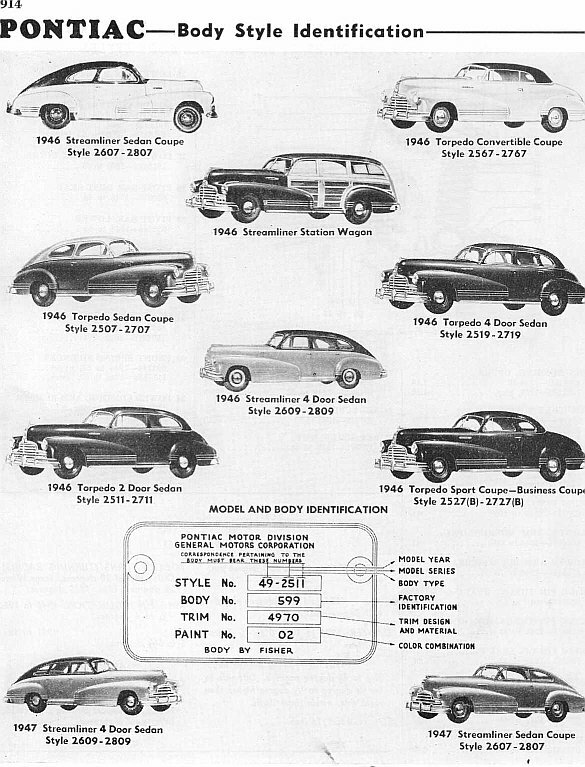 Because of these changes, Motor Trend magazine picked the entire Pontiac line as 1959 Car of the Year. The ’59s have a five-inch (127 mm) wider track, Front at 63 7/8″ front track and 64.0″ rear track because Knudsen noticed the new, wider bodies looked awkward on the carried-over 1958 frames. 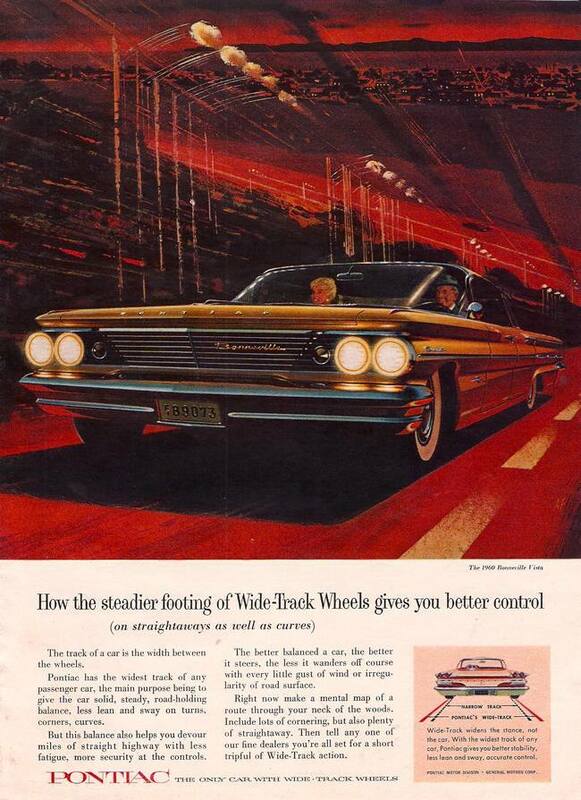 The new “Wide-Track” Pontiacs not only had improved styling, but also handled better—a bonus that tied into Pontiac’s resurgence in the marketplace. 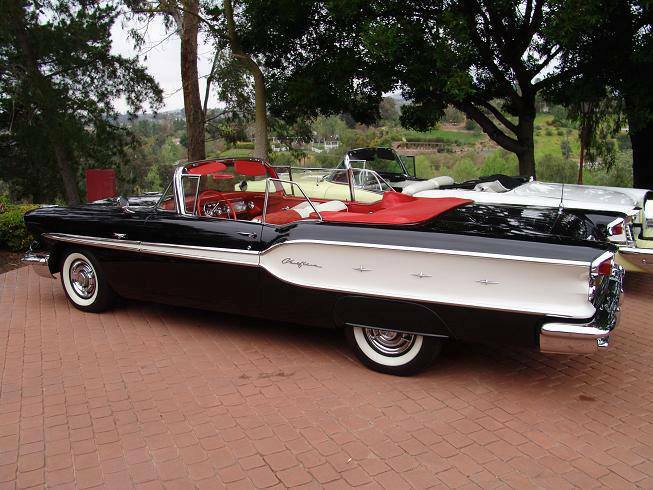 The 1960 models saw a complete re-skinning with the exception of the body’s canopies which remained identical to the 59’s, but removed the tail fins and the distinctive split grille (which Ford copied on the final Edsel models for 1960). The 1960 models standard engine all had a Horsepower gain of 3 hp due to a compression bump of .25 to one over the 59 engine. The front track was now widened to the rear track at 64″. 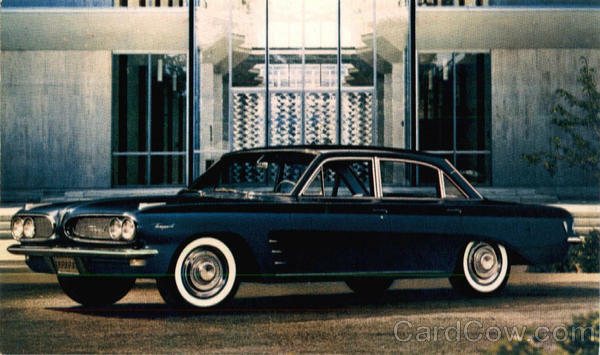 Ventura was introduced, a more luxurious hardtop coupe and the Vista 4-door hardtop now being built on the shorter 122-inch (3,100 mm) wheelbase platform, with it falling between the Catalina and Star Chief models. 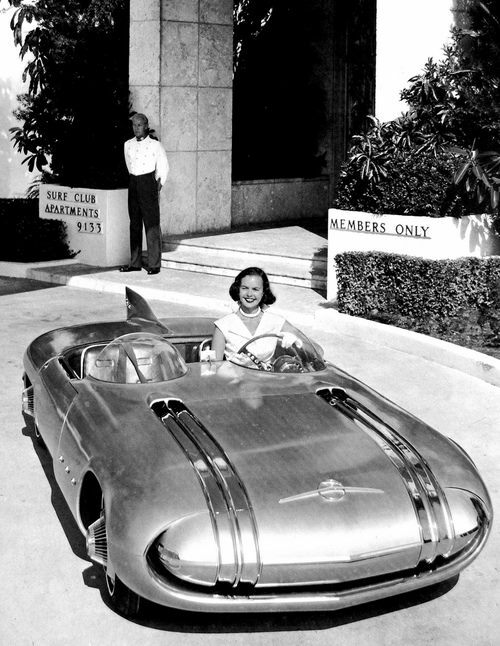 The Ventura featured the luxury features of the Bonneville in the shorter, lighter Catalina body. Most of Pontiac’s models built during the 1960s and 1970s were either styled like, or were siblings to, other GM makes (except Cadillac). 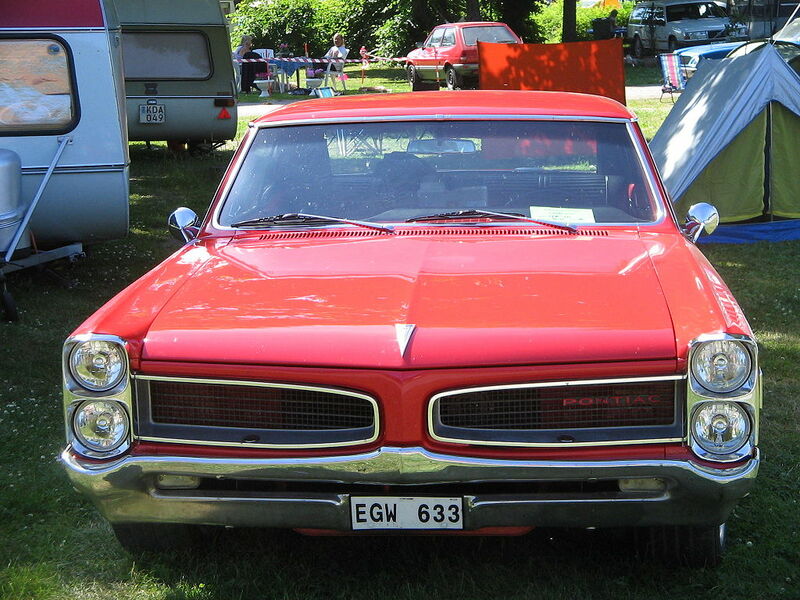 However, Pontiac retained its own front and rear end styling, interiors, and engines. Pontiac 8-Lug Rim. 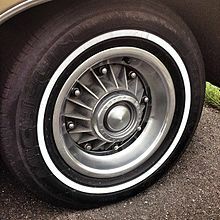 Full size Pontiacs from 1960 to 1968 featured these unique, finned, 8 bolt rims, which aided in the cooling of the drum brakes. The 1961 models were similarly reworked. 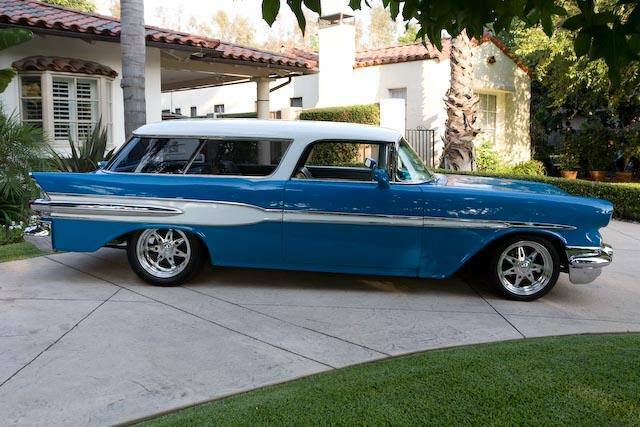 The split grille returned, as well as all-new bodies and a new design of a perimeter-frame chassis for all its full-size models (something which would be adopted for all of GM’s intermediate-sized cars in 1964, and all its full-sized cars in 1965). These new chassis allowed for reduced weight and smaller body sizes. It is interesting to note that the similarly styled Chevrolet still used the radically different “X” frame in the early 1960s. 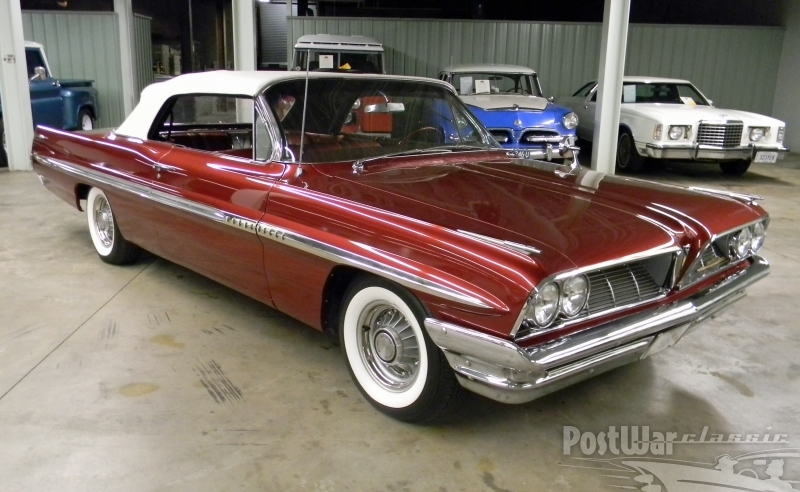 But a complete departure in 1961 was the new Tempest, one of the three BOP (Buick-Olds-Pontiac) “compacts” introduced that year, the others being the Buick Special and Skylark and Oldsmobile F-85 and Cutlass. Toward the end of the 1961 model year, a fancier version of the Tempest, called “LeMans“, was introduced. A mispronunciation of the famous 24 Hours of Le Mans auto race in France was emphasized. 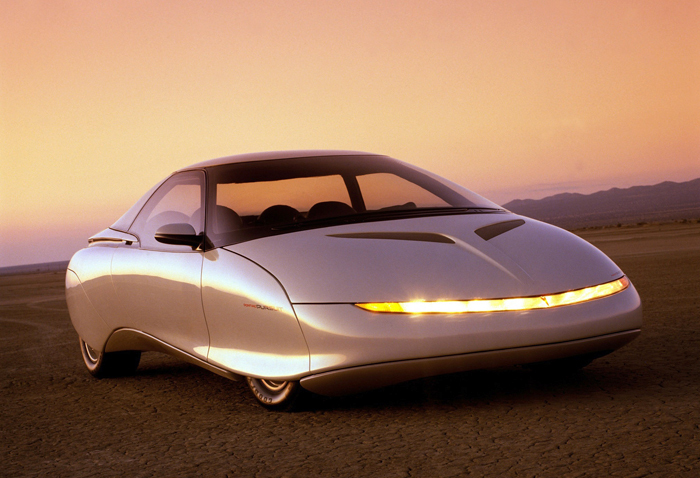 All three were uni-body cars, dubbed the “Y-body” platform, combining the frame and the body into a single construction, making them comparatively lighter and smaller. All three put into production new technology that GM had been working on for several years prior, but the Tempest was by far the most radical. A seven-foot flexible steel shaft, rotating at the speed of the engine, delivered power from the front-mounted engine to a rear-mounted trans-axle through a “torque tube.” Because it was curved when installed, the so-called “propeller shaft” was dubbed “rope-shaft.” The design’s father was none other than DeLorean, and its advantage was twofold: first, the car achieved close to a 50/50 weight balance that drastically improved handling; and second, it enabled four-wheel independent suspension. This was a feature that no other American car could match save the Corvair, as well as eliminating the floor “hump” that usually came with front-engined rear-drive cars. Though the Tempest’s transaxle was similar to the one in the Corvair, introduced the year before, it shared virtually no common parts. 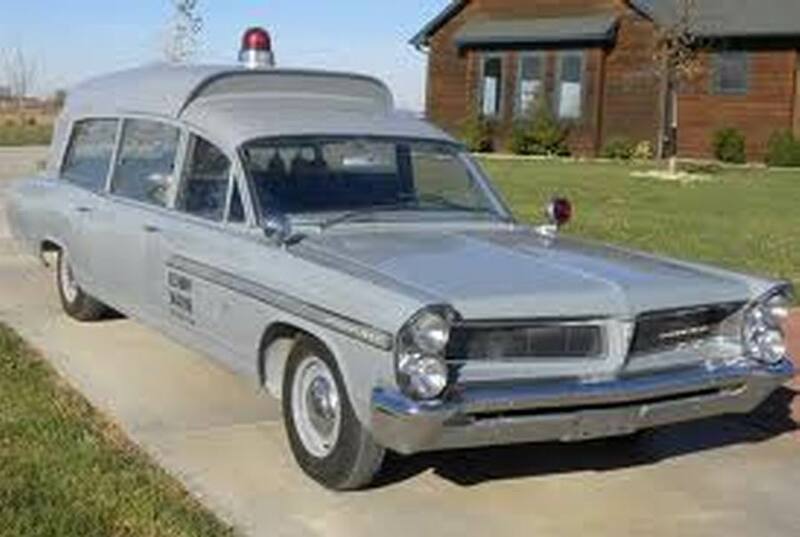 GM had planned to launch a Pontiac version of the Corvair (dubbed “Polaris”), but “Bunkie” Knudsen—whose niece had been seriously injured in a Corvair crash—successfully argued against the idea. The Polaris design apparently made it to full-scale clay before it was cancelled. Instead, DeLorean’s “rope-shaft” design was green-lighted. 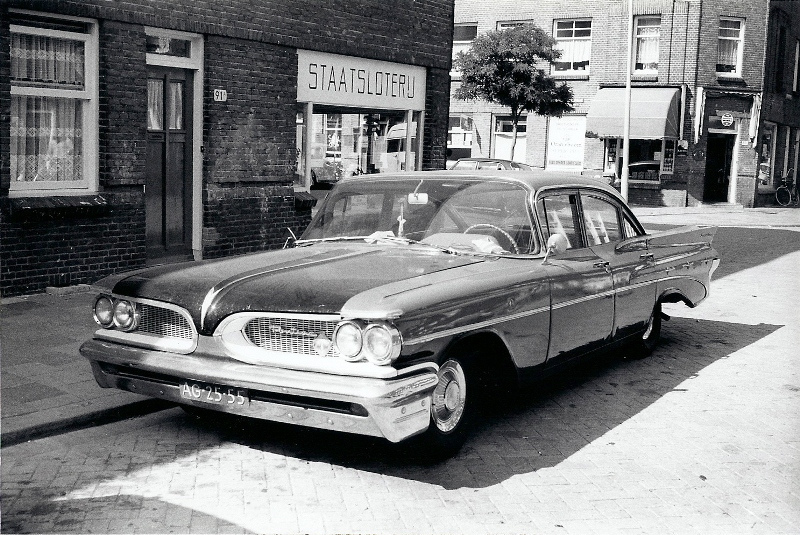 Contemporary rumors of the rope-shaft’s demise due to reliability problems are unfounded; the rope-shaft’s durability and performance had been proven in tests in full-size Pontiacs and Cadillacs in 1959, and only adapted to a smaller car in 1960. 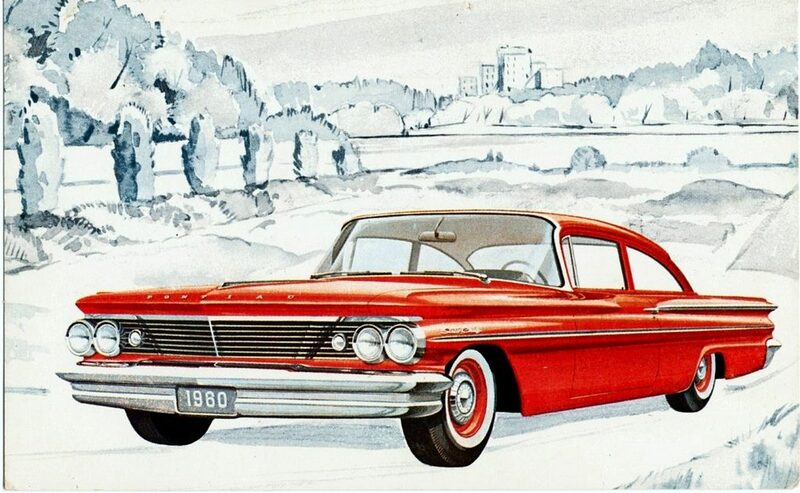 The Tempest won the Motor Trend “Car of the Year” award in 1961—for Pontiac, the second time in three years. DeLorean’s vision has been further vindicated by the adoption of similar designs in a slew of modern high-performance cars, including the Porsche 928, 924, and 944, the Corvette C5, and the Aston Martin DB9. Unless customers checked an option, the Tempest’s power-plant was a 194.5 Ci inline-slant-four-cylinder motor, derived from the right bank of the venerable Pontiac 389 V8, enabling it to be run down the same production line as the 389, saving costs for both the car’s customers and Pontiac. 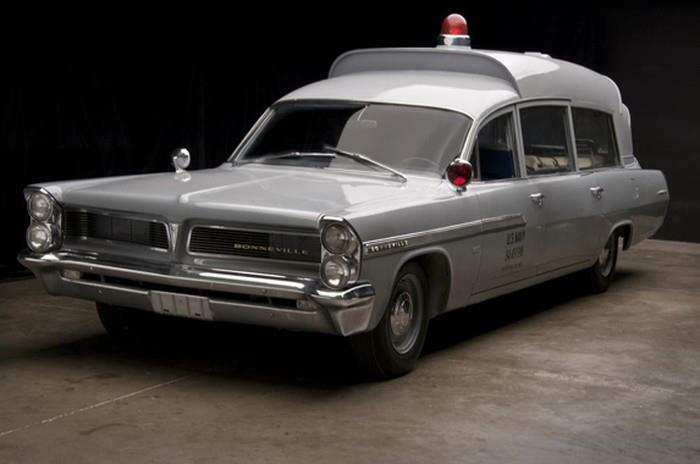 Pontiac engineers ran early tests of this motor by literally cutting off the left bank of pistons and adding counterweights to the crankshaft, and were surprised to find it easily maintained the heaviest Pontiacs at over 90 miles per hour (140 km/h). In production, the engine received a crankshaft designed for just four cylinders, but this didn’t completely solve its balance issues. The engine gained the nickname “Hay Baler” because of it tendency to kick violently, like the farm machine, when its timing was off. 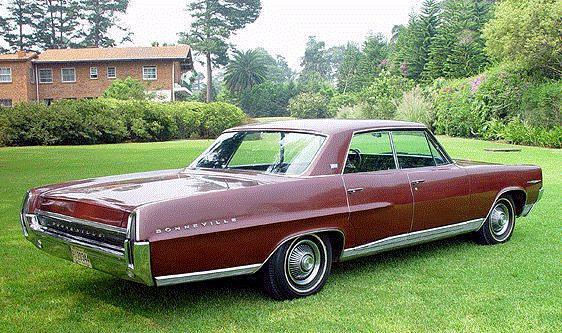 The aforementioned Buick 215 V8, was ordered by less than two percent of its customers in the two years it was available, 1961 and 1962. Today, the 215 cars are among the most sought-after of all Tempests. 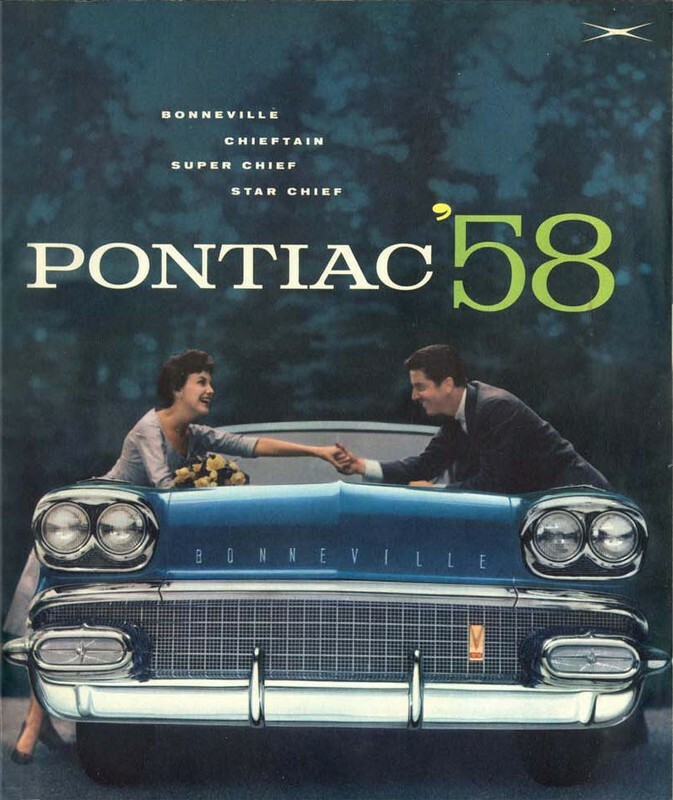 In 1963, Pontiac replaced the 215 with a “new” 326 which was really a 336 with a bore of 3.78 and stroke of 3.75 ( same stroke as the 389 ), an iron block mill that had the same external dimensions and shared parts with the 389, but an altered, reduced bore. The car’s body and suspension was also changed to be lower, longer and wider. The response was that more than half of the 1963 Tempests and LeMans (separate lines for that one year only) were ordered with the V8, a trend that did not go unnoticed by management. The next year, the 326 would become a true 326 with a new bore size of 3.72. 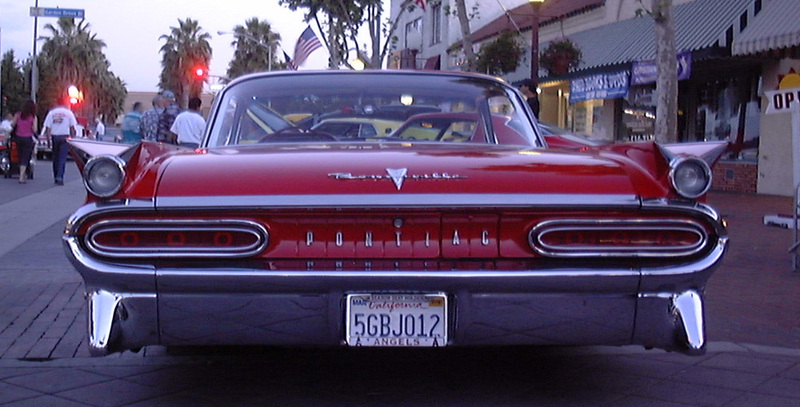 The Tempest’s popularity helped move Pontiac into third place among American car brands in 1962, a position Pontiac would hold through 1970. The Buick 215 V8 would remain in production for more than thirty five years, being used by Britain’s Rover Group after it had bought the rights to it. GM attempted to buy the rights back, however, Rover wished, instead, to sell the engines directly. 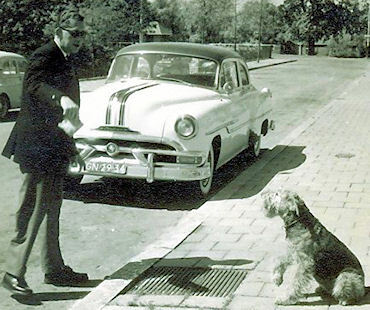 In November 1961, Knudsen had moved to Chevrolet. 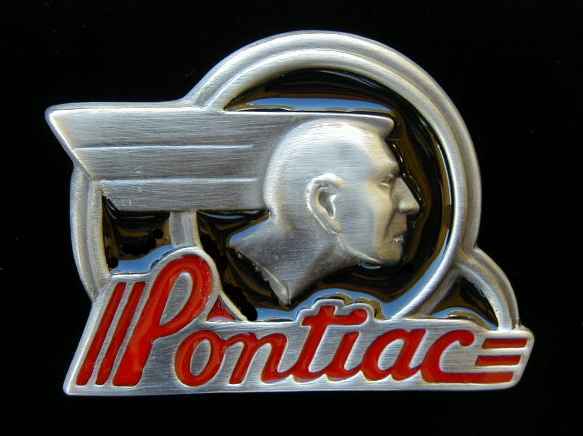 Pete Estes now became general manager of Pontiac and Delorean was promoted to Pontiac Chief engineer. 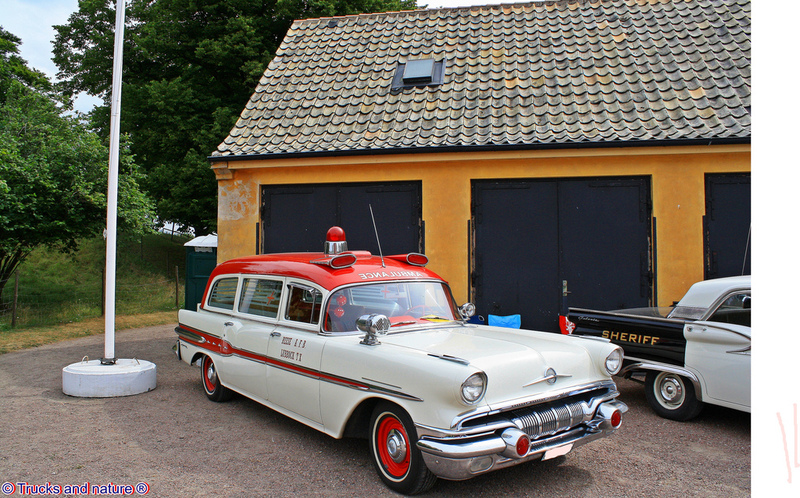 Both continued Knudsen’s work of making Pontiac a performance-car brand. 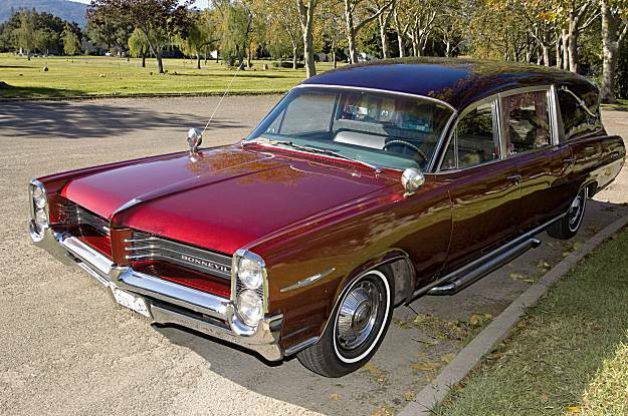 Pontiac capitalized on the emerging trend toward sportier bucket-seat coupes in 1962 by introducing the Grand Prix, taking the place of the ventura which now became a trim option on the Catalina. Although GM officially ended factory support for all racing activities across all of its brands in January 1963, Pontiac continued to cater to performance car enthusiasts by making larger engines with more power available across all model lines. 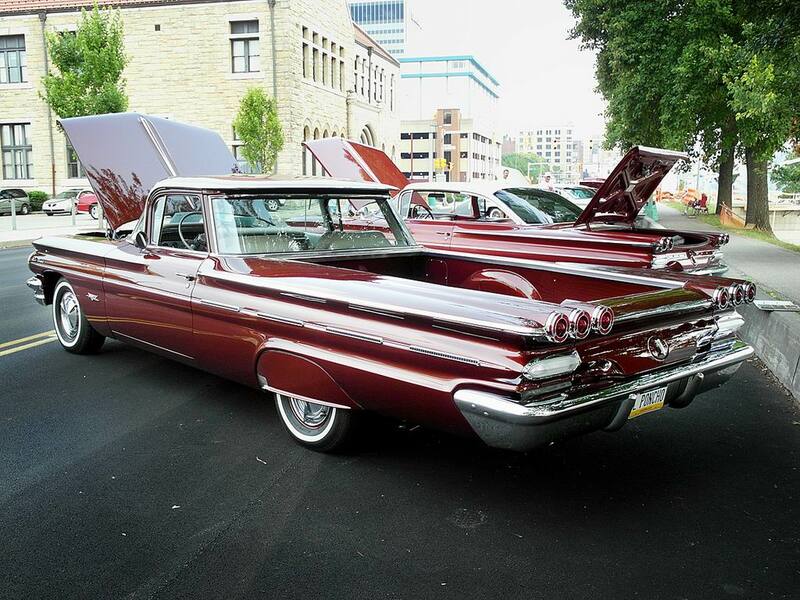 For 1963, the Grand Prix received the same styling changes as other full-sized Pontiacs such as vertical headlights and crisper body lines, but also received its own squared-off roof-line with a concave rear window, along with less chrome. This concave rear window would be duplicated on all Tempest/LeMans four door intermediates in 1964-1965. 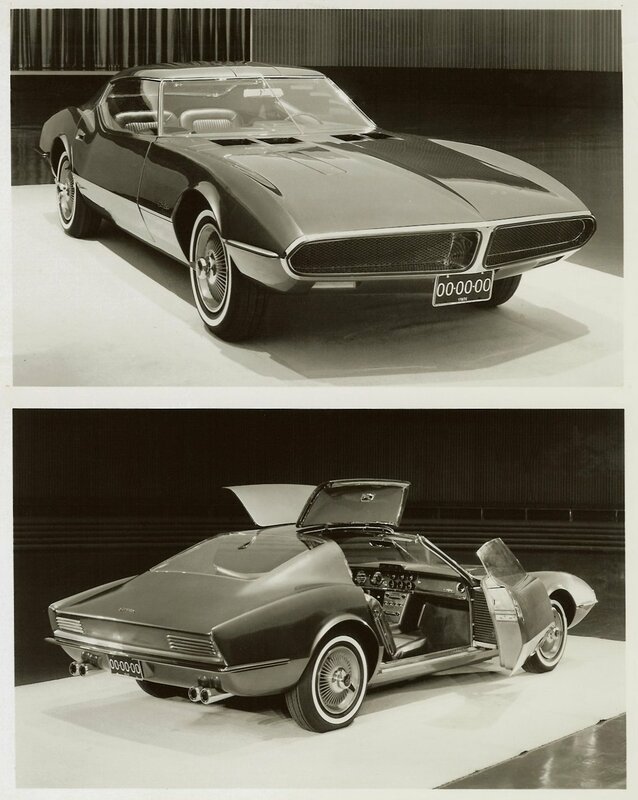 For 1964, the Tempest and LeMans’ trans-axle design was dropped and the cars were redesigned under GM’s new A body platform; frame cars with a conventional front-engine, rear-wheel-drive layout. The most important of these is the GTO, short for “Gran Turismo Omologato,” the Italian for “Grand Touring, Homologated” used by Ferrari as a badge to announce a car’s official qualification for racing. In spite of a GM unwritten edict against engines larger than 330 Ci in intermediate cars, DeLorean (with support from Jim Wangers from Pontiac’s ad agency), came up with the idea to offer the GTO as an option package that included a 389 Ci engine rated at 325 or 348 horsepower (260 kW). 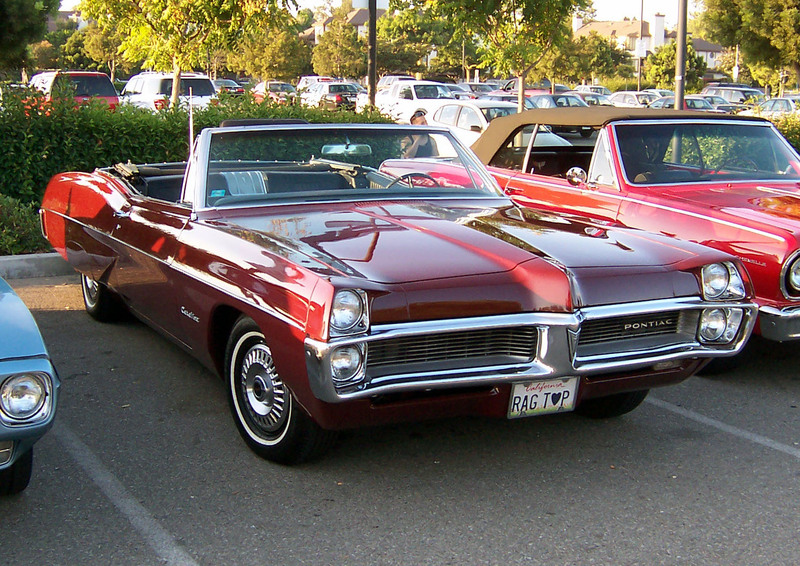 The entire Pontiac lineup was honored as Motor Trend’s Car of the Year for 1965, the third time for Pontiac to receive such honors. The February, 1965 issue of Motor Trend was almost entirely devoted to Pontiac’s Car of the Year award and included feature stories on the division’s marketing, styling, engineering and performance efforts along with road tests of several models. The 1967 model year saw the introduction for the Pontiac Firebird pony car, a variant of the Chevrolet Camaro that was the brand’s answer to the hot-selling Ford Mustang. 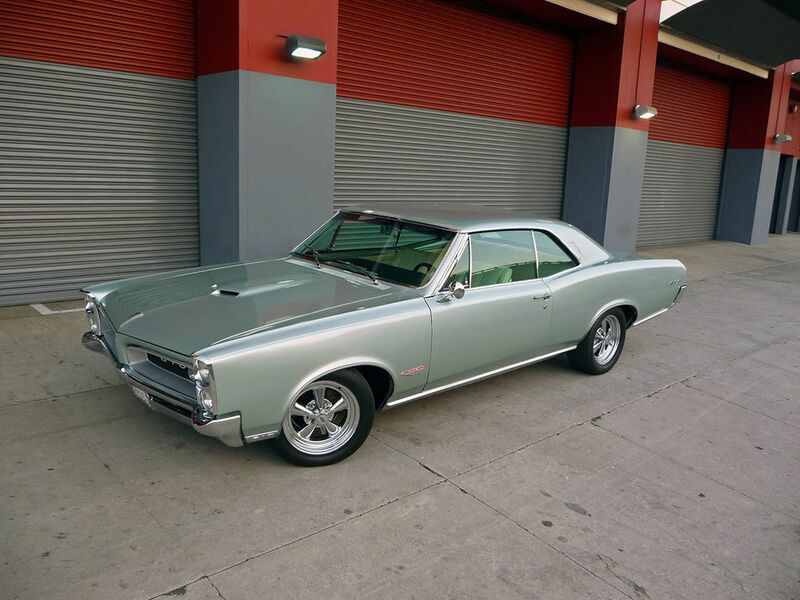 Intermediate sized cars (Tempest, LeMans, GTO) were mildly face-lifted but all full size cars and GTO lost their Tri-Power engine option though it did get a larger 400 cubic-inch V8 that replaced the previous 389. 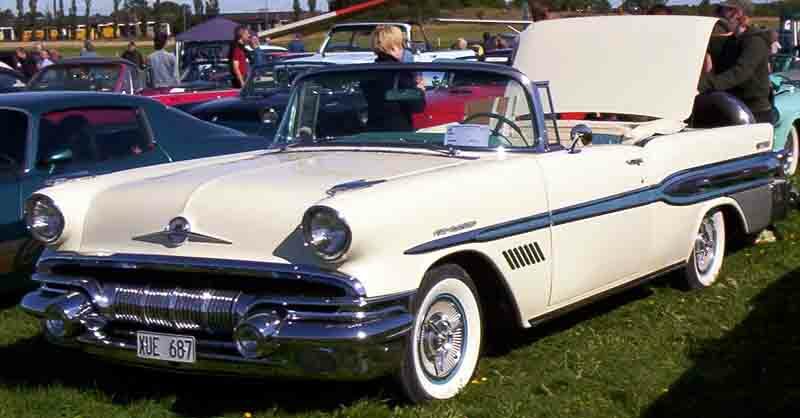 Full-sized cars got a major facelift with rounder wasp-waisted body lines, a name change for the mid-line series from Star Chief to Executive and a one-year-only Grand Prix convertible. 1968 introduced the Endura ‘rubber’ front bumper on the GTO, the precursor to modern cars’ integrated bumpers, and the first of a series “Ram Air” engines, which featured the induction of cold air to the carburetor(s) for more power, and took away some of the sting from deleting the famous Tri-Power multiple carburetion option from the engine line up. This Tri carburetor deletion came from the 14th floor of GM banning multiple carburetion and headed by GM president Ed Cole. It’s ironic that Cole’s Beloved Corvair and Corvette were still allowed multiple carburetion. A political scheme? You make the call as most people who understand GM of that time knew that Knudsen, Estes, and Delorean always butted heads with top GM brass and Cole in particular. This line culminated in the Ram Air IV and V round port cylinder headed engines. The Ram Air V garnered much auto press publicity, but only a relative few were made available for sale. Full-sized cars and intermediates reverted from vertical to horizontal headlights while the sporty/performance 2+2 was dropped from the lineup. 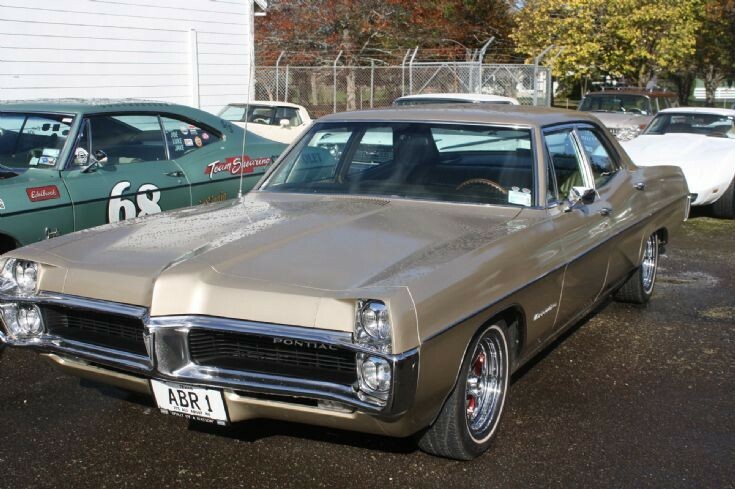 For 1969, Pontiac moved the Grand Prix from the full-sized lineup into a G-body model of its own based on the A-body intermediate four door modified from 116 inches to 118 inches wheelbase chassis, but with distinctive styling and long hood/short deck proportions to create yet another niche product – the intermediate-sized personal-luxury car that offered the luxury and styling of the higher priced personal cars such as the Buick Riviera and Ford Thunderbird and the old Grand Prix and Olds Starfire but for a much lower price tag. The development of the car really has an interesting twist. Pete Estes who like Knudsen had moved to be GM of Chevrolet in 1966 and Delorean now Manager of Pontiac division needed a car to take the place of the sagging sales of the full size Grand Prix, but the development cost of the car was too much of burden for Pontiac division alone, so Delorean went to his old boss now at Chevrolet to gather support for the development cost of the new “G” body Grand Prix. 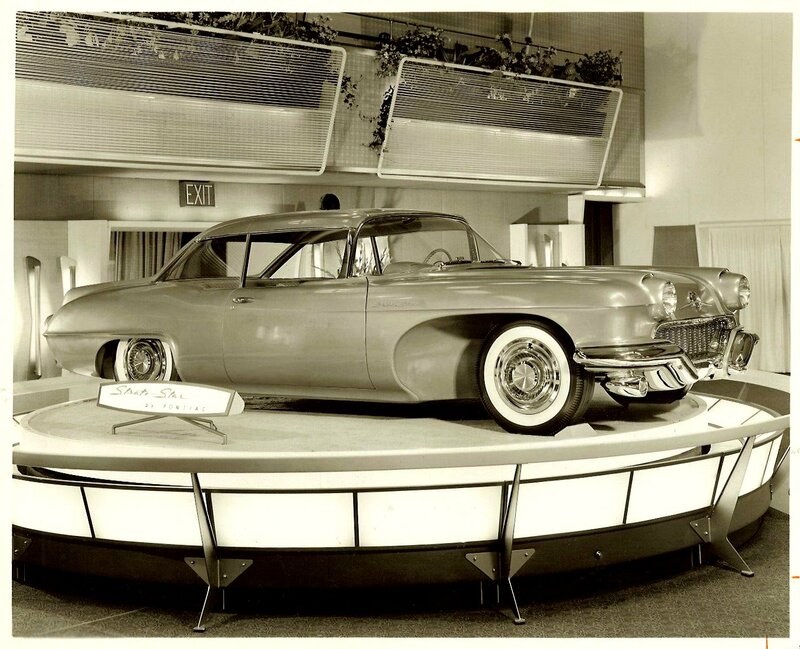 Estes agreed to share in the cost and allow Pontiac to have a one year exclusivity on this new car, the next year Chevy would follow with its version which was called Monte Carlo. The new Grand Prix was such a sales success in 1969 as dealers moved 112,000 units – more than four times the number of Grand Prixs sold in 1968. 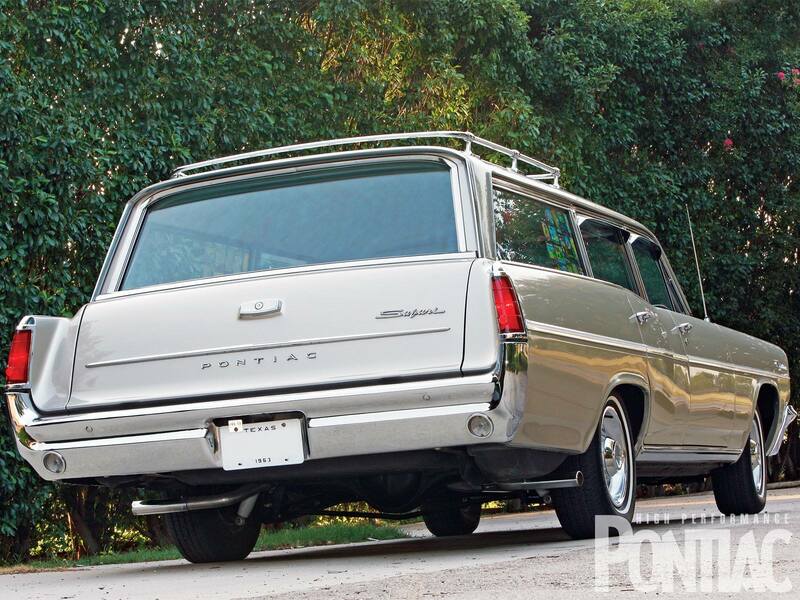 Full-sized Pontiacs were also substantially restyled but retained the same basic under-body structure and chassis that debuted with the 1965 model – in fact the roof-lines for the four-door pillared sedans and Safari wagons were the same as the 1965 models, while the two-door semi-fastback design gave way to a squared-off notch-back style and four-door hardtop sedans were also more squared off than 1967-68 models. 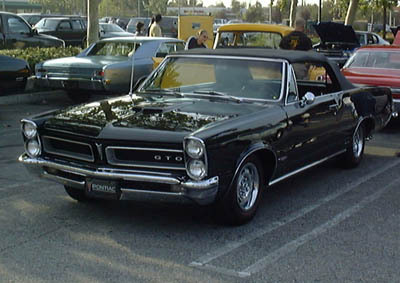 The GTOs and Firebirds received the Ram Air options, the GTO saw the addition of the “Judge” performance/appearance package, and the Firebird also got the “Trans Am” package. 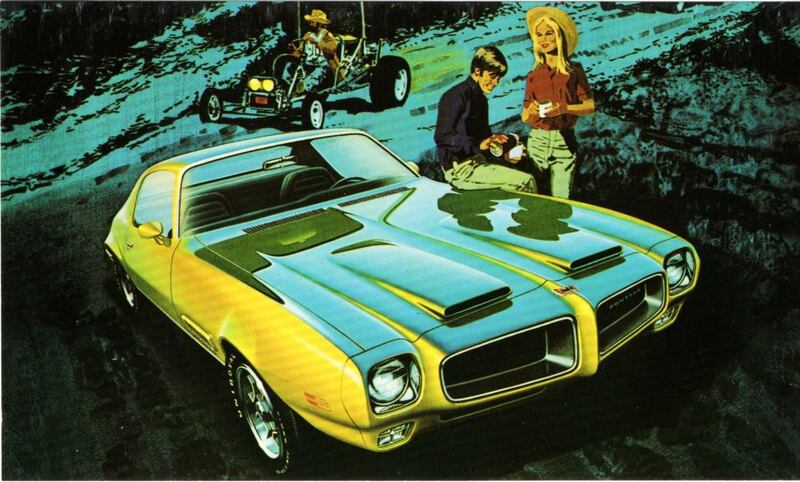 Although originally conceived as a 303 cubic inch model to compete directly in the Trans Am racing series, in a cost-saving move the Pontiac Trans Am debuted with the standard 400-cubic-inch performance engines. This year also saw De Lorean leaving the post of general manager to accept a similar position at GM’s Chevrolet division. His replacement was F. James McDonald. 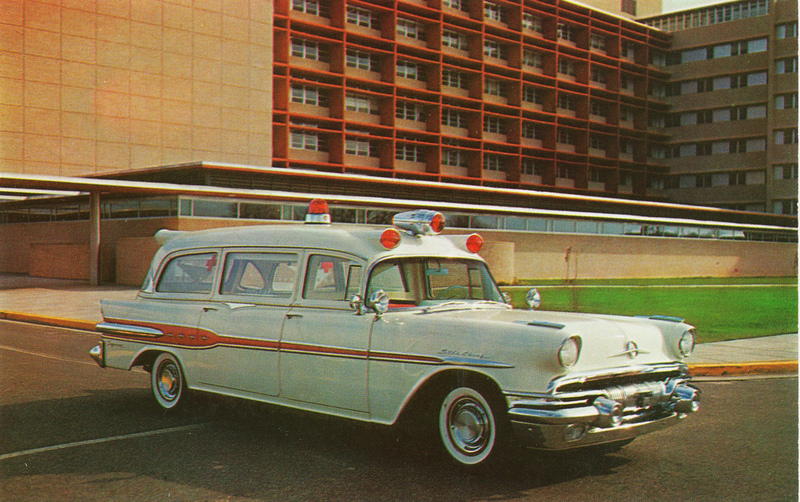 Pontiacs built in the late 1960s conformed to new US Federal safety standards. 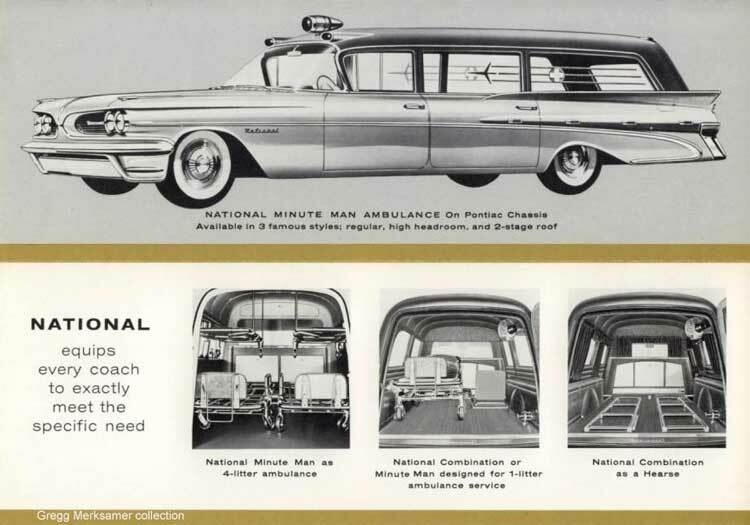 These included energy-absorbing interior parts such as steering columns, steering wheels, knobs and handles, dual-circuit hydraulic brake systems, shoulder belts, side marker lights, and headrests. 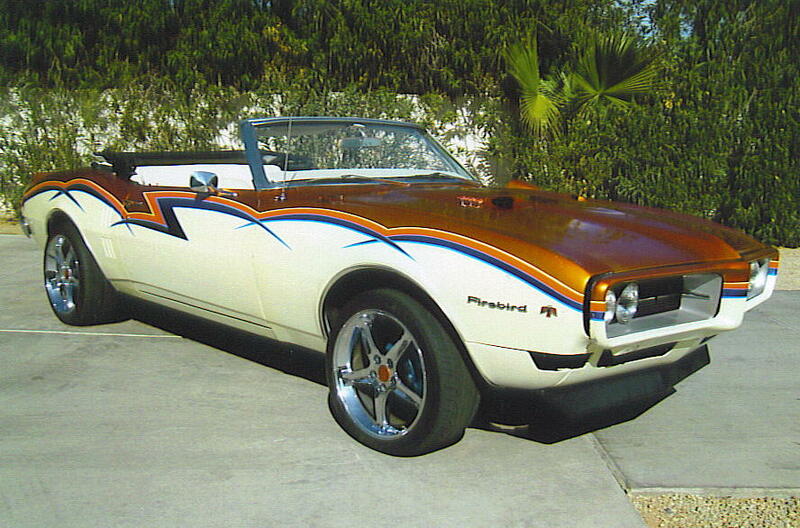 The 1969 Firebirds received a heavy facelift but otherwise continued much the same as the original 1967 model. It was the final year for the overhead cam six-cylinder engine in Firebirds and intermediates, and the Firebird convertible (until 1991). Production of the 1969 Firebirds was extended into the first three months of the 1970 model year (all other 1970 Pontiacs debuted Sept. 18, 1969) due to a decision to delay the introduction of an all-new 1970 Firebird (and Chevrolet Camaro) until after the first of the year – Feb. 26, 1970 to be exact. In addition in the late ’60s, GM directed their GM and Pontiac divisions to develop concept mini-cars called commuter car for urban drivers. 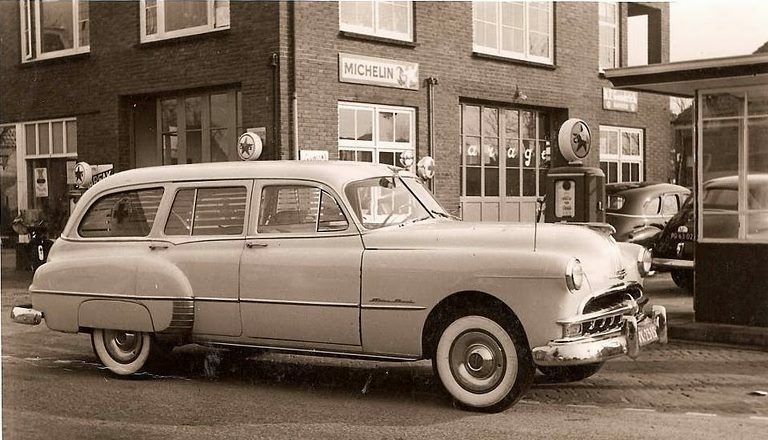 GM developed a gasoline-electric drive hybrid the XP-833 and Pontiac the X-1 a rear wheel mid engine car that was powered by a radical X-shaped aircraft type air-cooled two-stroke radial engine where the standard crankshaft was replaced by a unit called a Scotch yoke. 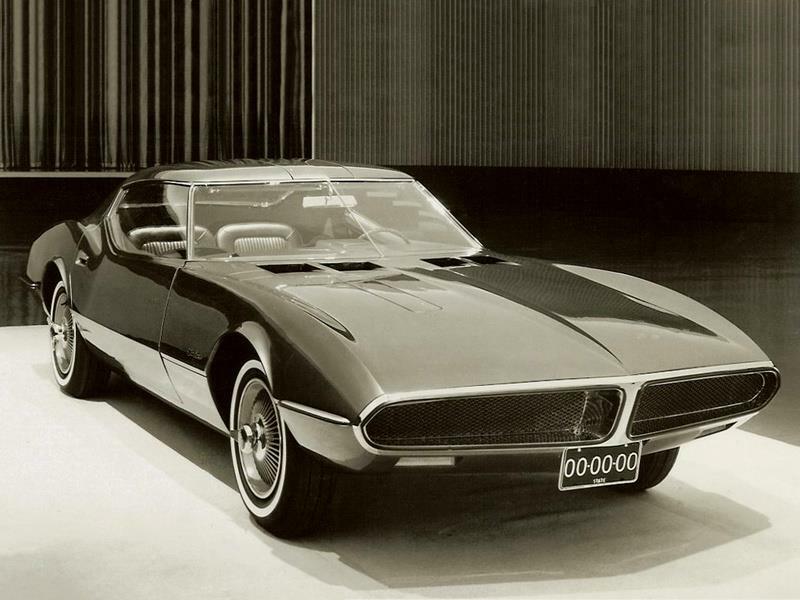 While the GM car was fully tested the Pontiac concept was not. Neither was placed in production. Increasing insurance and fuel costs for owners coupled with looming Federal emissions and safety regulations would eventually put an end to the unrestricted, powerful engines of the 1960s. Safety, luxury and economy would become the new watch-words of this decade. 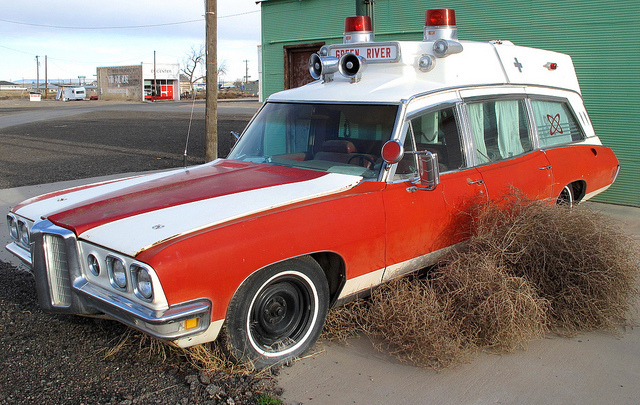 Engine performance began declining in 1971 when GM issued a corporate edict mandating that all engines be capable of using lower-octane unleaded gasoline, which led to dramatic drops in compression ratios, along with performance and fuel economy. 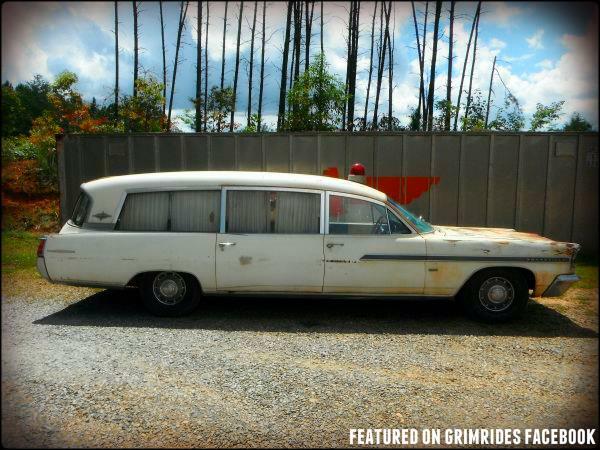 This, coupled with trying to build cars as plush as GM’s more luxurious Buicks and Oldsmobiles, contributed to the start of a slow decline of Pontiac in 1971. 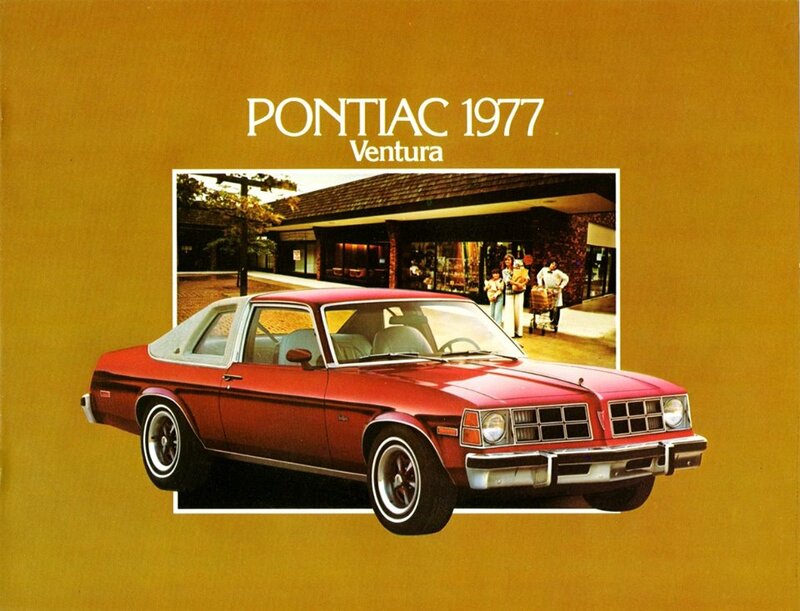 In mid-1971 Pontiac introduced the compact, budget-priced Ventura II (based on the third generation Chevrolet Nova). 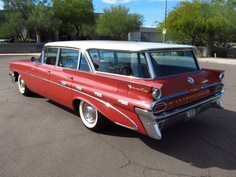 This same year, Pontiac completely restyled its full-sized cars, moved the Bonneville, and replaced it with a higher luxury model named the Grand Ville, while Safari wagons got a new clamshell tailgate that lowered into the body while the rear window raised into the roof. 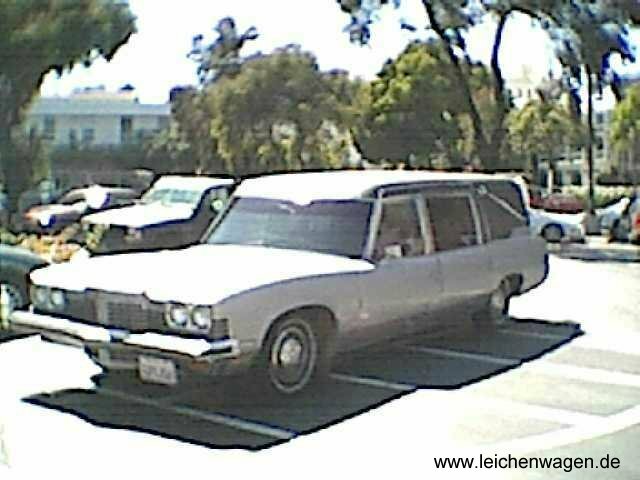 1971–1976 model full-size station wagons featured a ‘Clamshell’ design where the rear power-operated glass slid up into the roof as the tailgate (manually or with power assist), dropped below the load floor. 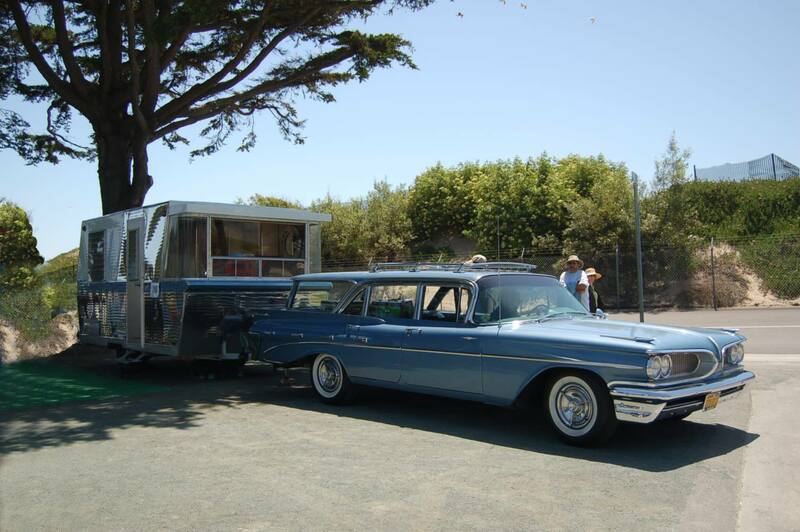 The power tailgate, the first in station wagon history, ultimately supplanted the manual tailgate, which required marked effort to lift from storage. 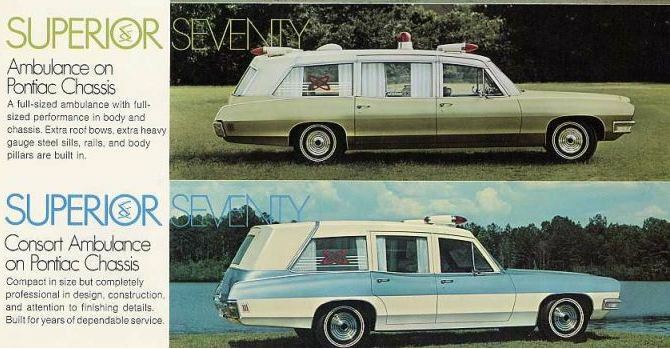 The 1972 models saw the first wave of emissions reduction and safety equipment and updates. 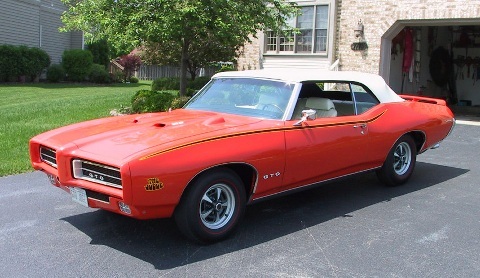 GTO was a now sub-series of the LeMans series. The Tempest, was dropped, after being renamed ‘T-37’ and ‘GT-37’ for 1971. 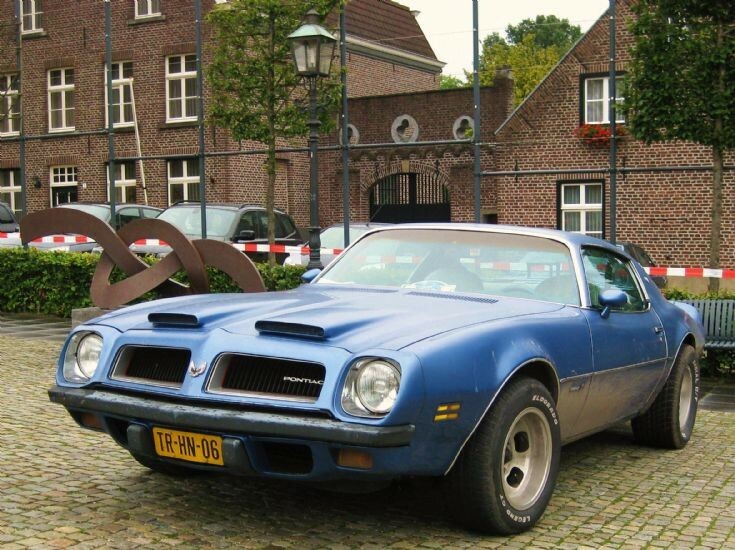 The base 1972 mid-sized Pontiac was now simply called LeMans. James MacDonald left the post of general manager to be replaced by Martin J. Caserio in late 1972. Caserio was the first manager in over a decade to be more focused on marketing and sales than on performance. 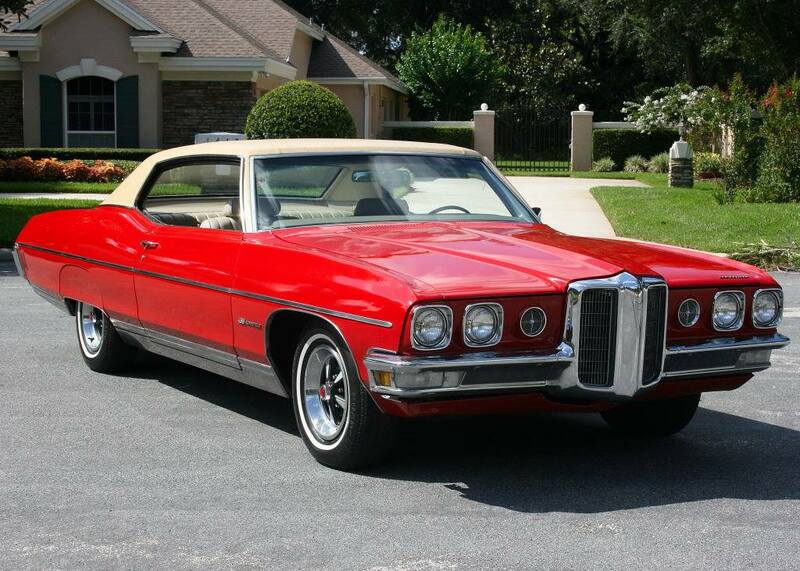 For 1973, Pontiac restyled its personal-luxury Grand Prix, mid-sized LeMans and compact Ventura models and introduced the all-new Grand Am as part of the LeMans line. All other models including the big cars and Firebirds received only minor updates. Again, power dropped across all engines as more emissions requirements came into effect. 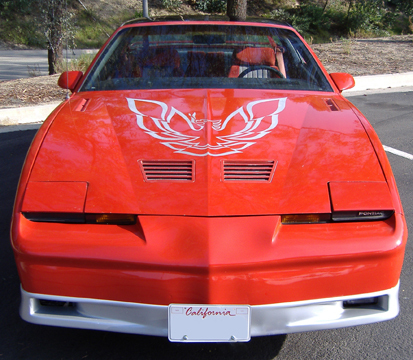 The 1973 Firebird Trans Am’s factory applied hood decal, a John Schinella restylized interpretation of the Native American fire bird, took up most of the available space on the hood. Also in 1973, the new Super Duty 455 engine (“Super Duty” harkening back to Pontiac’s Racing Engines) was introduced. Although it was originally supposed to be available in GTOs and Firebirds, only a few SD 455 engines made it into Firebird Trans Ams that year. 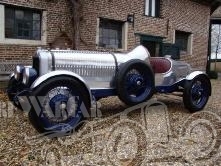 One so equipped was tested by ‘Car and Driver’ magazine, who proclaimed it the last of the fast cars. But the pendulum had swung, and the SD 455 only hung on one more year in the Trans Am. 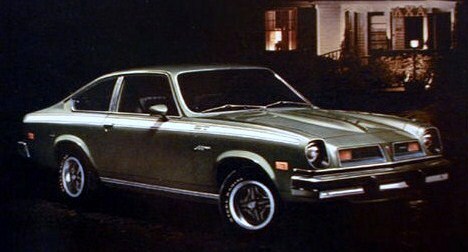 For 1975, Pontiac introduced the new sub-compact Astre, a version of the Chevrolet Vega. This was the brand’s entry into the fuel economy segment of the market. Astre had been sold exclusively in Canada from 1973. 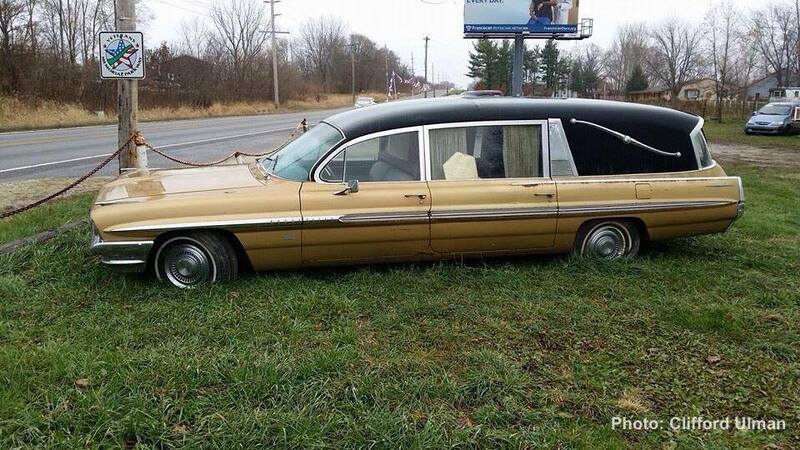 It was offered through the 1977 model year. 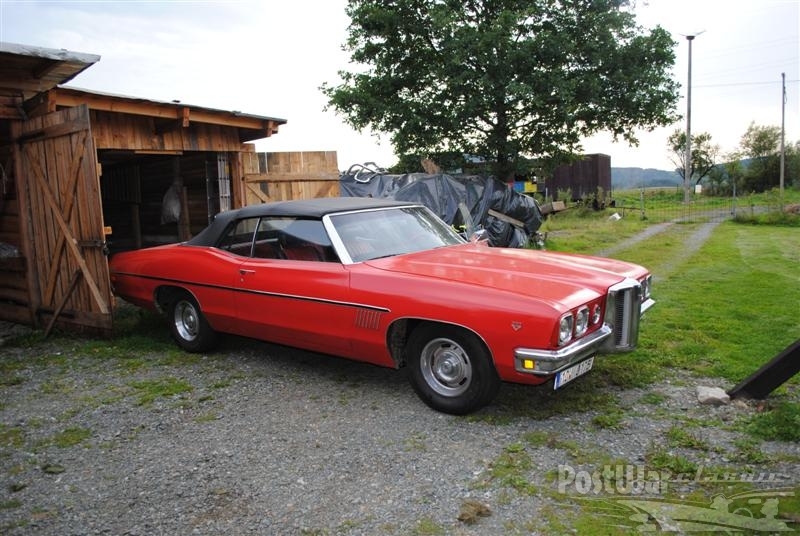 1975 would also see the end of Pontiac convertibles for the next decade. 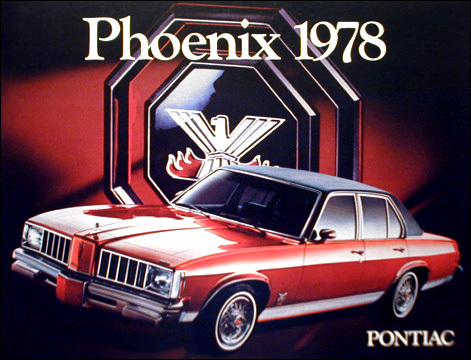 For 1977, Pontiac replaced the Ventura with the Phoenix, a version of Chevrolet’s fourth generation Nova. 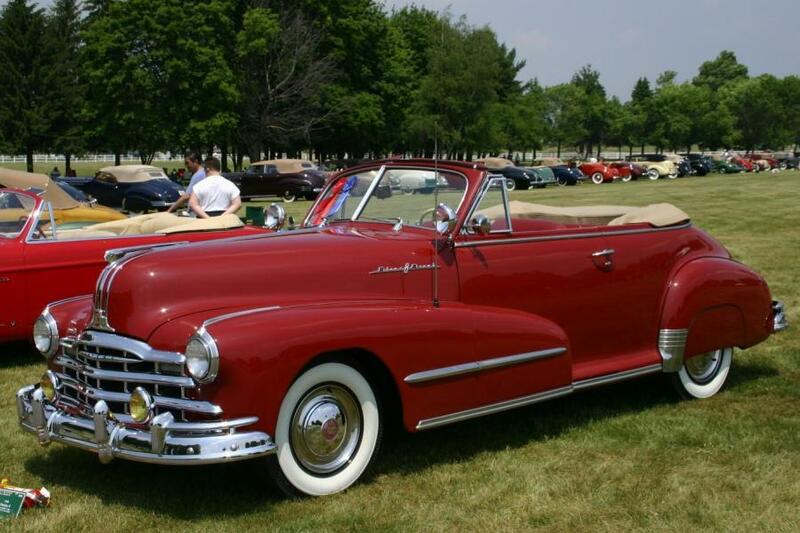 Pontiac also introduced its 151 cubic inch “Iron Duke” 4-cylinder overhead valve engine. 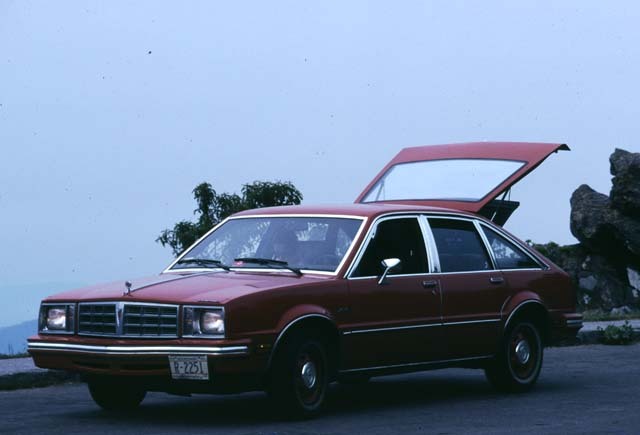 It was first used in the 1977 Astre, replacing Astre’s aluminum-block 140 cubic inch Vega engine. The ‘Iron Duke’ engine would later go into many GM and non-GM automobiles into the early 1990s. 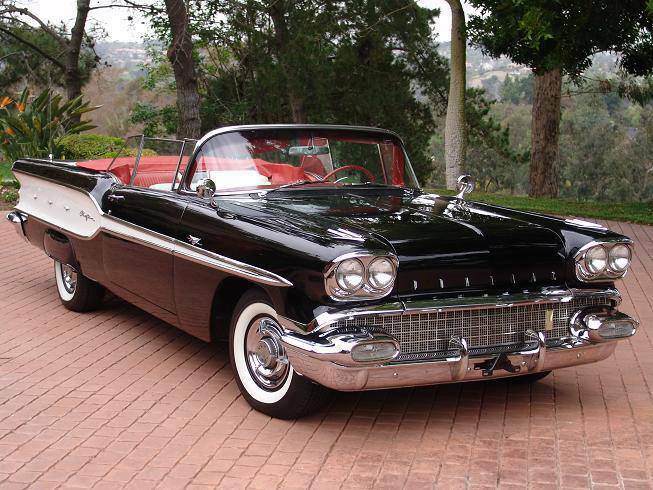 The 151 cubic inch L4 and the 301 cubic inch V-8 were the last two engines designed solely by Pontiac. Subsequent engine design would be accomplished by one central office with all designs being shared by each brand. 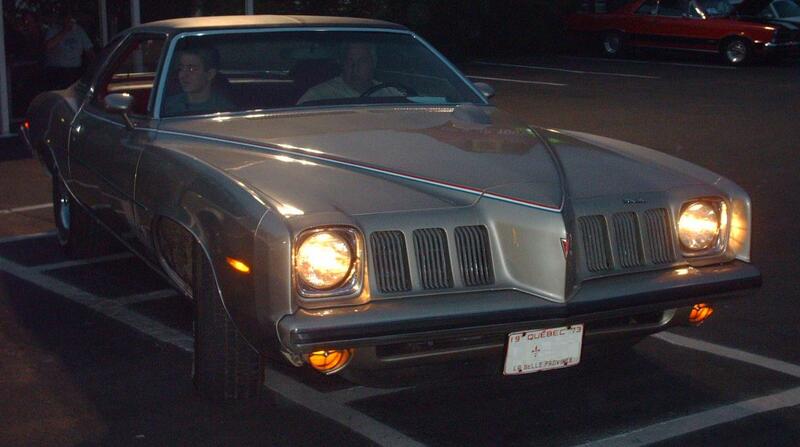 For model year 1977, the full sized Pontiacs received the same “downsizing” as GM’s other “B” body cars. 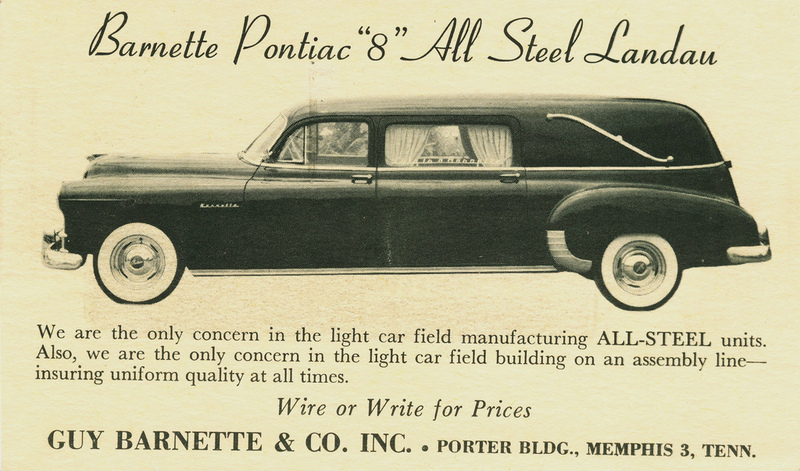 The new Bonnevilles and Catalinas continued to be best-sellers, although their styling similarity to the Chevrolet Caprice was seen by some buyers as a “cheapening” of Pontiac’s image. In 1981, the full-size Bonneville was discontinued, the name reassigned to the “A” body intermediate platform. 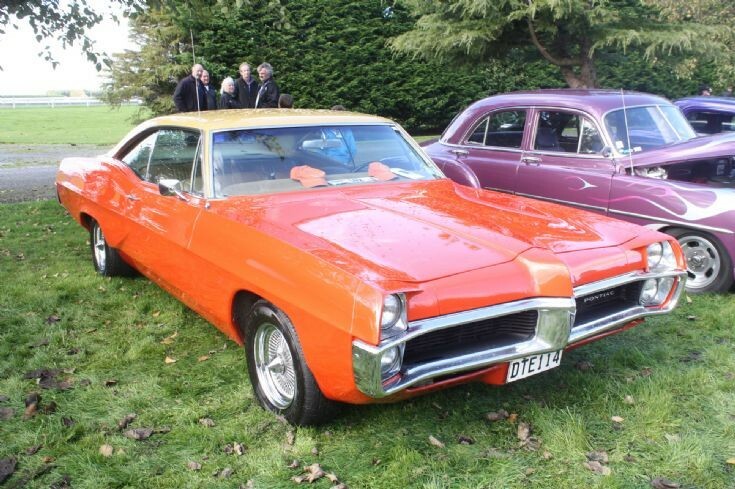 That left the Catalina as the only big Pontiac, further reducing sales as buyers went for more plushness. 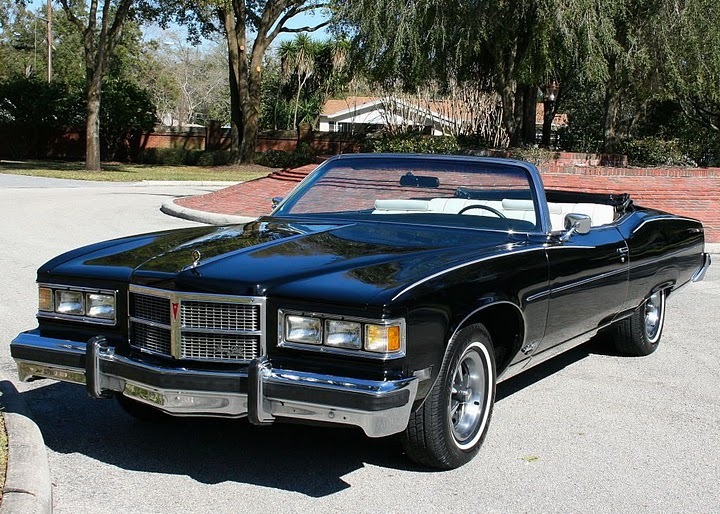 The remainder of the 1970s and the early 1980s saw the continued rise of luxury, safety and economy as the key selling points in Pontiac products. 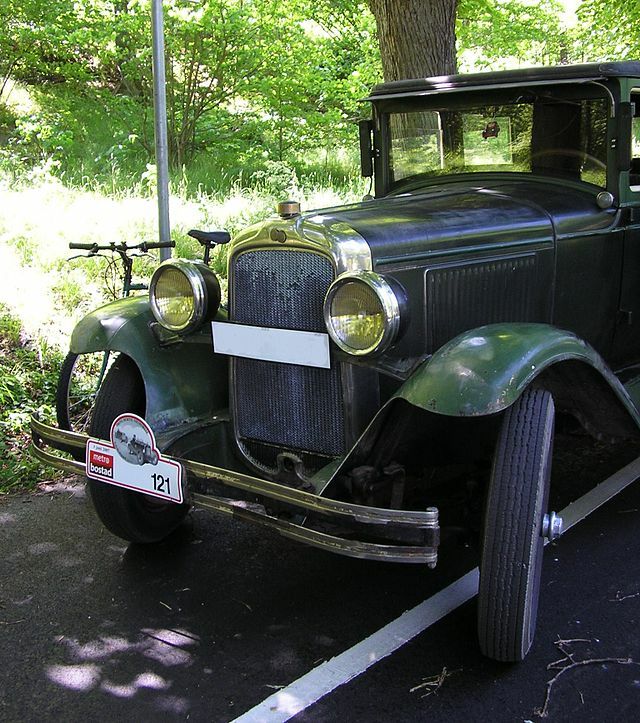 Wire-spoked wheel covers returned for the first time since the 1930s. 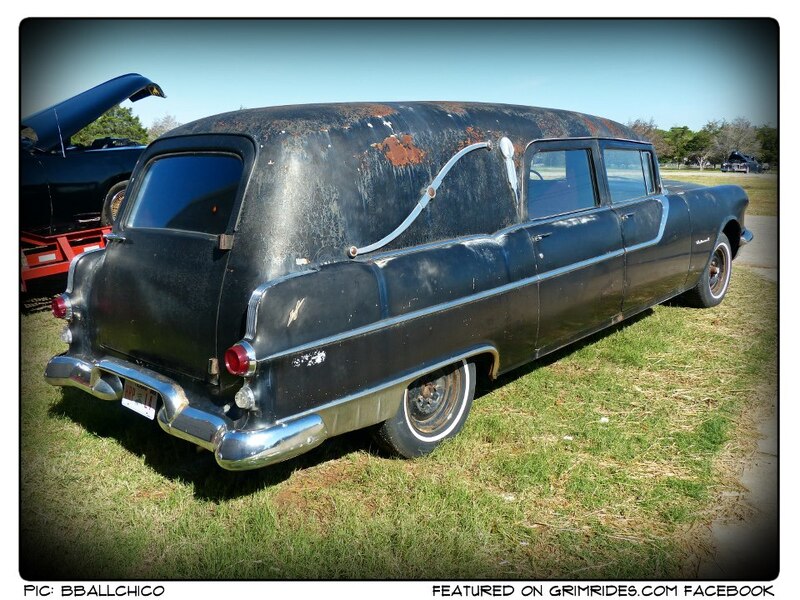 More station wagons than ever were being offered. 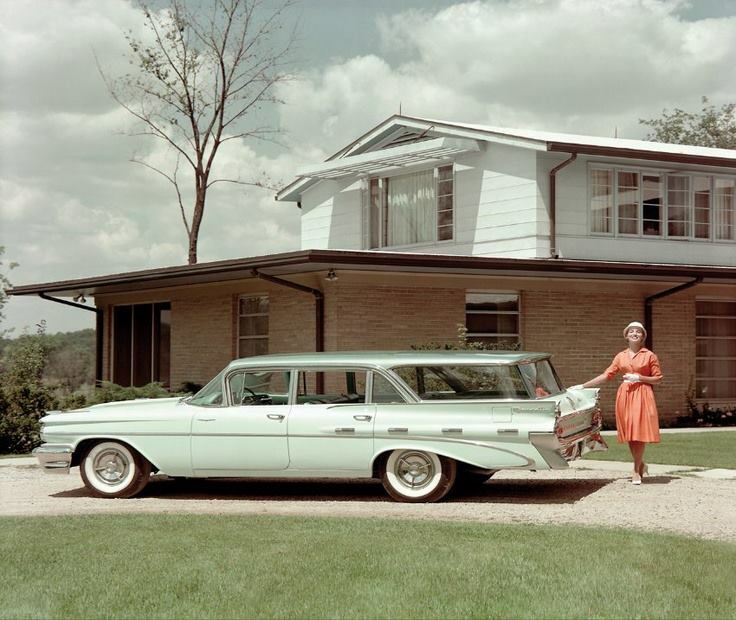 Padded vinyl roofs were options on almost every model. Rear-wheel drive began its slow demise with the introduction of the first front-wheel drive Pontiac, the 1980 Phoenix (a version of the Chevrolet Citation). 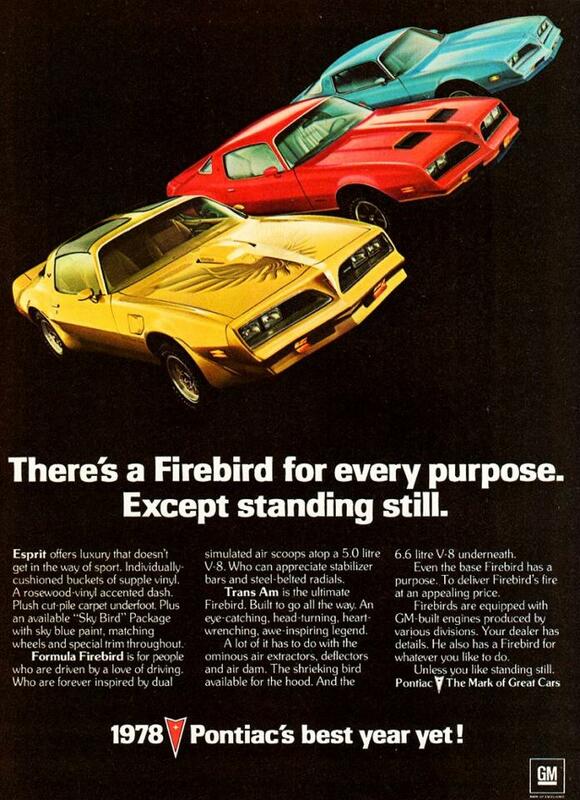 The Firebird continued to fly high on the success of the ‘Smokey and the Bandit‘ film, still offering Formula and Trans Am packages, plus a Pontiac first- a turbocharged V-8, for the 1980 and 1981 model years. 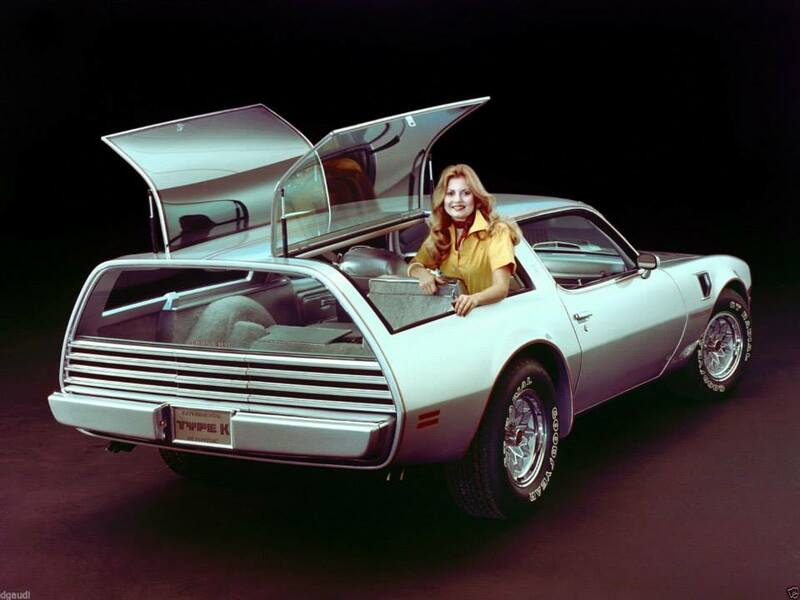 In addition to this, The Rockford Files, which lasted for 6 years used an Esprit Firebird. 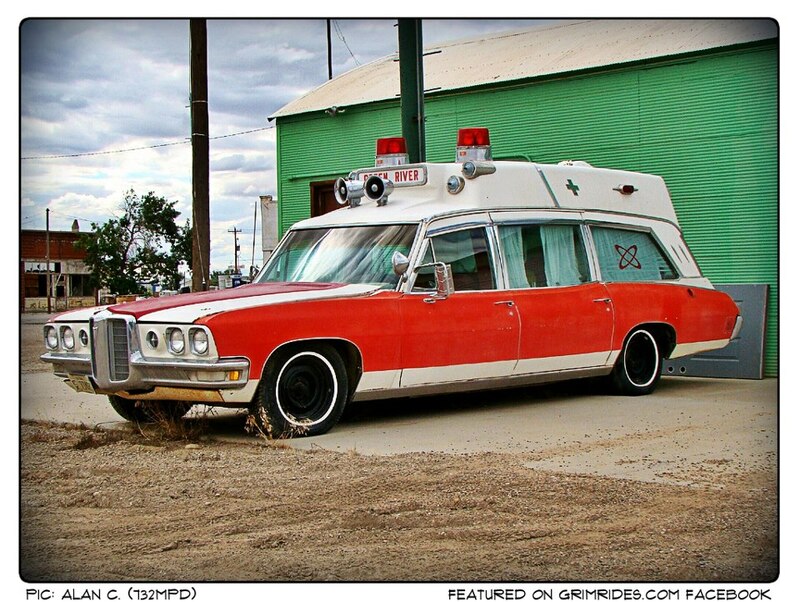 James Garner was given a new model each year, which was resprayed and painted. But he disapproved of the front facelift. The turn which he performed throughout the show were all his own stunts and came to be known as the Rockford Turn or J Turn. 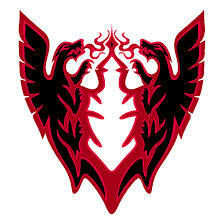 Introduced in 1982, the wedge shaped Firebird was the first major redesign of the venerable pony car since 1970. 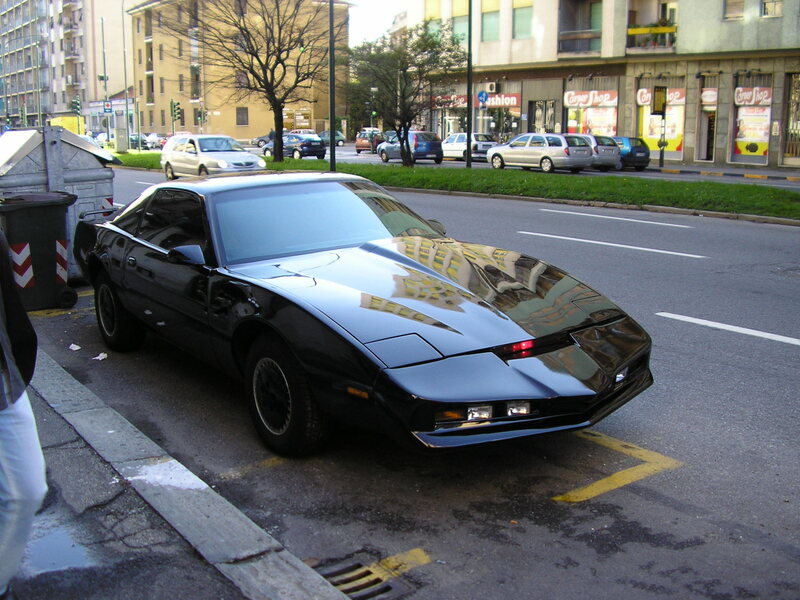 Partly due to the hugely successful NBC television series Knight Rider, it was an instant success and provided Pontiac with a foundation on which to build successively more performance oriented models over the next decade. 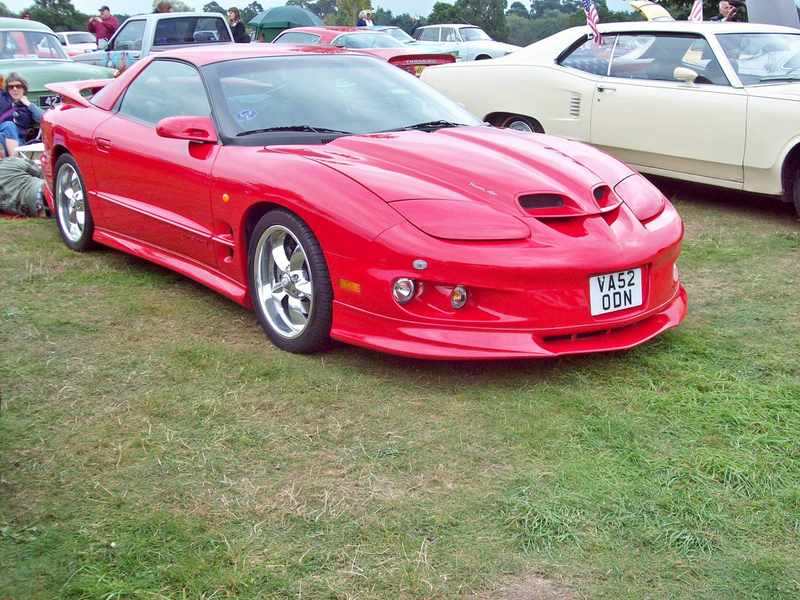 The Trans Am also set a production aerodynamic mark of .32 cd. 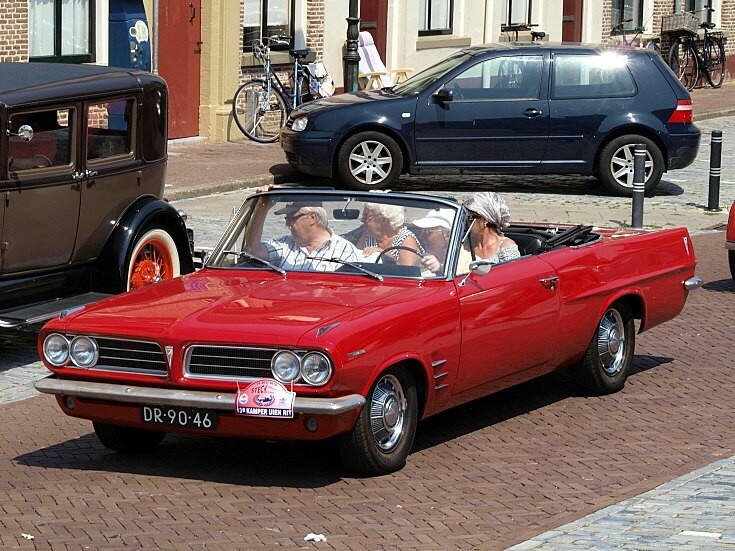 The next step in Pontiac’s resurgence came in the form of its first convertible in nine years. GM adapted the J-body cars. The all-new for 1982 J2000 (later renamed Sunbird) had a convertible as part of its line. 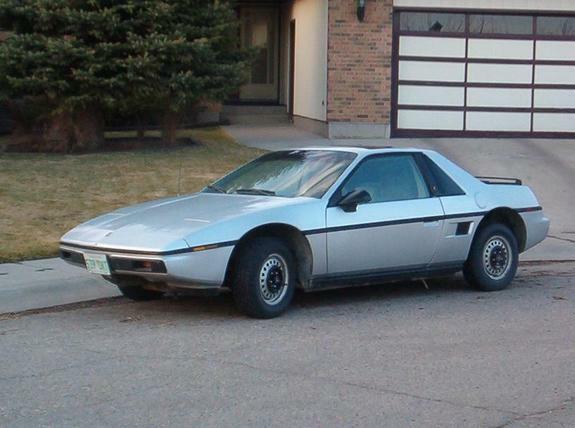 Next came the 1984 Fiero. This was a major departure from anything Pontiac had produced in the past. 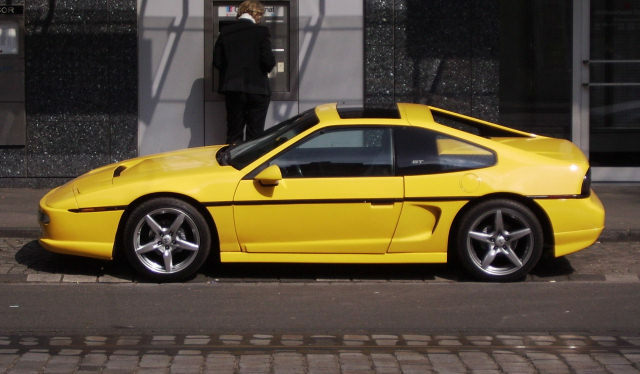 A two-seat, mid-engined coupe, the Fiero was targeted straight at the same market that Semon Knudsen had been aiming for in the late 1950s: the young, affluent buyer who wanted sporting performance at a reasonable price. 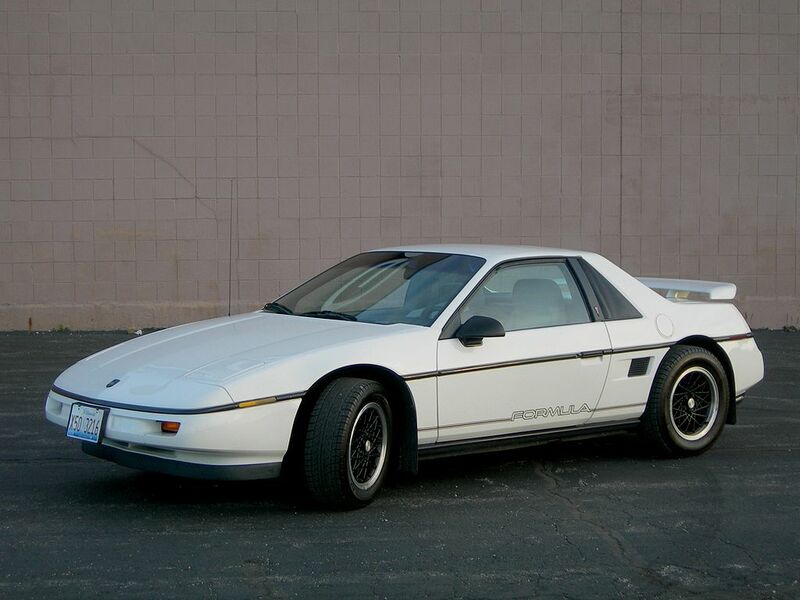 The Fiero was also an instant success and was partially responsible for Pontiac seeing its first increase in sales in four years. 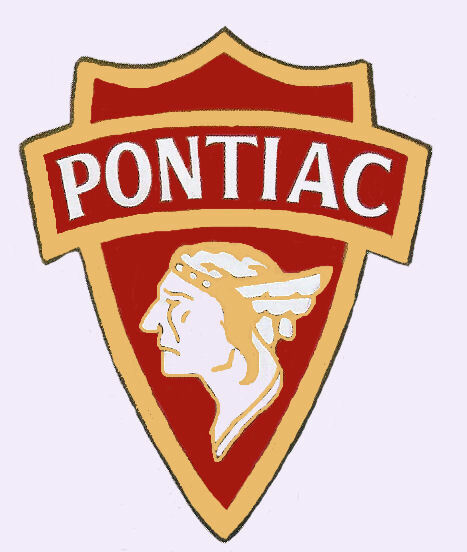 Pontiac also began to focus on technology. In 1984, a Special Touring Edition (STE) was added to the 6000 line as a competitor to European road cars such as the Mercedes 190. The STE sported digital instruments and other electronics as well as a more powerful V-6 and retuned suspension. 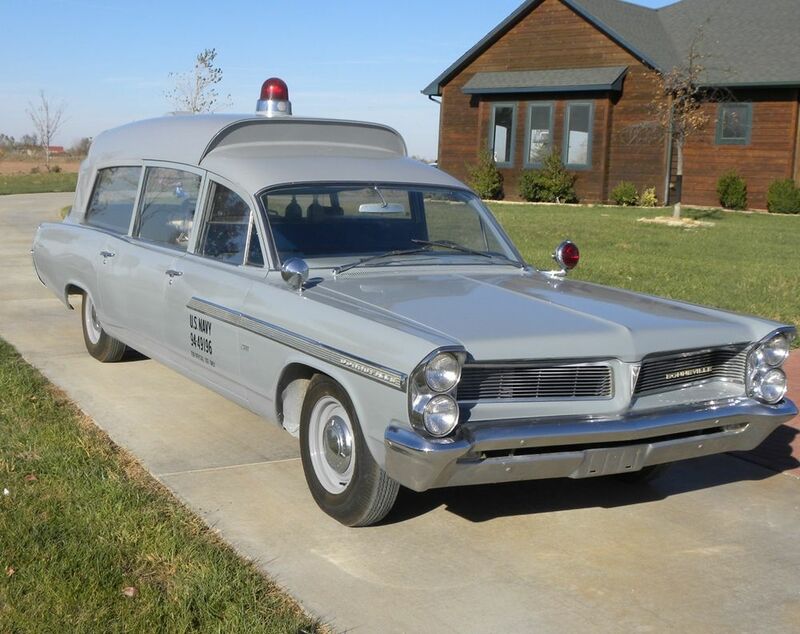 Later iterations would see some of the first introductions on Pontiacs of anti-lock brakes, steering wheel mounted radio controls and other advanced features. 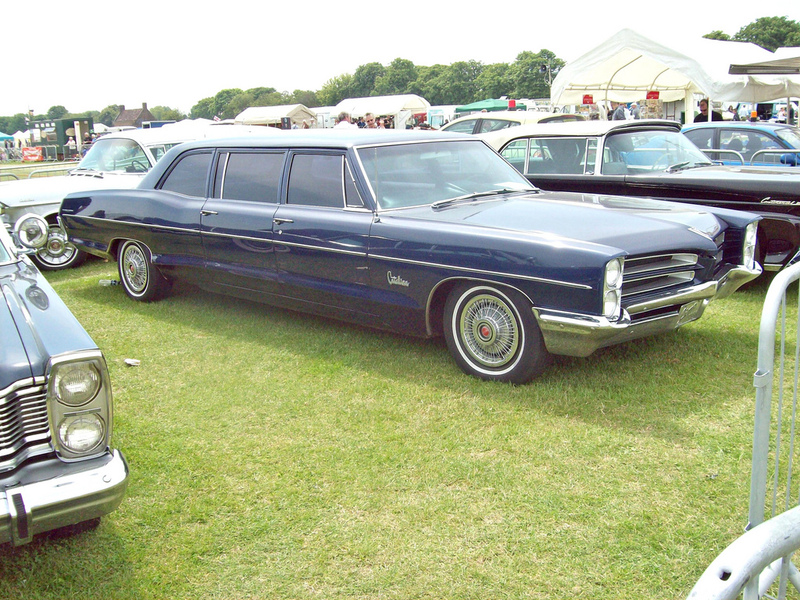 Full size buyers, disappointed by the lack of an available big Bonneville, complained, resulting in Pontiac’s importing the Canadian-market Pontiac Parisienne, which featured the Bonneville’s deluxe trim. 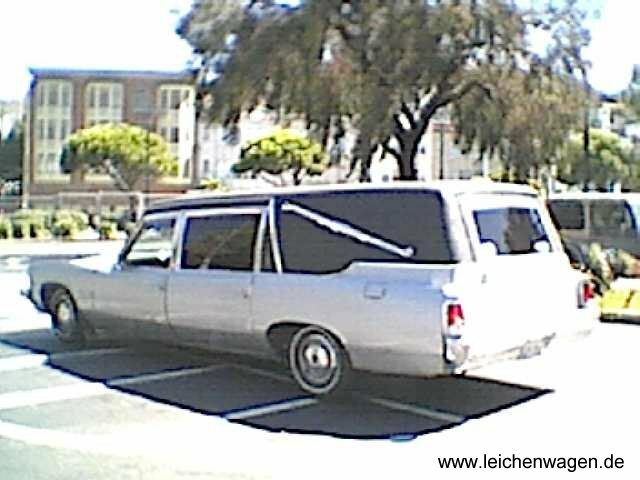 This car, although a Pontiac in name, was no more than a slightly re-trimmed Caprice. 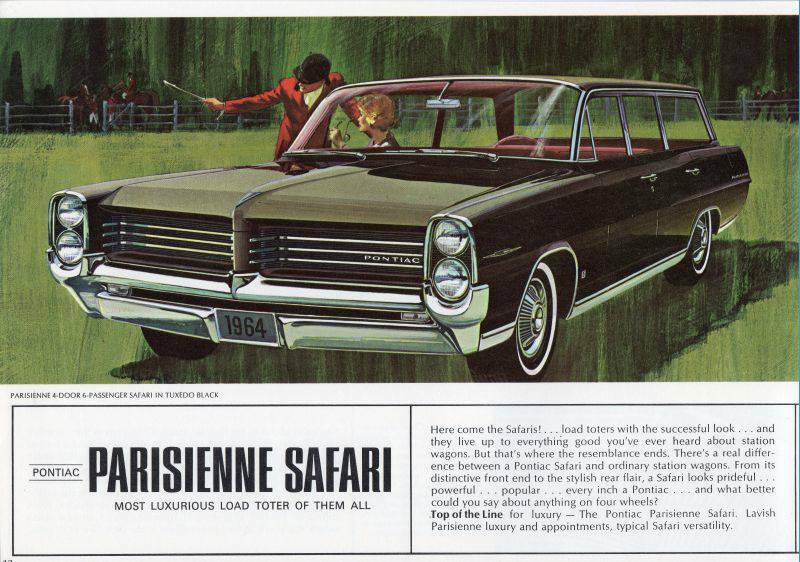 Despite this fact, the Parisienne sold in profitable numbers and this car continued in production until 1986 for the sedan, and 1989 for the Safari station wagon. With the exception of the Parisienne Safari, the Firebird and Fiero, beginning in 1988 all Pontiacs switched to front-wheel drive platforms. 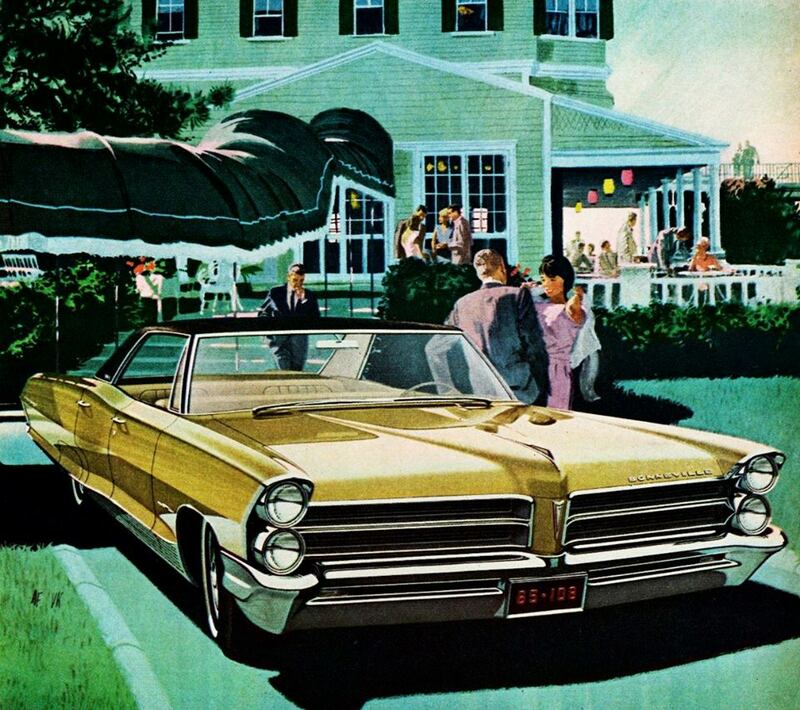 For the first time since 1970, Pontiac was the number three domestic car maker in America. Pontiac’s drive to bring in more youthful buyers was working as the median age of Pontiac owners dropped from 46 in 1981 to 38 in 1988. Although updating and revamping continued throughout the 1990s, the vast change seen during the 1980s did not. The period between 1989 and 1997 can best be described as one of continuous refinement. 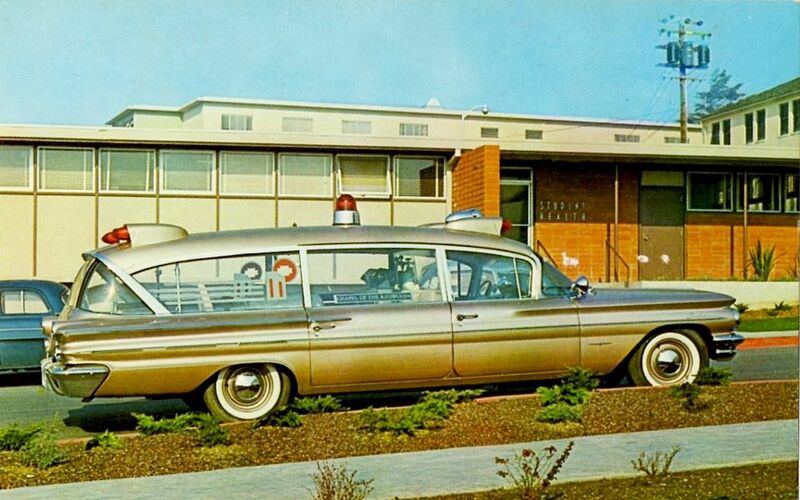 Anti-lock brakes, GM’s Quad-4 engine, airbags and composite materials all became standard on Pontiacs during this time. All new models were produced but at more lengthy intervals. 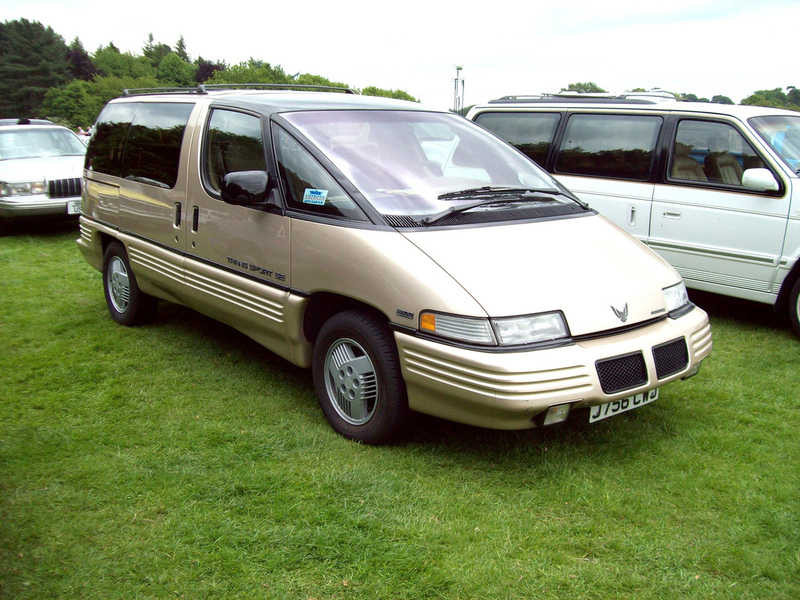 The 1990 model year saw the launch of Pontiac’s first minivan and light truck, the Trans Sport. The Sunbird was replaced with the (still J-body) Sunfire in 1995. Most significantly, an all new Firebird bowed in 1993. 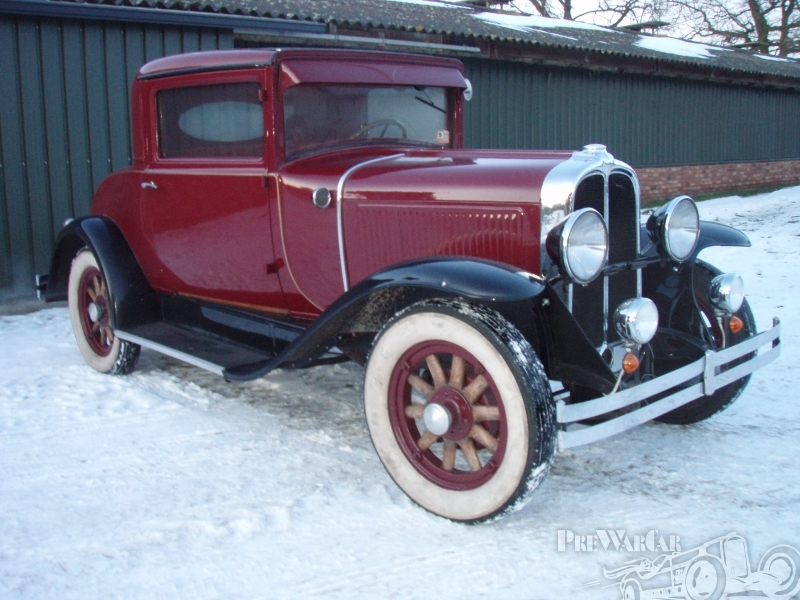 It was powered by either a 3.4L V6 with 160 hp (120 kW), or in TransAm guise a 275 hp (205 kW) LT-1, a 5.7L (350c.i.) V8, and could be backed by a T-56 six-speed manual (which was similar to the transmission found in contemporary Corvettes and Vipers). 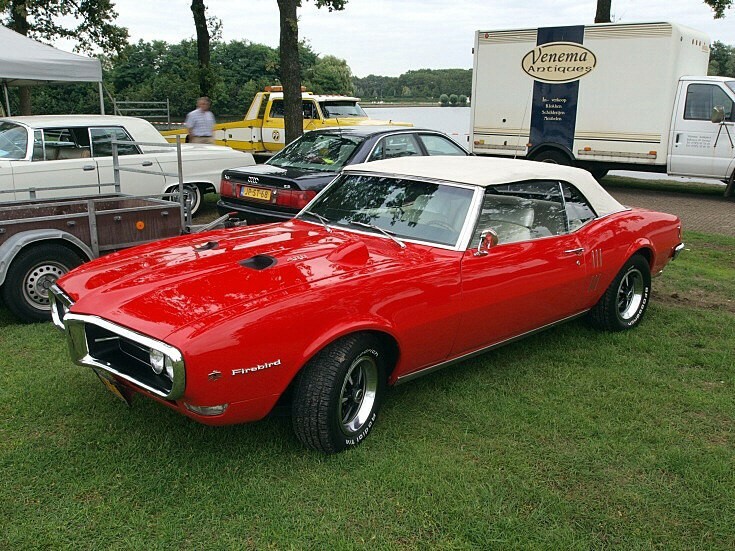 This new Firebird easily outperformed its main rival, the Ford Mustang, but did not do as well in the marketplace due to the Mustang’s superior image and refinement, particularly in the interior. 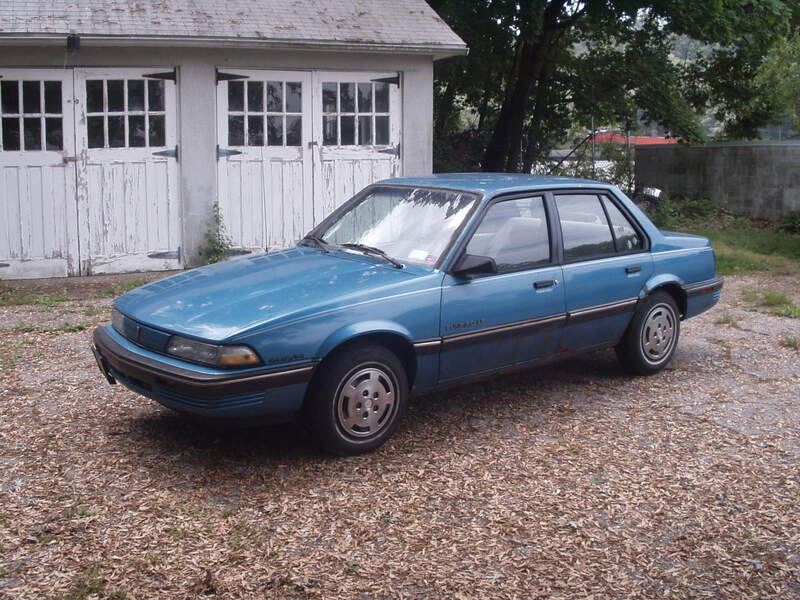 1992 saw the introduction of a brand-new Bonneville. 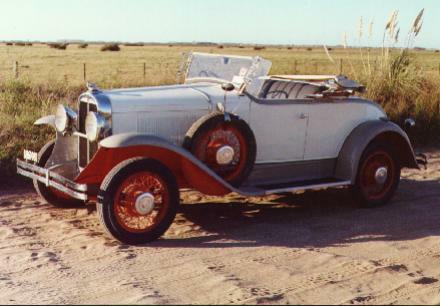 This full-size model featured aerodynamic styling, large expanses of curved glass, front-wheel drive, and a V6 as standard equipment. 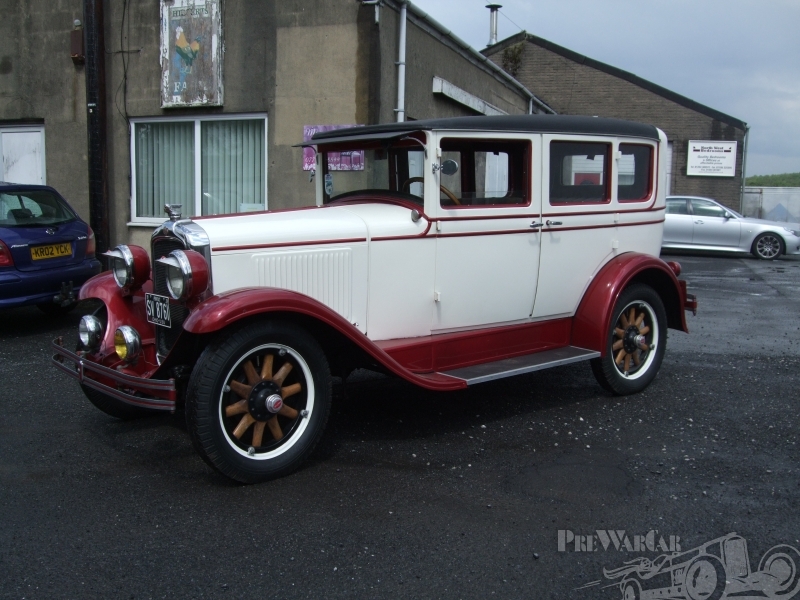 This model proved popular and continued in production into the 21st century. Beginning in 1996, Pontiac began mining its historic past. This was the last year for the 6th-generation Grand Prix. 1997 led the way for an all-new Grand Prix, which debuted with the Wide Track chassis making a return spearheaded by the “Wider is Better” advertising campaign. In addition, the GTP trim level was added to the Grand Prix. It featured a supercharged 3.8L V6 putting out 240 hp (180 kW) and 280 lb·ft (380 N·m) of torque. 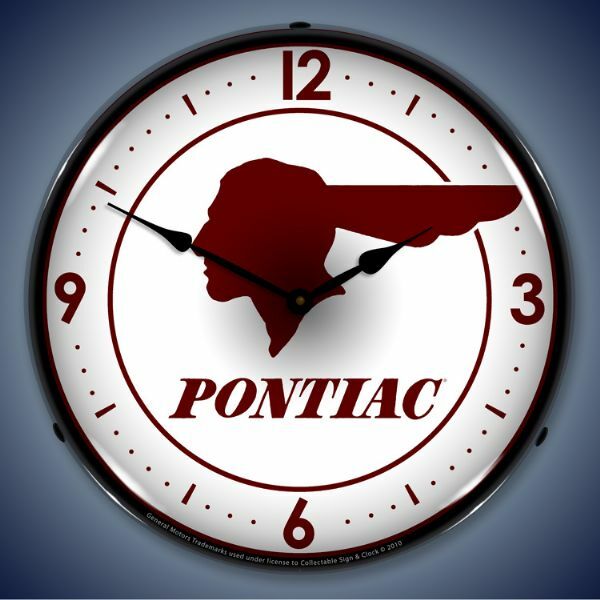 Pontiac was back to the days of fast cars. 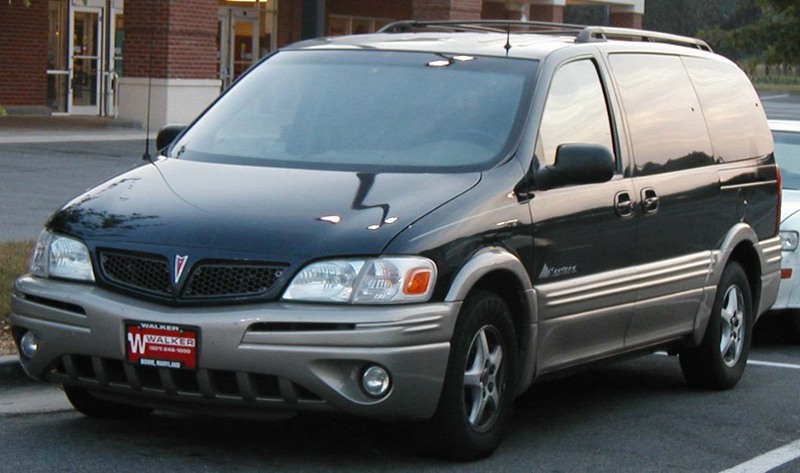 The 1999 model year saw the replacement of the Trans Sport with the larger Montana minivan. The year 2000 marked the first redesign of the Bonneville, since 1992. 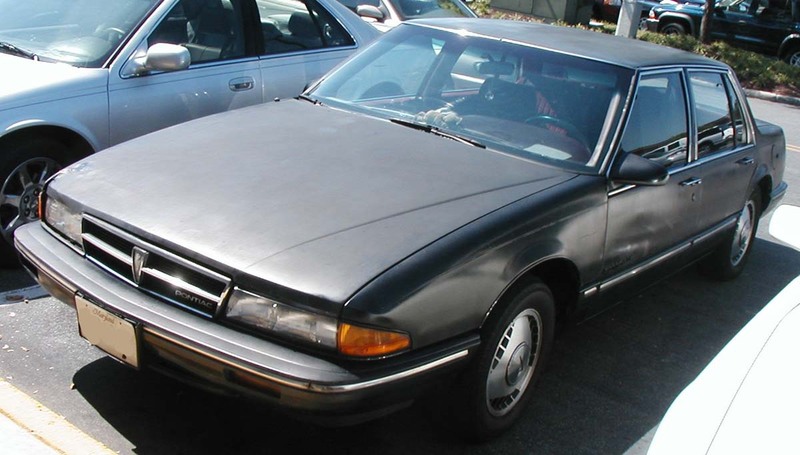 Based on the G-Body, the same as the Oldsmobile Aurora and Buick LeSabre, the car was more substantial feeling all around. 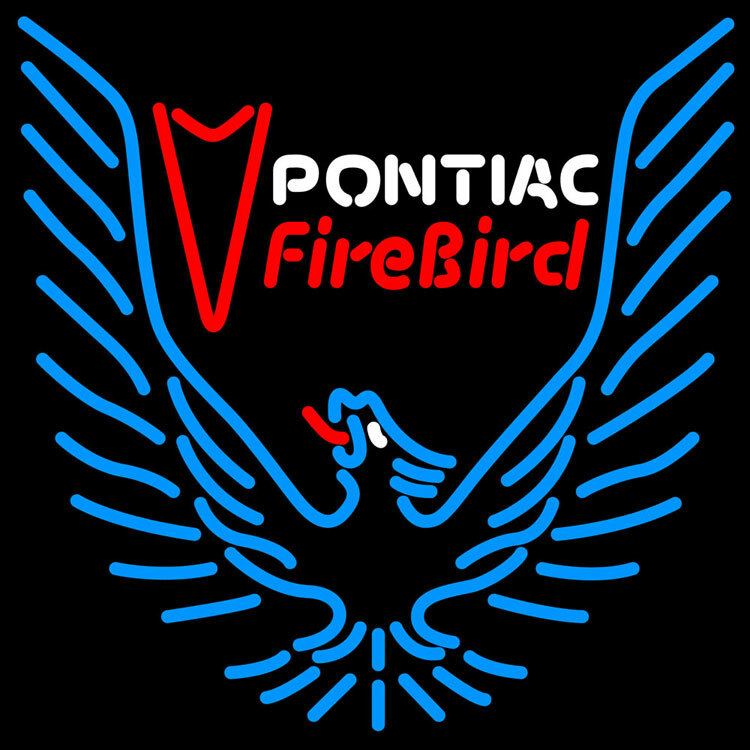 In 1998 the Firebird was updated. It featured sleeker styling and improved amenities. The TransAm received the LS-1 motor which produced 305 hp (227 kW). The WS6 option saw this number increase to 320 hp (240 kW) and the addition of Ram Air and stiffer springs. Though these ratings have been proven to fall short. Dyno tests over the years since release have confirmed that all trim levels with the LS1 have closer to 350 hp. However, despite handily outperforming the redesigned 1999 Mustang, the Firebird was not nearly as large a sales success. 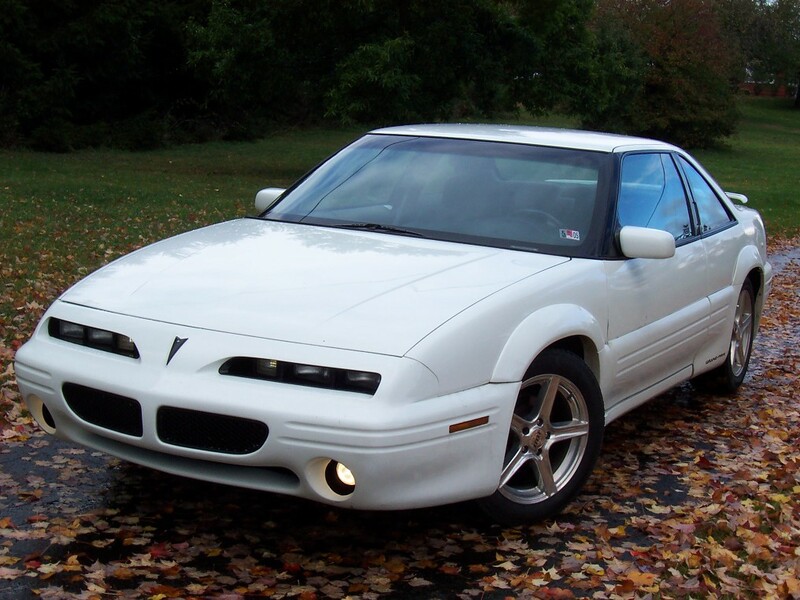 In 2002 both the Firebird/Trans Am and Camaro were discontinued as a result of declining sales and a saturated sport market. The coupe version of the Grand Prix was also discontinued. In 2003, it was announced that the Grand Prix would be in its last year of its generation, with an improved 7th generation on the way for 2004. 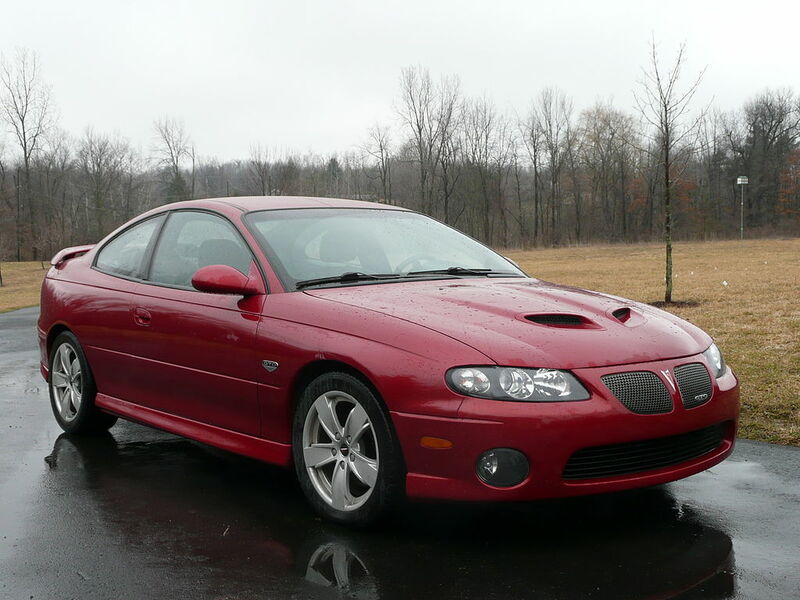 In 2004 the re-introduction of the Pontiac GTO (based on the Holden Monaro from Australia) took place, effectively replacing the spot left by the Firebird and Camaro. 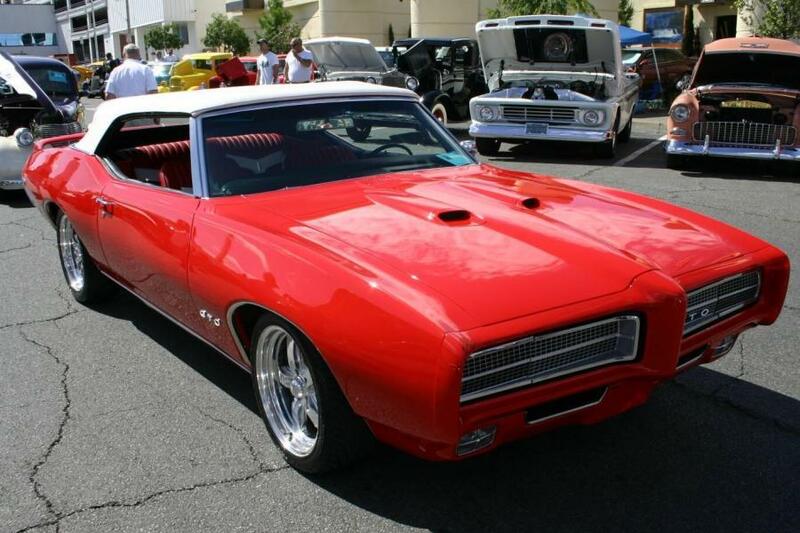 The GTO was also initially powered by the 350 HP LS-1 V8 in 2004. 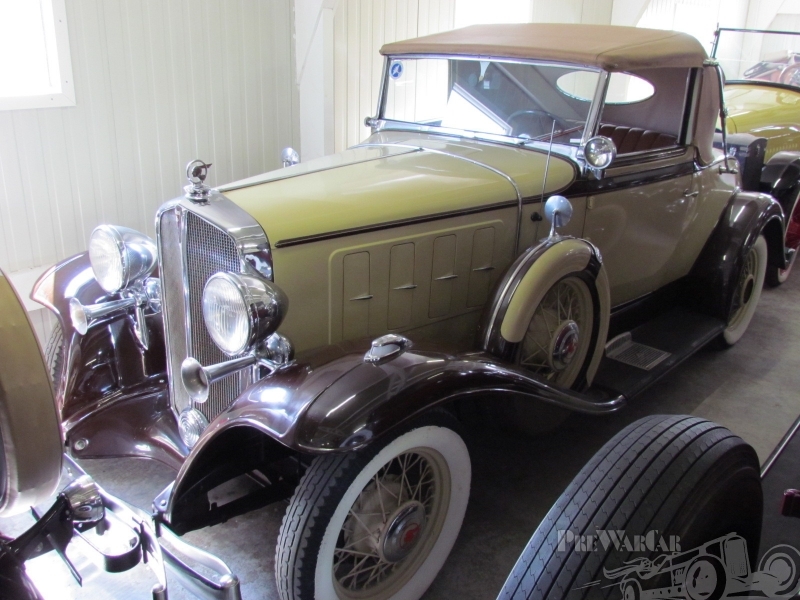 It had an independent front and rear suspension and an upscale full leather interior. Its clean lines and understated looks drew some criticism but those that actually drove the car found it to be a quite capable grand tourer. Sales were average and consistently sold in the mid tens of thousands for all three years but did not reach the 18,000 units that GM predicted. Initial dealer mark ups, slow shipping transit from Australia, and lack of advertisement by GM were to blame. Due to the retirement of the LS1 engine in 2004, Pontiac added the drive-by-wire 400 HP LS2 V8 for 2005–2006 model years at no additional cost. Additional upgrades also consisted of stainless steel dual exhaust outlets, larger corvette sourced PBR brakes with EBD, larger front vented rotors with vented rear rotors, and functional heat extractor hood scoops to cater to some of the critics that the 2004 model may have been too plain compared to traditional muscle cars like the 2005 retro-themed Mustang. 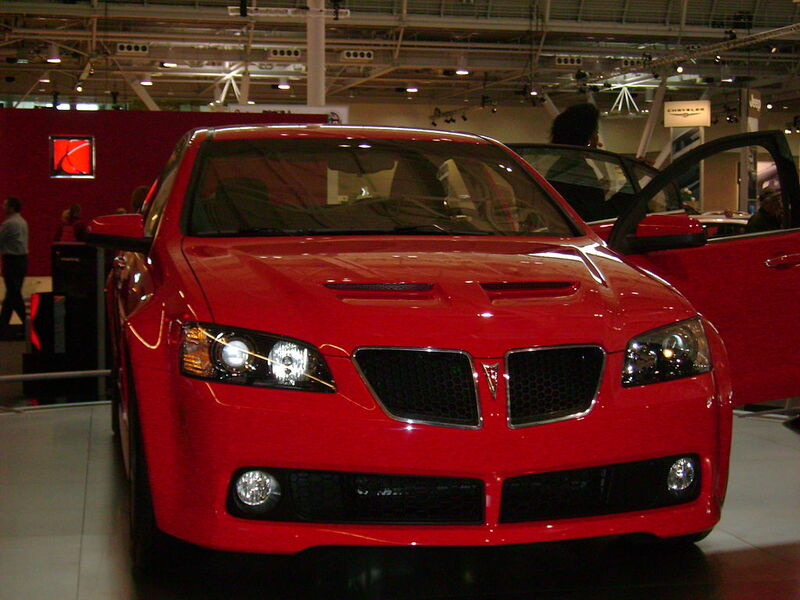 For the Bonneville, the GXP trim level was introduced, replacing the SSEi name. 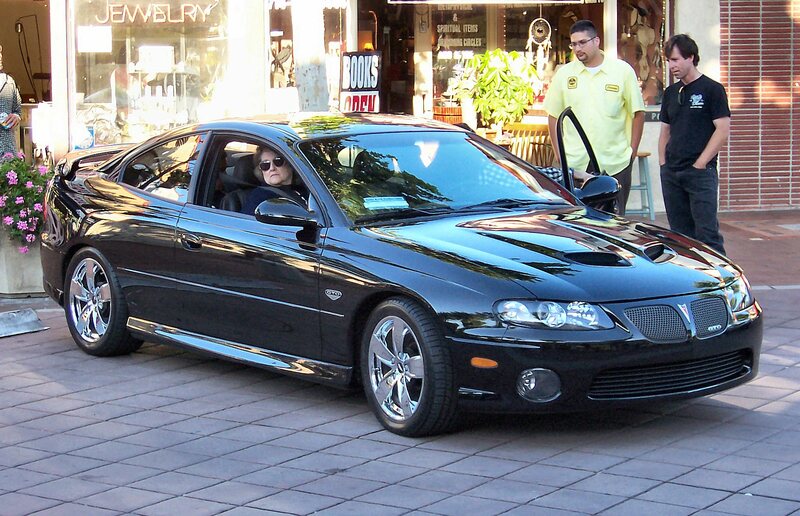 The Bonneville GXP featured a 4.6 Northstar V8, borrowed from Cadillac, and replaced the Supercharged 3800 Series II. 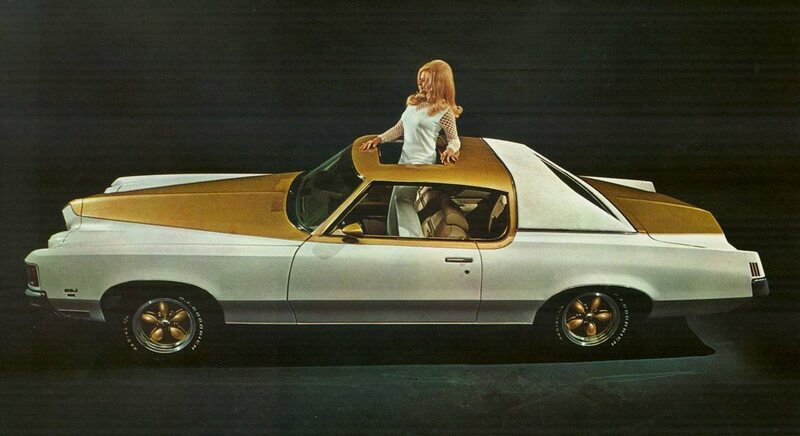 The redesigned Grand Prix made its appearance, and featured a GT and GTP trim level. The GTP’s new 3.8L supercharged V6 now made 260 horsepower (190 kW), up 20 from the previous generation. TAPshift was also introduced as well as a Competition Group package (Comp G). 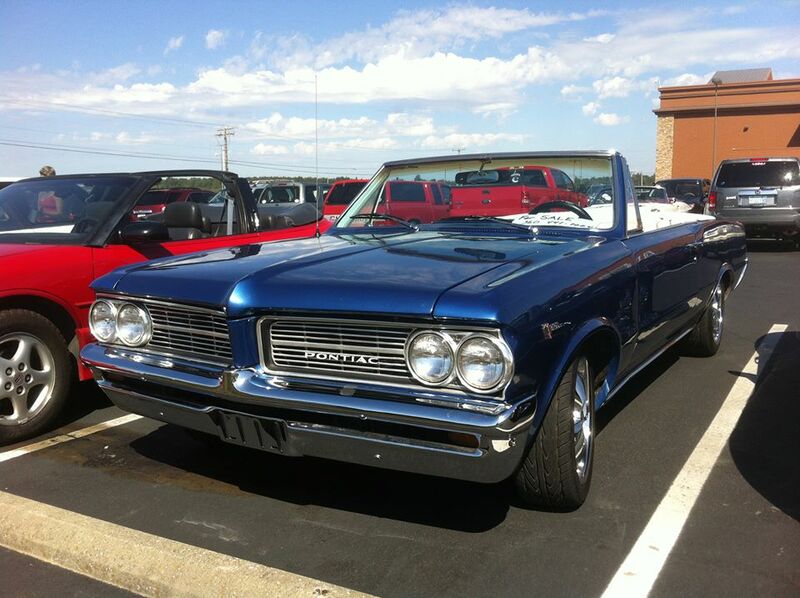 Pontiac went through a complete product revamping through this period. The Grand Am was replaced with the mid-size G6 in 2004. The Bonneville ended production in 2005 after nearly 50 years of production. Although it was not directly replaced, the RWD G8 served as an initial replacement. The Solstice concept shown in 2002 was approved for production as a roadster (2006-2009) and, for a few months, a hard-top coupe (2009), which is considered to be quite rare, as a total of only 1,266 coupes made it off the assembly line in Wilmington, DE before it was shut down due to the demise of Pontiac. This is in stark contrast to the over 64,000 Solstice Convertibles that were manufactured on that same line. The controversial and slow-selling Aztekwas finally phased out and replaced by the Torrent, which was identical to the Chevrolet Equinox. 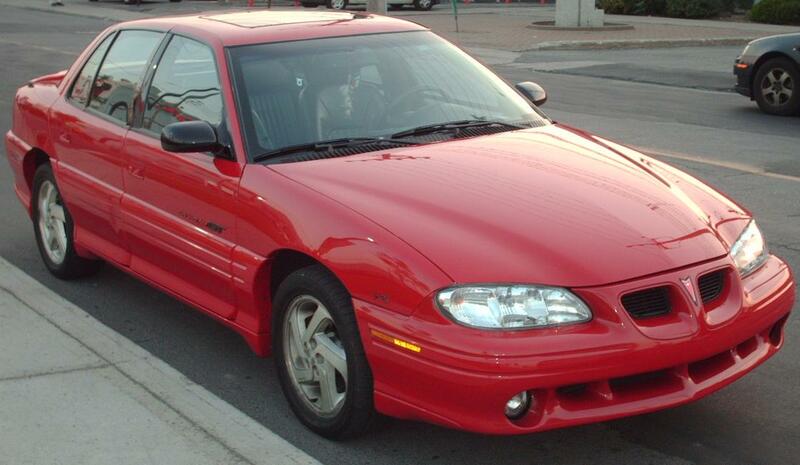 In 2005 the Sunfire was discontinued, replaced by the new Pontiac Pursuit (later named G5). The Grand Prix ended production in 2008 and the launch of the Australian-built RWD G8 commenced. The G8 gained positive reception for its high performance and low costs. Many noted the G8 as the poor man’s BMW M5, due to similar performance at a much cheaper price. The Holden Ute was scheduled to be launched as the G8 ST before it was cancelled in January 2009 due to GM’s financial situation. It was later announced that the G8 may not see a second generation. Towards the end of the decade many rumors began spreading that Pontiac would become completely reliant on RWD. Reports ranged from a compact sedan based on the Alpha platform to a new RWD G6 for the 2013 model year. 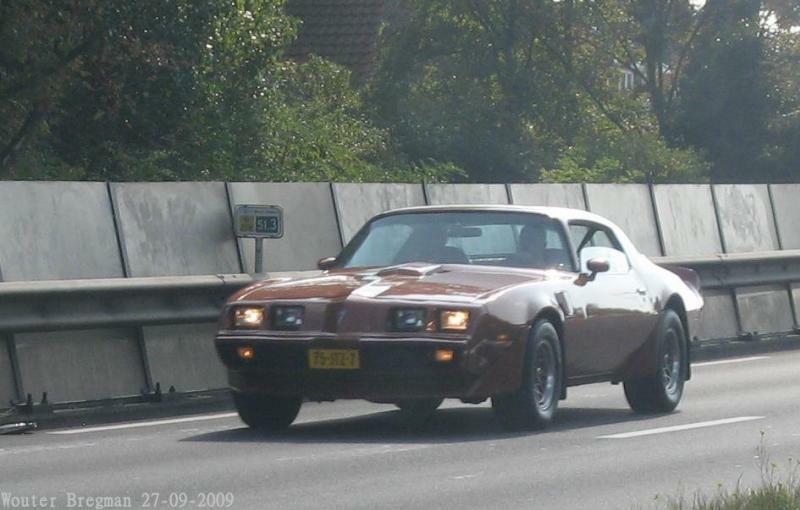 Many reports suggested that the Trans Am/Firebird would return after GM confirmed the rebirth of the Camaro, however, no reports confirmed this. On December 2, 2008, General Motors announced that it was considering eliminating numerous brands, including Pontiac, in order to appease Congress in hope of receiving a 25 billion dollar loan. On February 17, 2009, GM originally proposed the elimination of its Saturn division, the sale of Saab, and either the sale or elimination of Hummer, depending on whether a buyer could be found quickly. 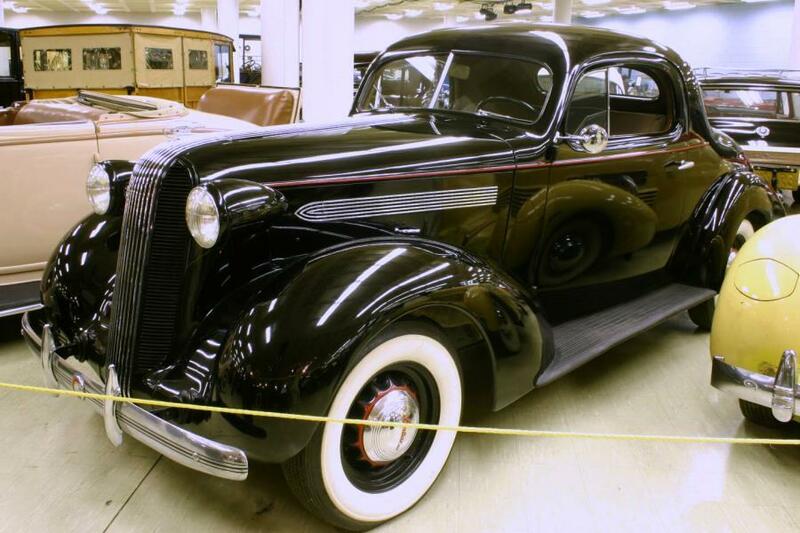 In the original plan GM also clarified that Pontiac would have begun to focus on “niche” models aimed at the “youthful and sporty” segment, but did not provide specifics. 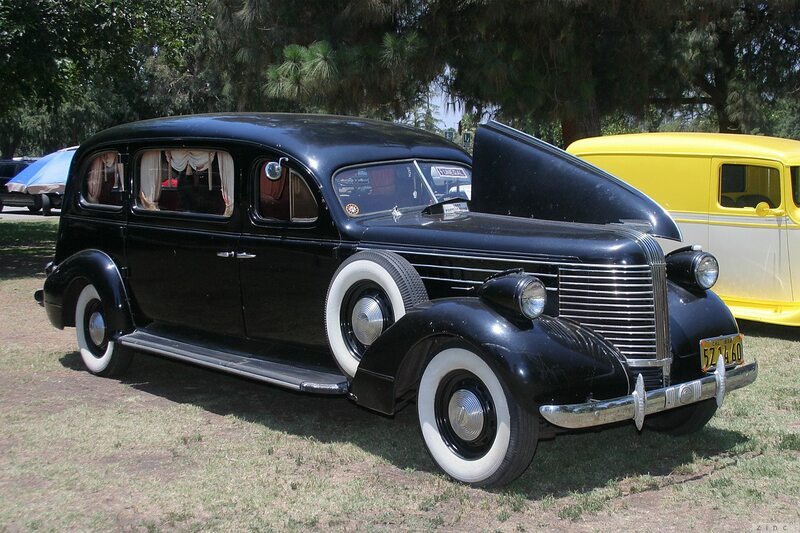 Pontiac was to trim its number of models to four, although there was talk of retaining only one model. 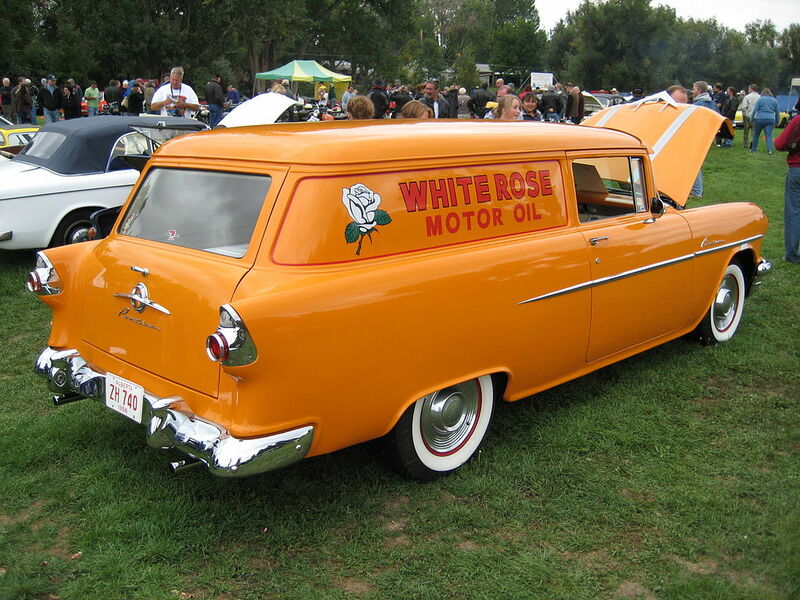 By April 2009 several automotive websites and business publications were reporting that GM was doing a study suggesting it might eliminate the brand altogether, along with sister truck brand GMC. 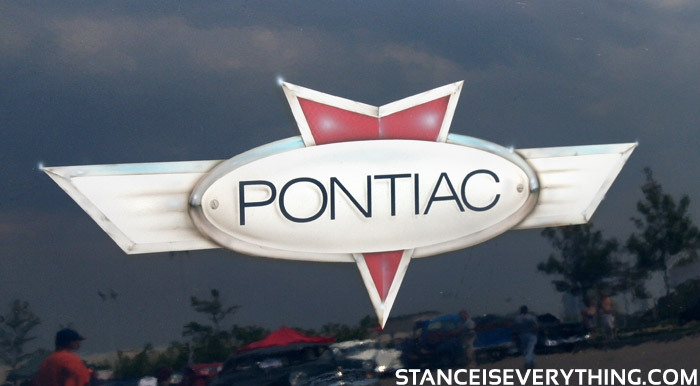 On April 23 a report was published stating the company would be dropping the Pontiac brand while preserving the GMC truck line, as well as the Chevrolet, Cadillac, and Buick brands. 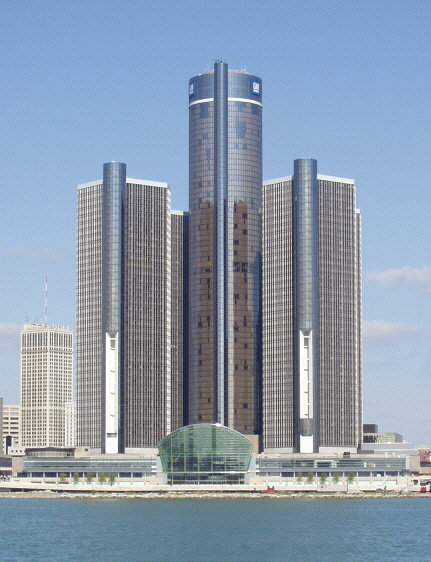 The decision to eliminate Pontiac was made primarily due to the increasing threat of a bankruptcy filing if the June 1 deadline could not be met. 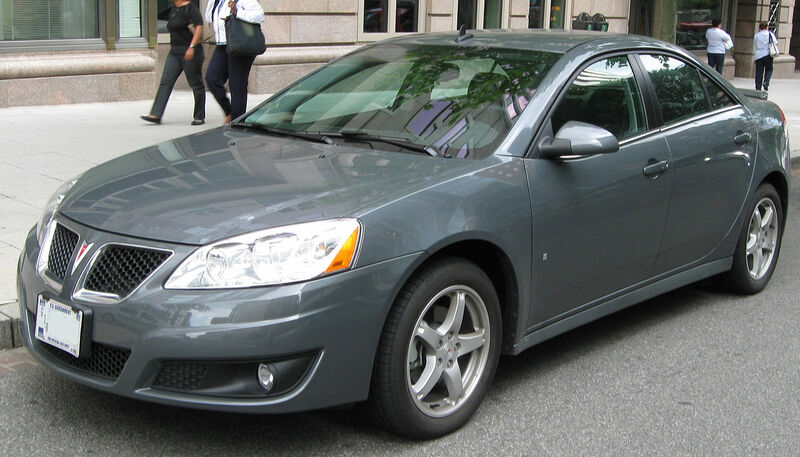 On April 27, 2009, GM officially announced that Pontiac would be dropped and that all of its remaining models would be phased out by the end of 2010. General Motors would eliminate an additional 7,000 to 8,000 factory jobs in the United States and shed 2,600 dealers by 2010 under a revised business plan. 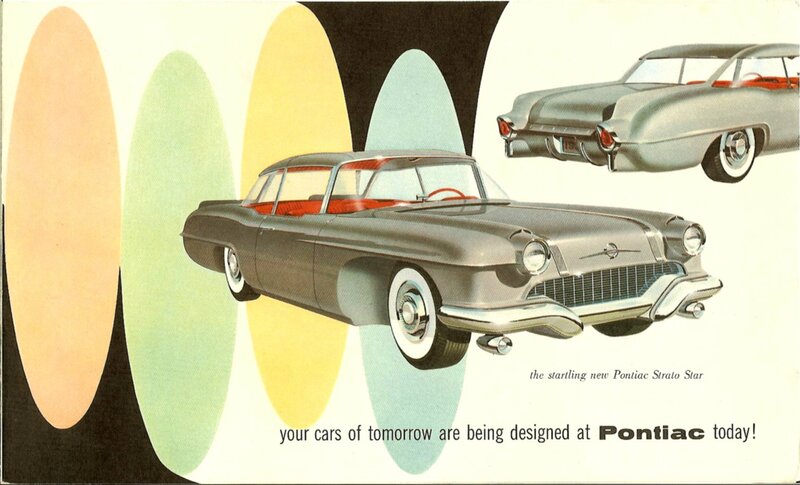 GM Chief Executive Officer Fritz Henderson said the Pontiac brand would be closed by 2010, calling it an “extremely personal decision.” In addition to speeding up decisions on Saturn, Saab and Hummer, GM will be left with four brands – Chevrolet, Buick, GMC and Cadillac. 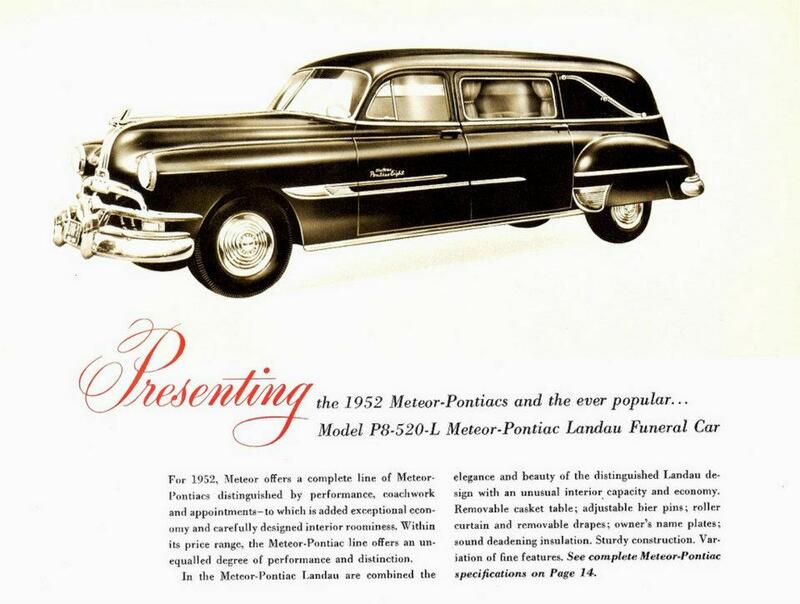 In early May 2009, Jim Waldron, a Davison, Michigan, Pontiac dealer, announced that he was interested in purchasing the Pontiac brand and logos, and had found financing to purchase them as well as some soon-to-be shuttered GM plants in order to build cars. However, GM had already decided to retire the brand as it has begun to sell off its remaining inventory and said that, unlike Saturn, the brand was not for sale. The Pontiac brand was pulled after the 2009 model year in Mexico and the brand was renamed Matiz, selling only one vehicle, the Matiz G2 (Matiz’s logo is similar to Pontiac’s). The last Pontiac, a 2010 model year G6, was built at the Orion Township Assembly Line in December 2009. 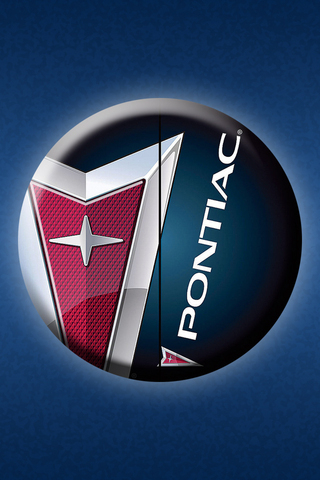 Pontiac became the second brand General Motors has eliminated in six years. 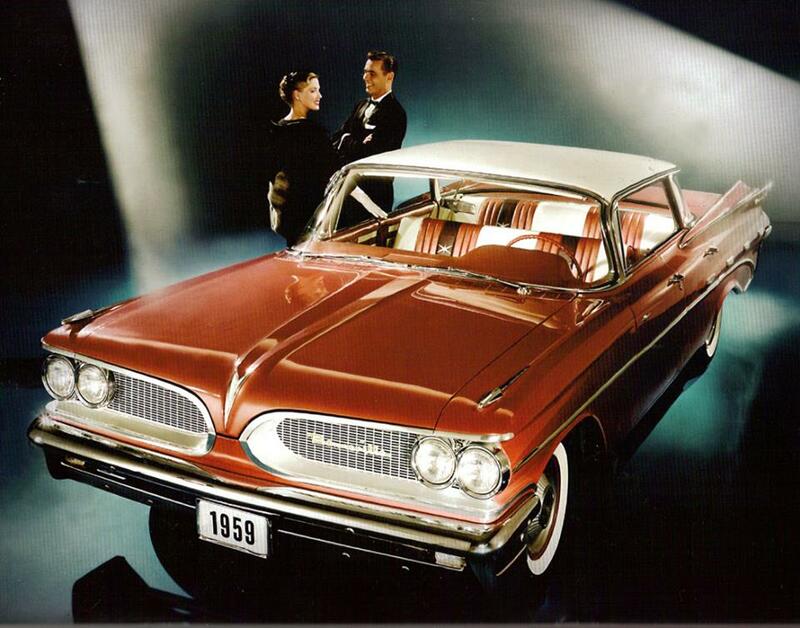 Oldsmobile met the same fate in 2004 after being more slowly phased out over four years. 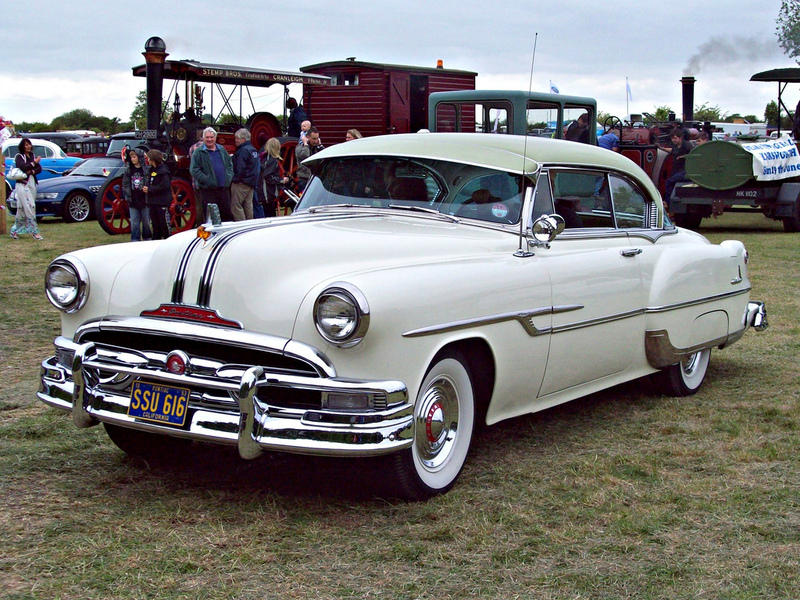 Pontiac also became the ninth North American automobile brand since 1987 to be phased out, after Merkur, Passport, Asüna, Geo, Plymouth, American Motors (AMC) (renamed Eagle in 1988, only to be phased out a decade later), and Oldsmobile. In January 2010, Saab was purchased by the Dutch auto manufacturer Spyker Cars and was renamed “Saab Spyker Cars.” 2010 would also see the end of the Saturn and Hummer brands. A Native American headdress was used as a logo until 1956. 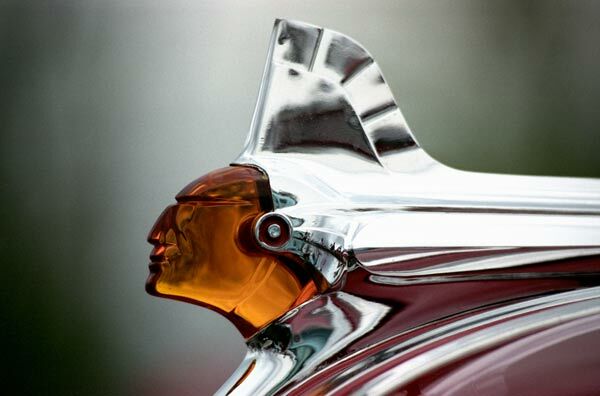 This was updated to the Native American red arrowhead design for 1957. The arrowhead logo is also known as the Dart. 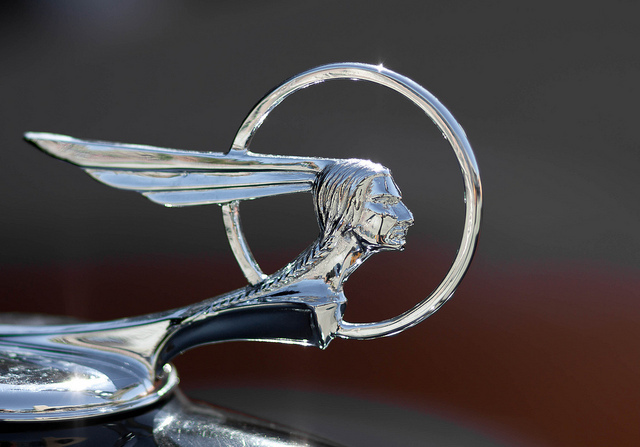 Besides the logo, another identifying feature of Pontiacs were their “Silver Streaks”—one or more narrow strips of stainless steel which extended from the grille down the center of the hood. Eventually they extended from the rear window to the rear bumper as well, and finally; along the tops of the fins. Although initially a single band, this stylistic trademark doubled to two for 1955 – 1956. 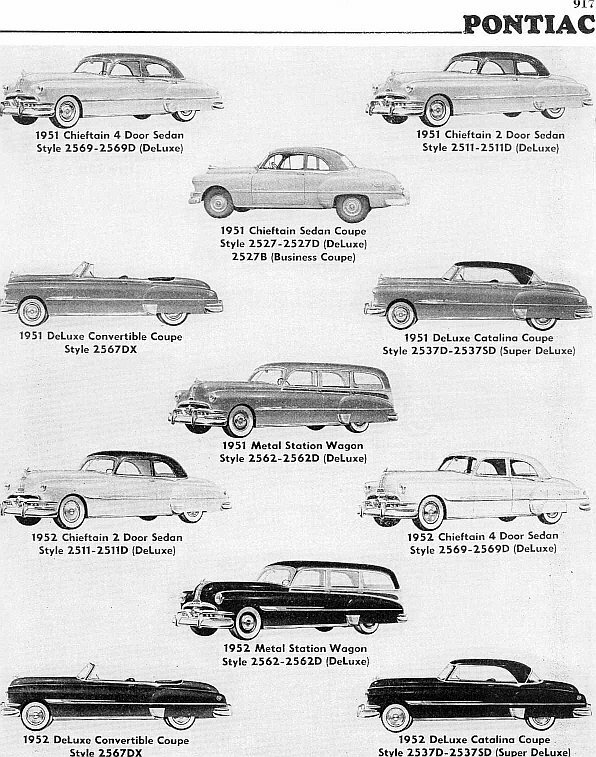 The Streaks were discontinued the same year the Indian Head emblems were; 1957. 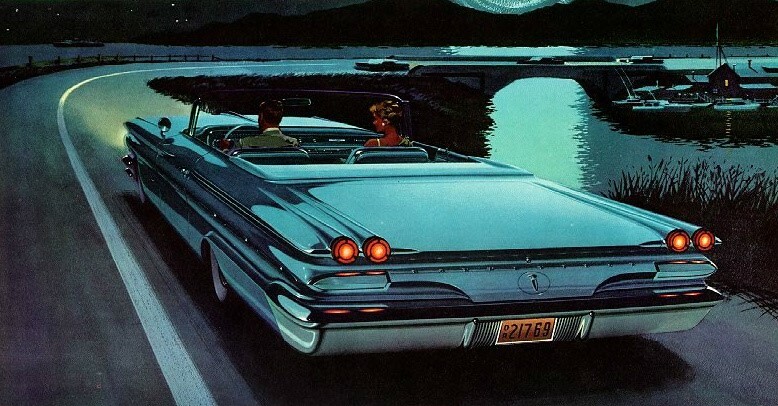 Other long-familiar styling elements were the split grille design (from 1959 onward), pointed ‘arrowhead’ nose (in the 1960s and 70s), and “grilled-over” (in the 1960s), or multiple-striped taillights. This later feature originated with the 1963 Grand Prix, and although the ’62 Grand Prix also had rear grillework, the taillight lenses were not behind it. Less longstanding but equally memorable is the ‘cladding’ common on the doors and fenders of Pontiacs produced in the 1980s and 90s. Rather than minimizing the side bumper, Pontiac designers put two troughs going along the length. Reviews were generally negative but bumpers with this appearance were found on nearly all Pontiacs until the arrival of the G6. From 2004 onwards, new Pontiacs had cleaner, more premium styling, but retained the traditional split grille. 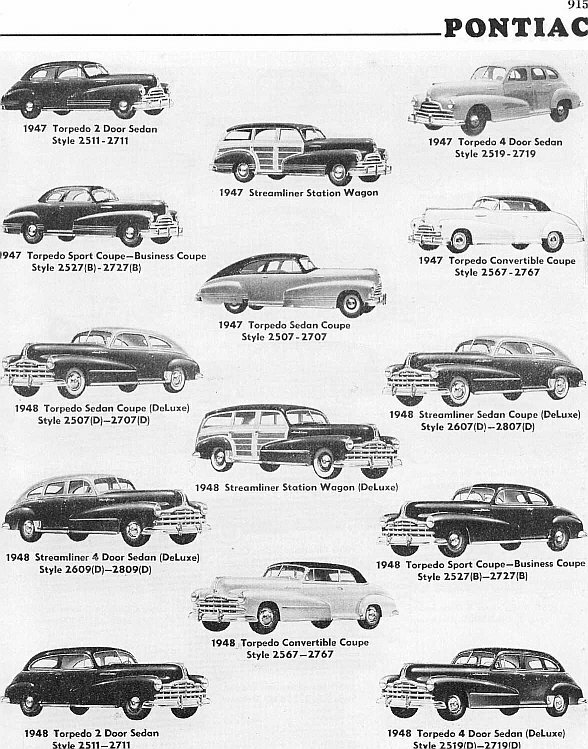 In Canada, the post-WWII Pontiac brand sold well. 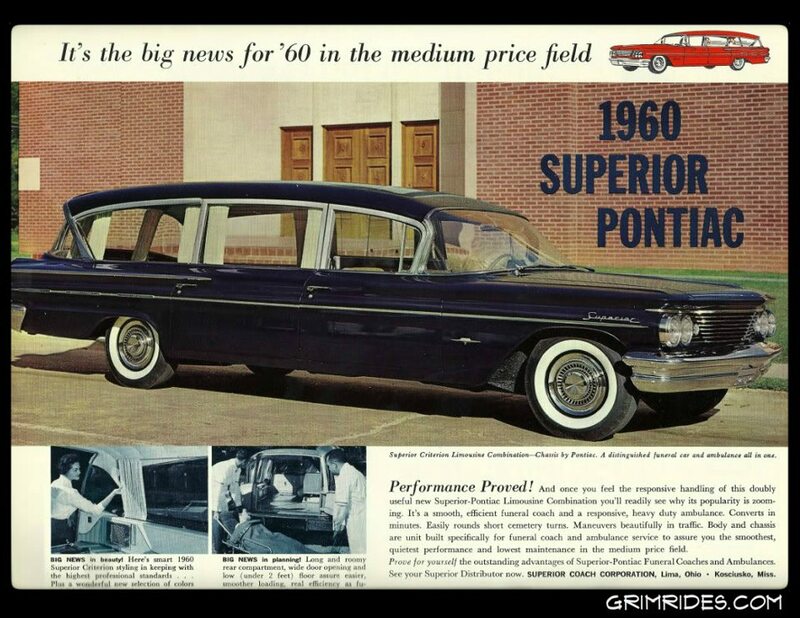 General Motors cleverly offered a line of full-size Pontiac cars that were styled like U.S market models, but were actually Chevrolets under their skins. Model lineup during this period included the base Strato-Chief, midrange Laurentian, and top-of-the-line Parisienne series. 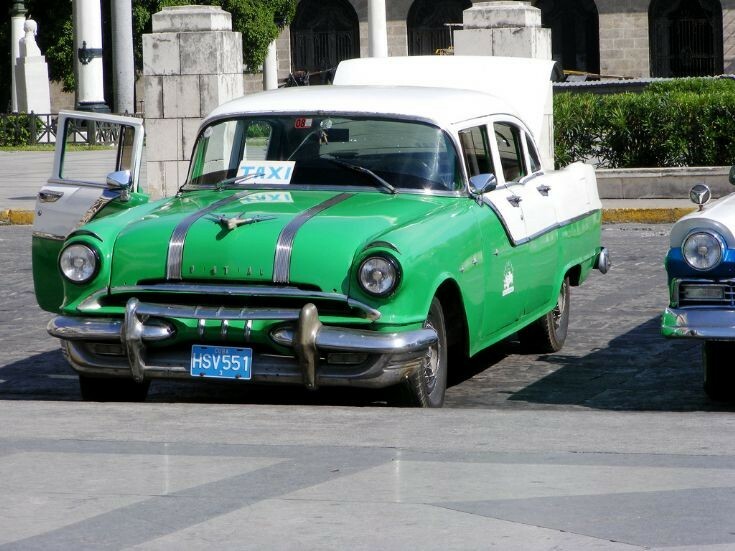 Under their exteriors, however, these cars featured Chevrolet frames, engines, and even dimensions. 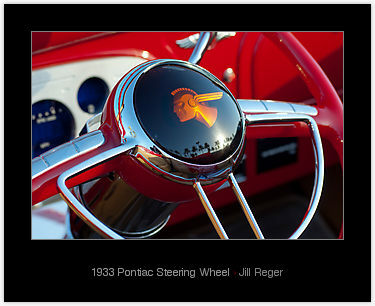 Interiors (except for instrument panels which were Pontiac-based) were a combination of Chevy and Pontiac styling. 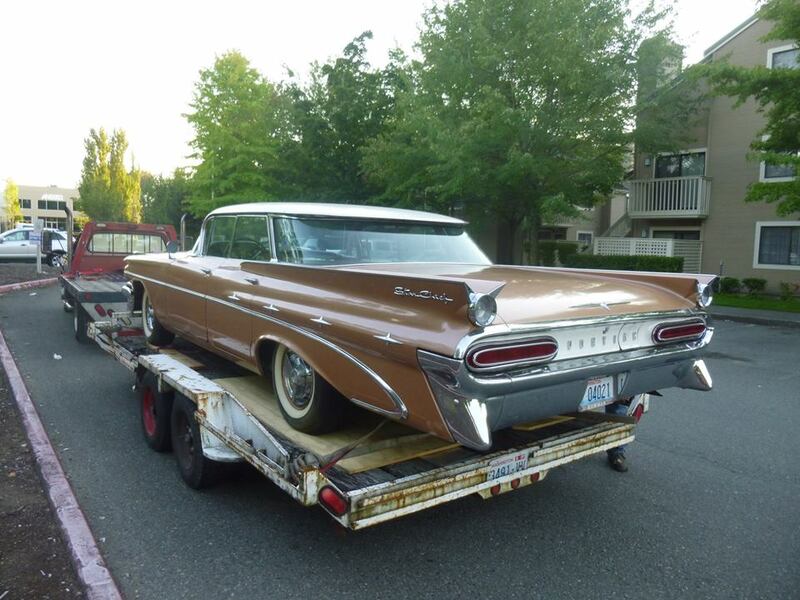 During the early 1960s, Pontiacs featured the controversial “X” frame used on the big Chevys, as well as the complete Chevy lineup of OHV straight Sixes, small-block 283 and 327 cubic inch V8s, and the big-block 348 and 409 V8s. 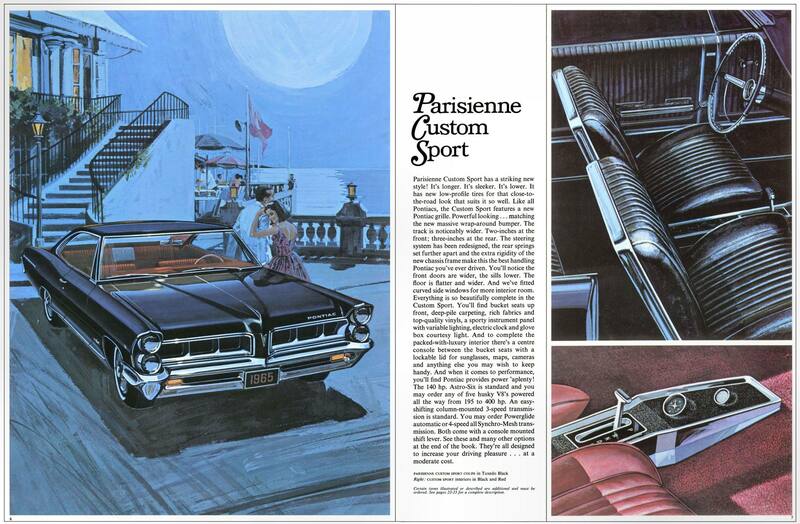 This scheme was used well into the 1980s, and the Caprice-based 1984 and later Parisienne made it into U.S. Pontiac showrooms to replace the recently discontinued Bonneville. This strategy helped keep the price of the cars to a minimum, as was needed in the then less-affluent Canadian marketplace. 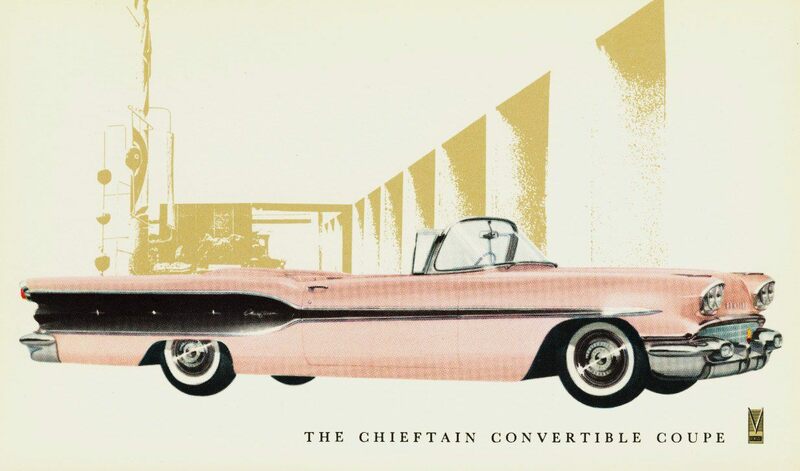 GM of Canada was already building Chevrolets in Ontario; they only needed to stamp Pontiac-styled body skins (these were styled like, but not interchangeable with, US Pontiac body parts) and import Pontiac-specific trim from the United States, to convert these Chevys to Pontiacs. It also reduced the cost of tariffs GM would have needed to pay, had they imported US-market Pontiacs Up North. 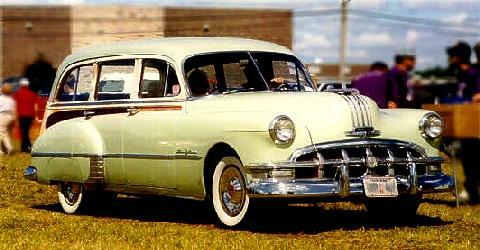 Pontiac dealers in Canada also sold smaller Chevrolet-based cars under the Acadian and Beaumont badges. 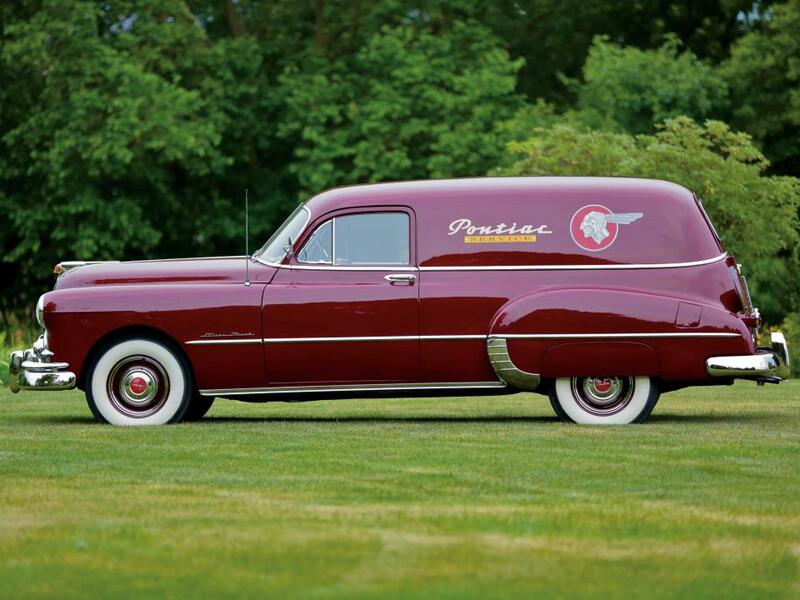 These models are often referred to as Pontiacs, but in fact were never marketed as such, nor did they ever wear Pontiac badges (although the Acadian and Beaumont emblem was in fact, similar to the Pontiac Arrowhead). However, some Chevrolet were badged as Pontiacs later on in Canada. 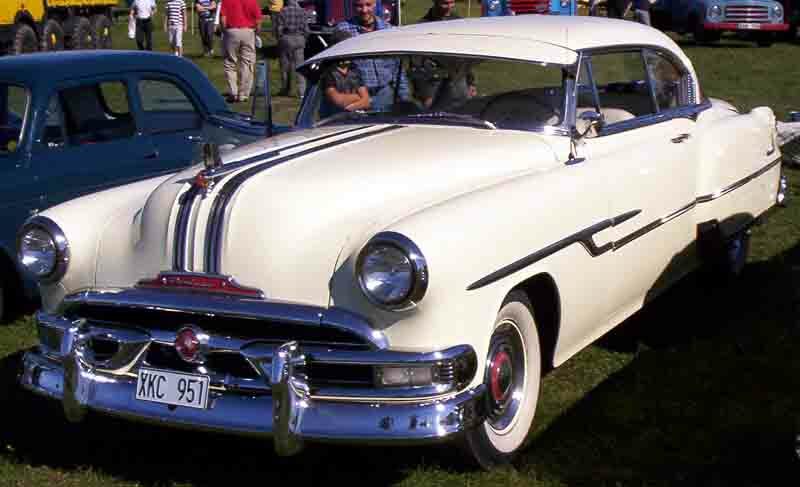 Pontiac began work on a V-8 configuration in 1946. This was initially intended to be an L-head engine, and 8 experimental units were built and extensively tested by the end of the 1940s. 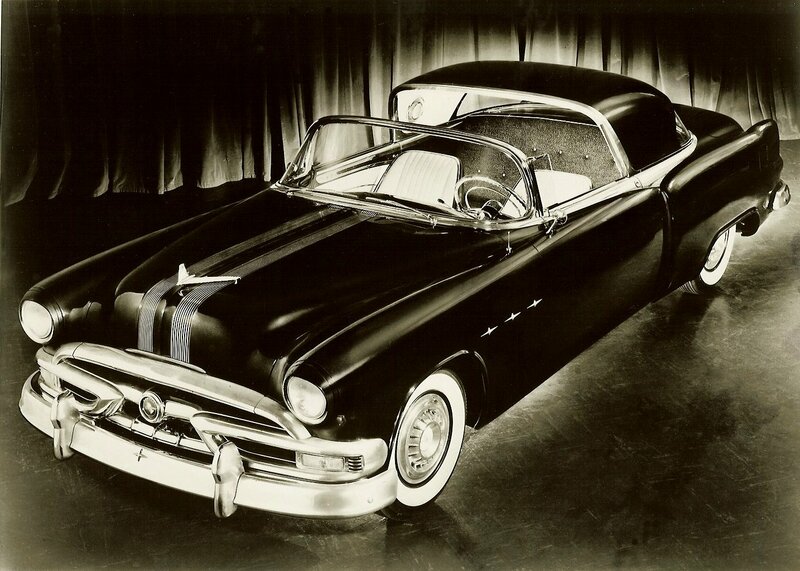 But testing comparisons to the OHV Oldsmobile V-8 revealed the L-head could not compete performance-wise. So, in addition to building a new Pontiac Engineering building in 1949–1951, the decision to re-direct the V-8 to an OHV design delayed its introduction until the 1955 model year.Pontiac engineer Clayton Leach designed the stamped steel valvetrain rocker arm, a simplified and reliable alternative to a bearing-equipped rocker. This design was subsequently picked up by nearly every OHV engine manufacturer at one point or another. 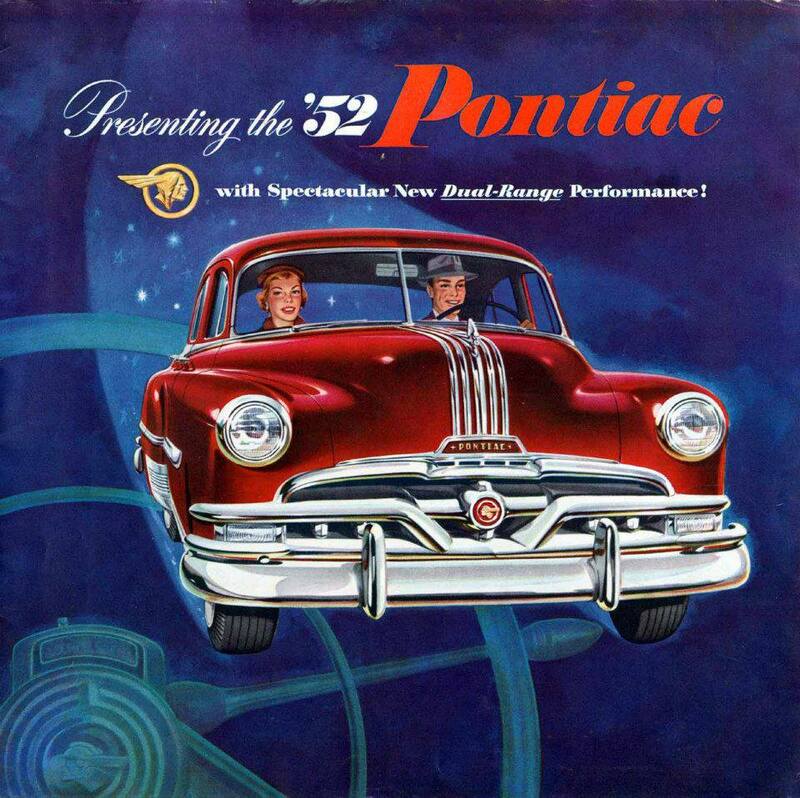 In mid-1956, Pontiac introduced a higher-powered version of its V-8. Among other things, this version of the engine was equipped with a high-performance racing camshaft and dual 4-barrel carburetors. 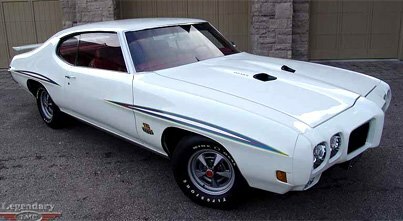 This was the first in a series of NASCAR-ready Super-Tempest and Super-Duty V-8 engines and introduced the long line of multi-carburetor equipped engines that saw Pontiac become a major player during the muscle car and pony car era of the 1960s. 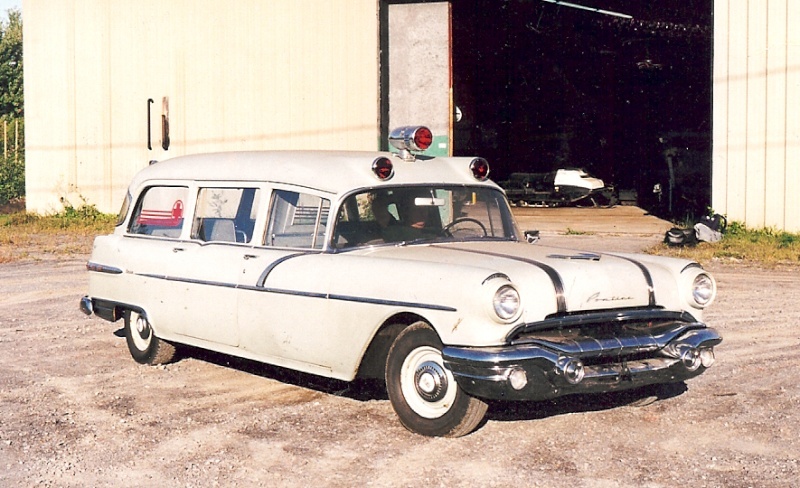 Interestingly, the enlarged 1956 Pontiac V8 found its way into light-duty GMC pickup trucks. Pontiac’s second generation V-8 engines shared numerous similarities, allowing many parts to interchange from its advent in 1959 to its demise in 1979. Sizes ranged from 265 cubic inch to 455 cubic inch. This similarity (except the 301 & 265) makes rebuilding these engines relatively easier. 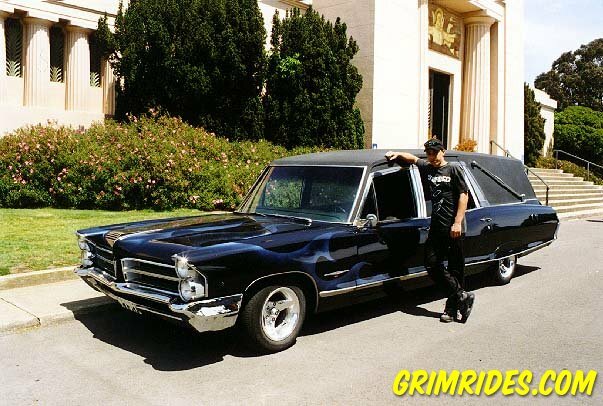 This feature also made it possible for Pontiac to invent the modern muscle car, by the relatively simple process of placing its second largest-displacement engine, the 389 cid, into its mid-size car, the Le Mans, creating the Pontiac GTO. 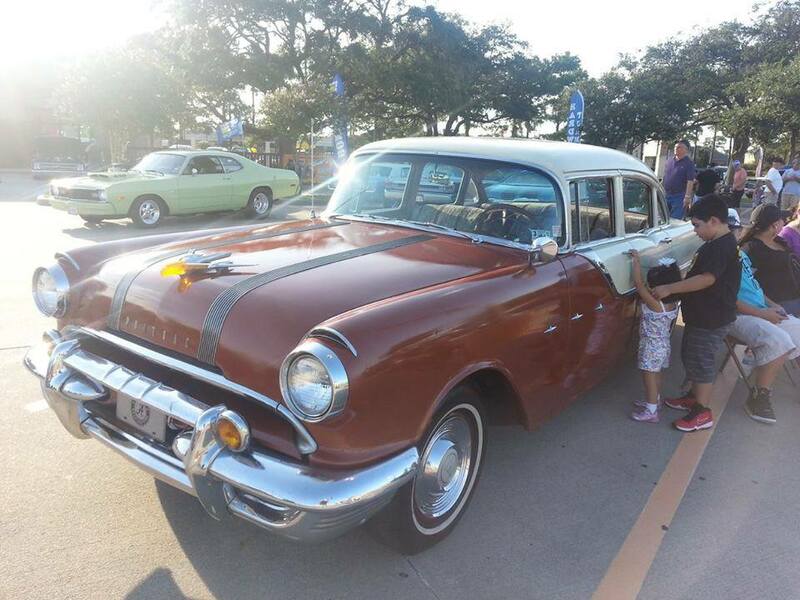 From their inception in the 1950s until the early 1970s, Pontiac engines were known for their performance. The largest engine was a massive 455 cubic inch V-8 that was available in most of their mid-size, full-size and sports car models. 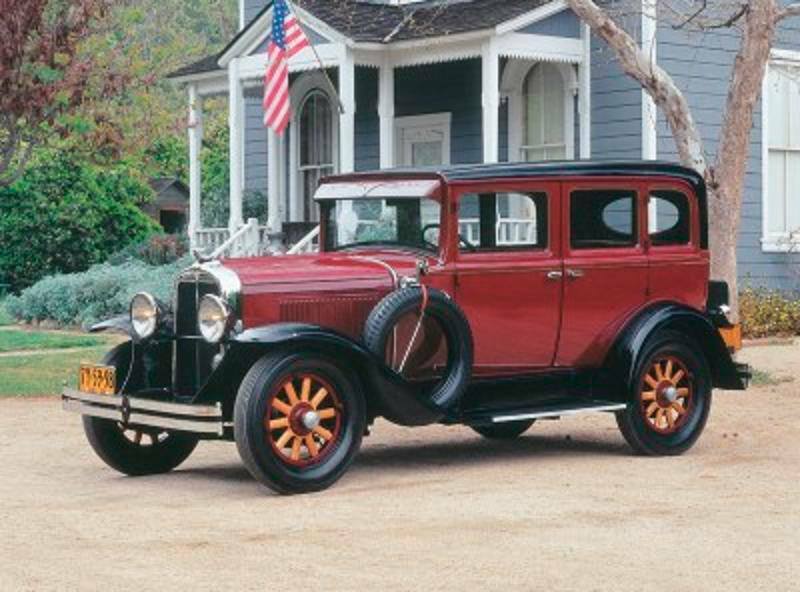 At the height of the horsepower era, Pontiac engines reached a powerful 390 rated horsepower (SAE gross), though other engines achieved considerably higher outputs in actuality. 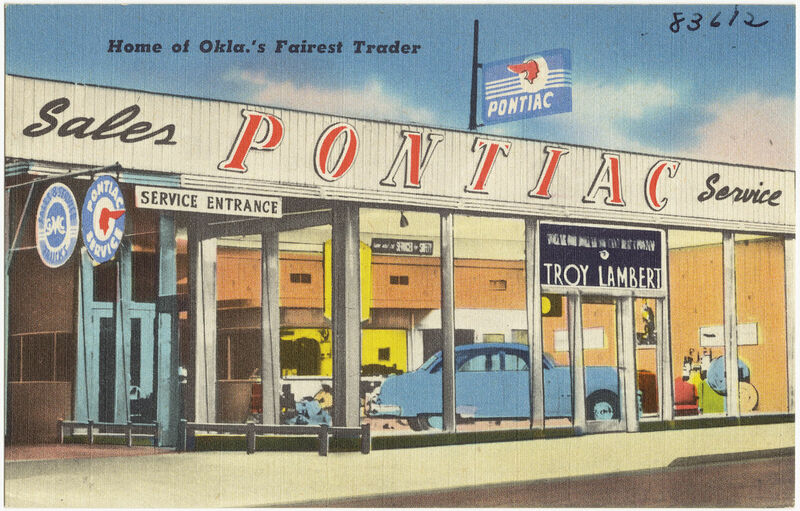 Federal emissions laws eventually brought the horsepower era to a close and resulted in a steady decline for Pontiac’s engines. 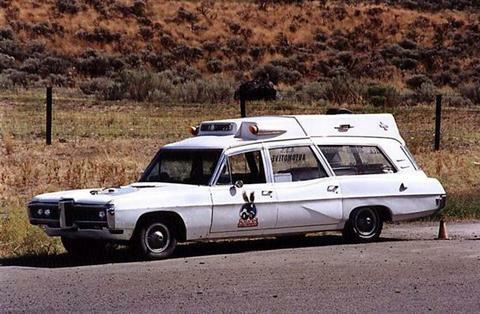 One holdout to this industry-wide slide was the Super Duty 455 engine of 1973–1974. 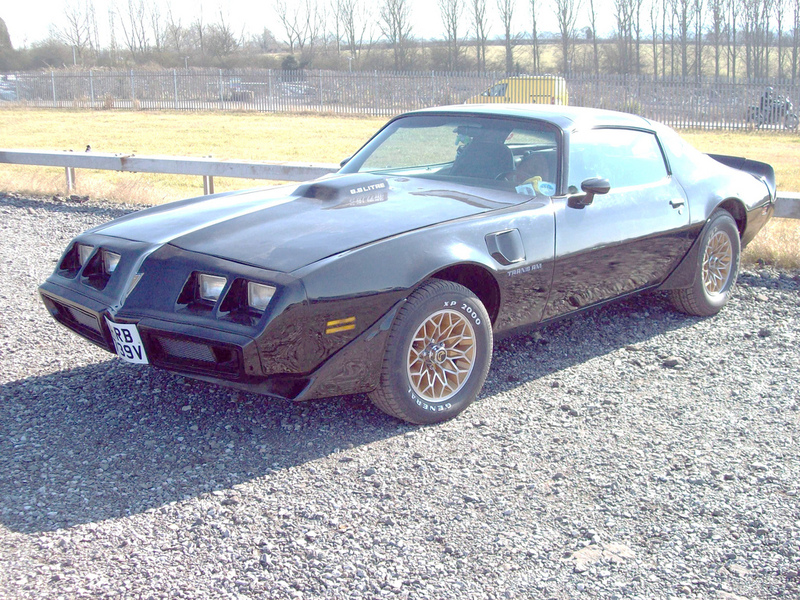 Available only in the Firebird Formula and Trans Am models, this was rated at 310 hp (230 kW) net initially but after having issues passing EPA emissions tests, the camshaft was changed to the old RA III cam and with the change, came a 290 hp (220 kW) net rating. The engine was the pinnacle of Pontiac engine development and was a very strong performer that included a few race-specific features, such as provisions for dry-sump oiling. This engine and its legacy drive the SD Trans Ams and Formulas as one of the more, if not the most, desirable Pontiacs ever produced. The only non-traditional Pontiac V-8 engines were the 301 cubic inch and the smaller displacement 265 cubic inch V-8s. Produced from 1977 through 1981, these engines had the distinction of being the last V-8s produced by Pontiac; GM merged its various brands’ engines into one collectively shared group in 1980, entitled General Motors Powertrain. Interestingly, the 301 had a 4-inch (100 mm) bore and 3-inch (76 mm) stroke, identical to the vaunted Chevrolet small-block engine and Ford Boss 302 engine. Pontiac engines were not available in Canada, however, but were replaced with Chevrolet engines of similar size and power, resulting in such interesting and unusual (at least to American car fans) models as the Beaumont SD-396 with a Chevrolet big-block 396 cubic inch V-8. The Tri-Power setup included one center carburetor with idle control and two end carburetors that did not contribute until the throttle was opened more than half way. This was accomplished two ways, mechanically for the manual transmission models, and via a vacuum-switch on the automatics. 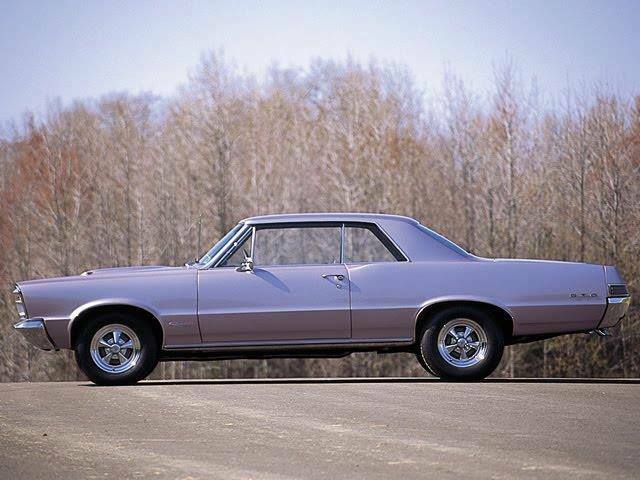 This went through various permutations before being banned by GM as a factory installed option in 1967, and totally in 1968.PMD originally used Carter 1-barrel carburetors for many years, but by the time of the second generation V-8 engines had switched mostly to 2-barrel offerings. These also were the basis for the Tri-Power setups on the engines. PMD also had a square-bore 4-barrel at the time, but this was rated at a lower power than the Tri-Power. This carburetor was later replaced by the Quadrajet, a spread bore. ‘Spread-bore’ refers to the difference in sizes between the primaries and secondaries. 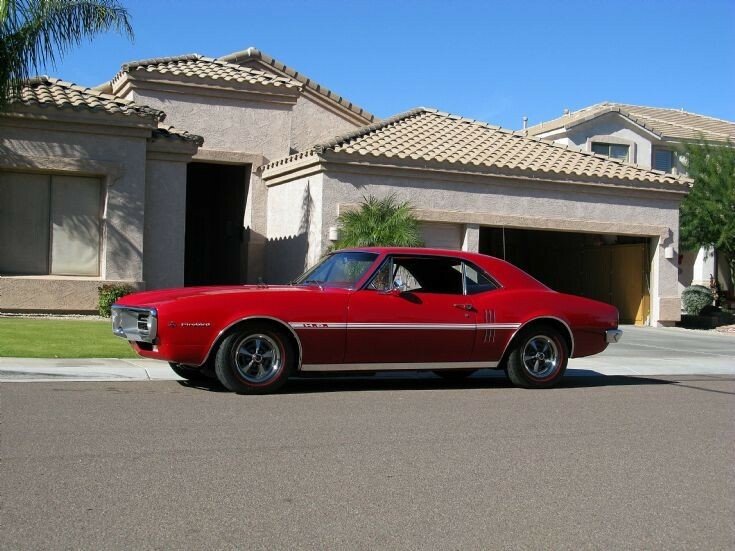 By the end of the muscle car era, the Quadrajet setup had become the nearly ubiquitous choice on PMD engines, due to its excellent economy and power characteristics. While Quadrajets have been occasionally derided as being poor performers, with proper understanding and tuning it can compete at most levels with other designs short of the full race inspired set-ups such as the Holley Double-Pumpers, which incorporated accelerator pumps on the primary and secondary carburetor circuits. This Quadrajet design proved good enough to last until 1990 (Oldsmobile V8 applications), with added computer controls in order to meet federal and CARB standards. world, soon after starting it broadly within the United states and You.K. for instant online messaging interaction (no video and voice yet, all those call for a plug-in installment).